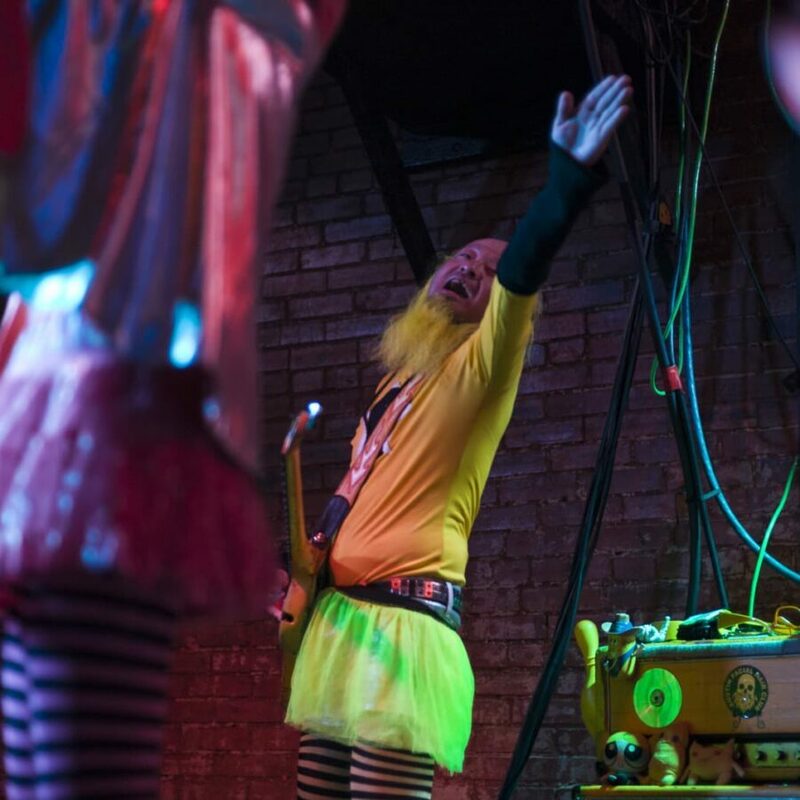 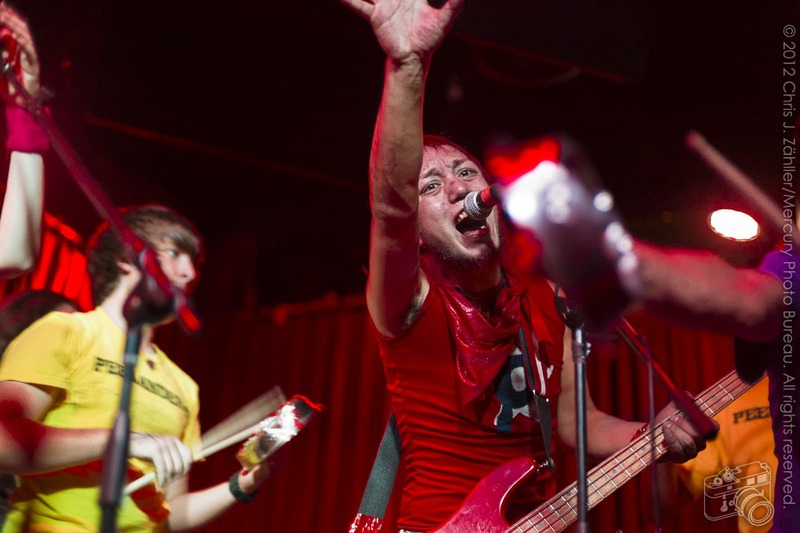 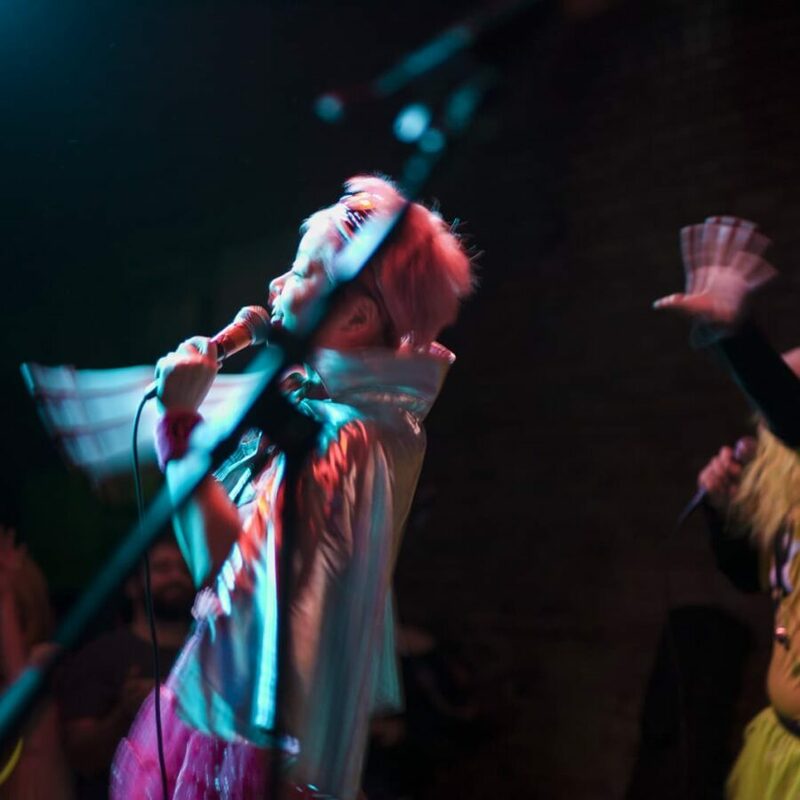 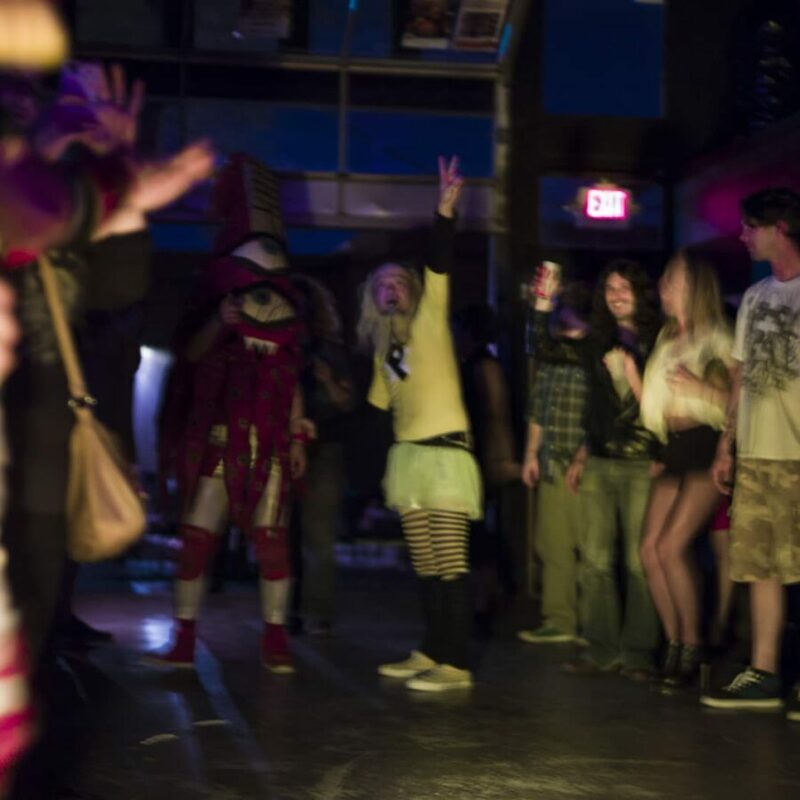 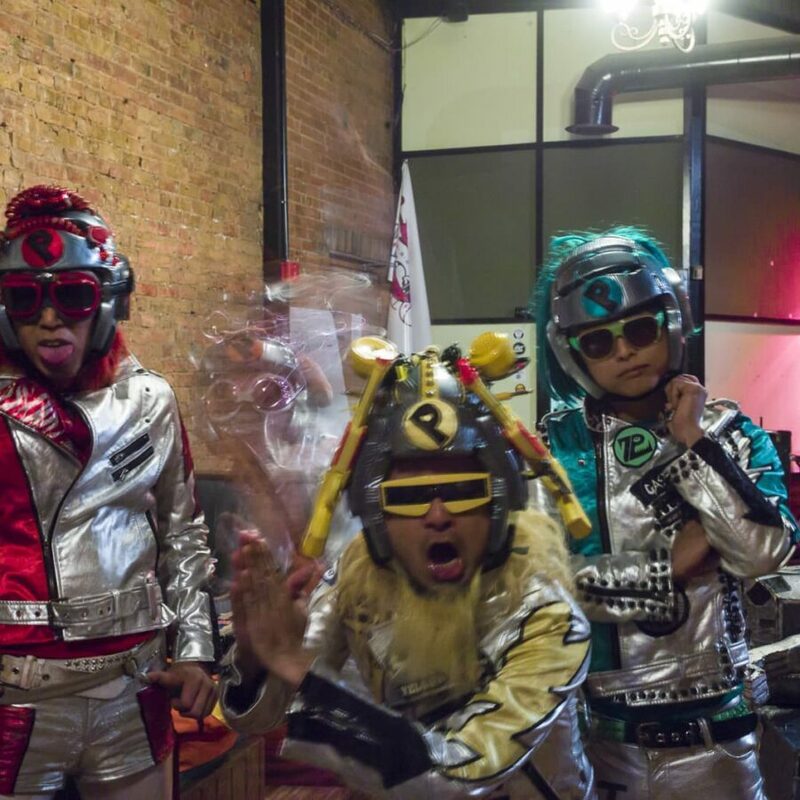 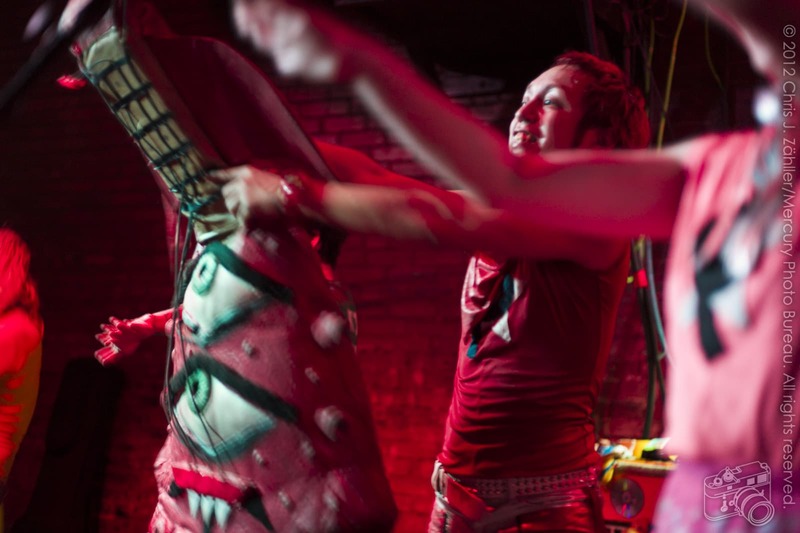 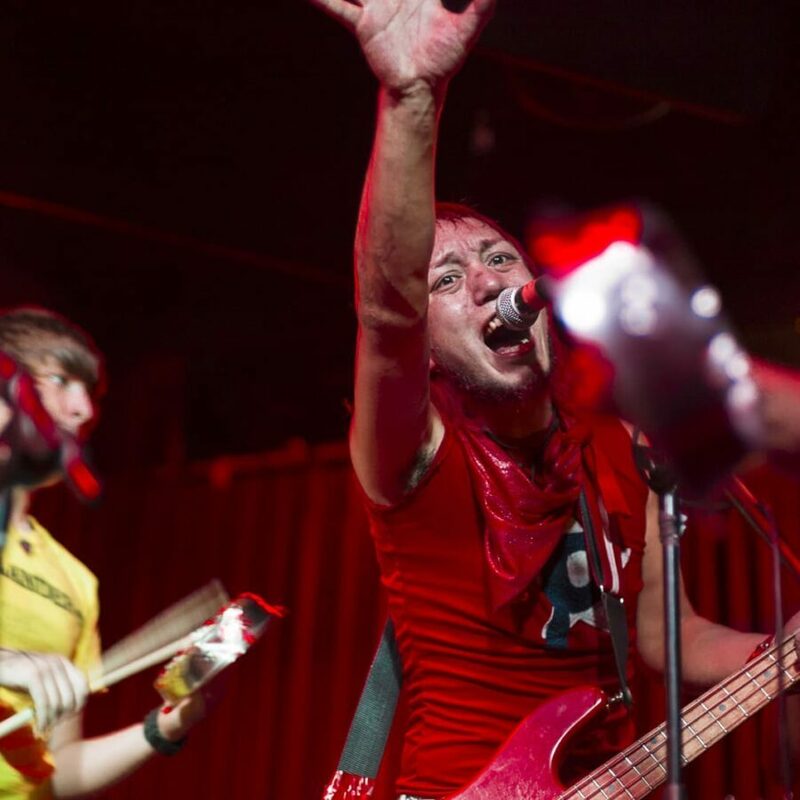 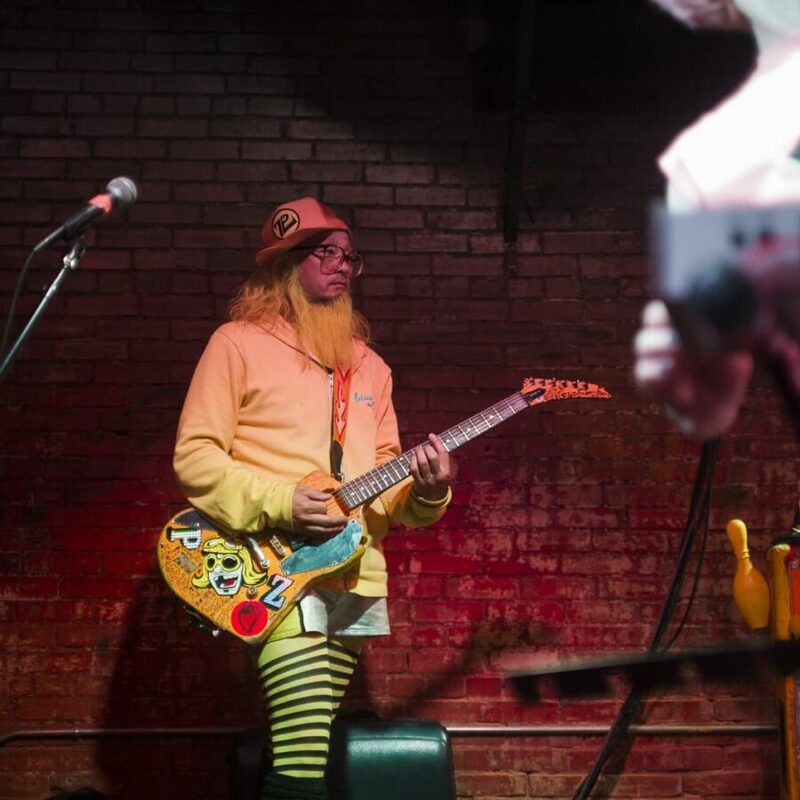 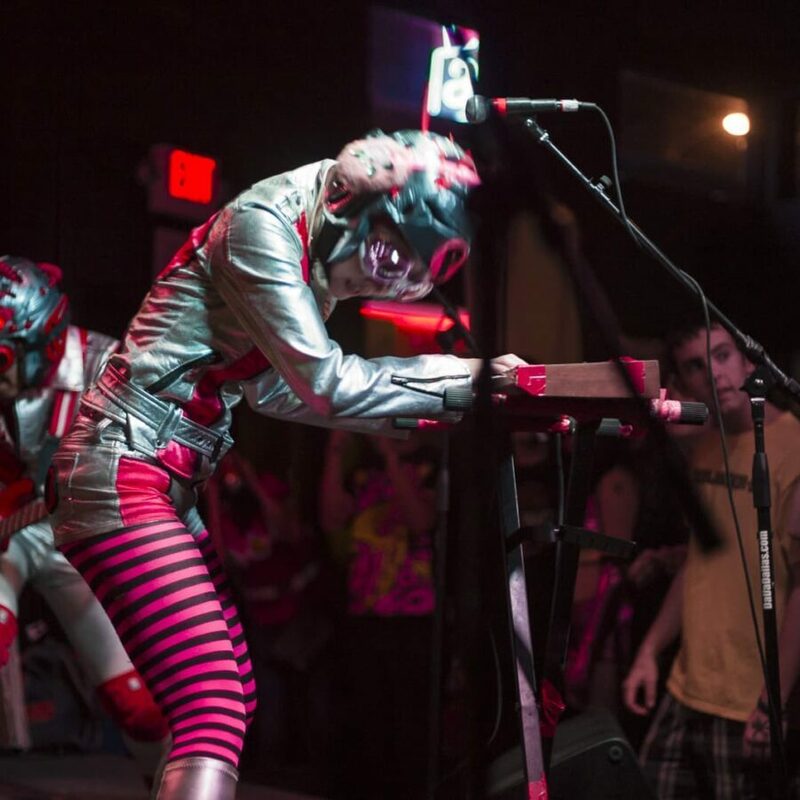 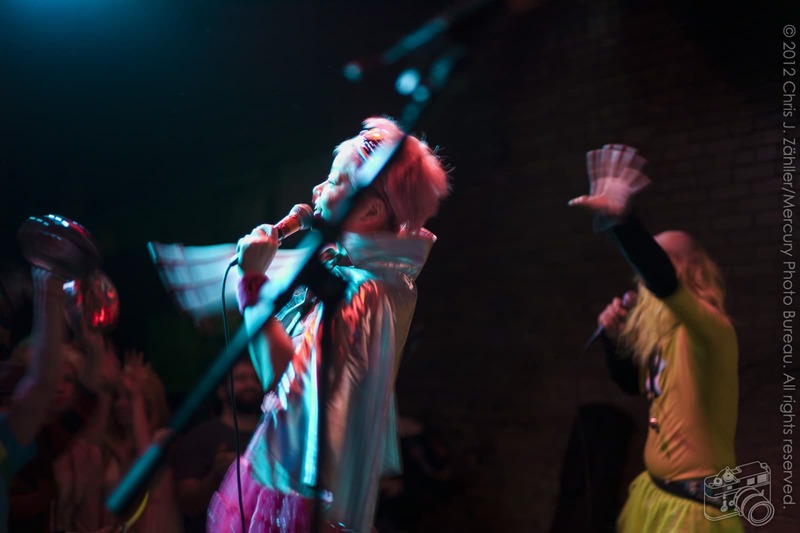 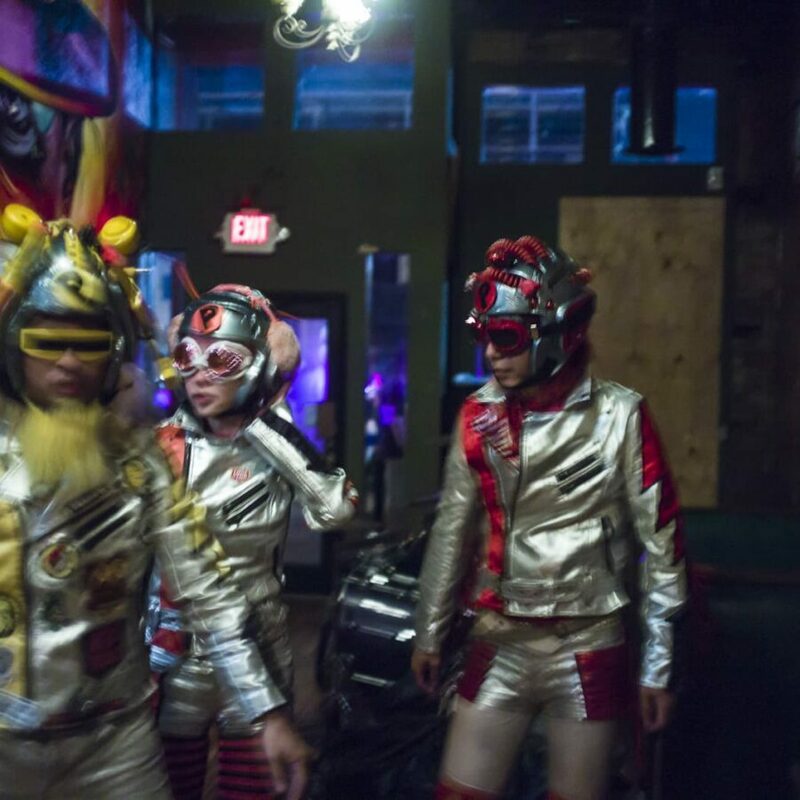 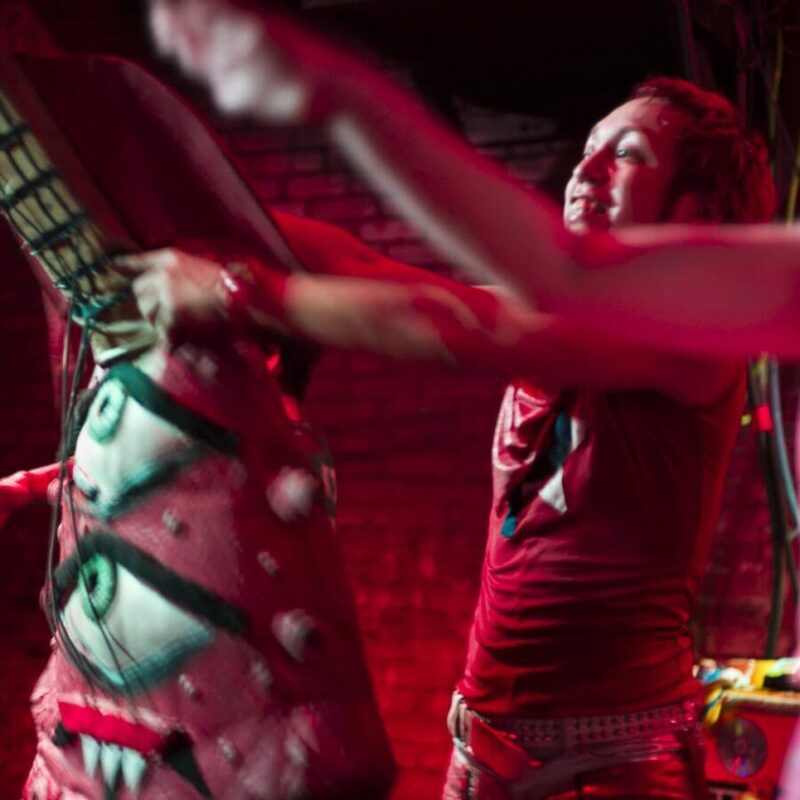 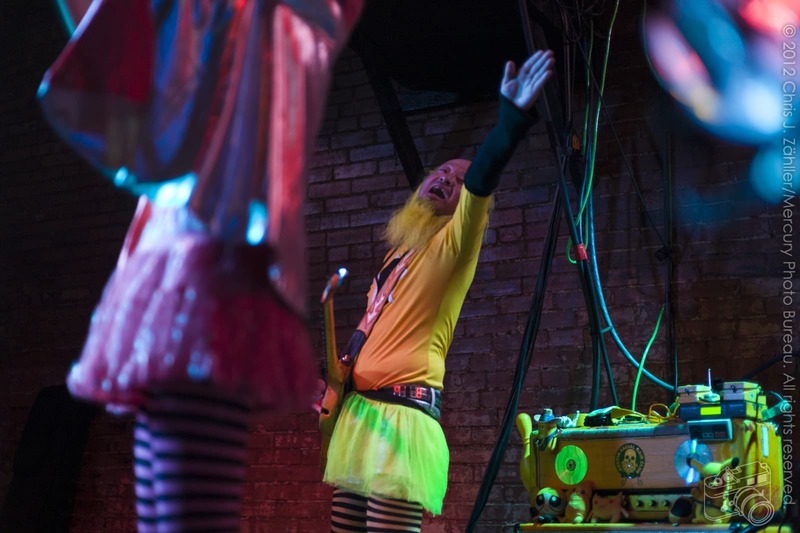 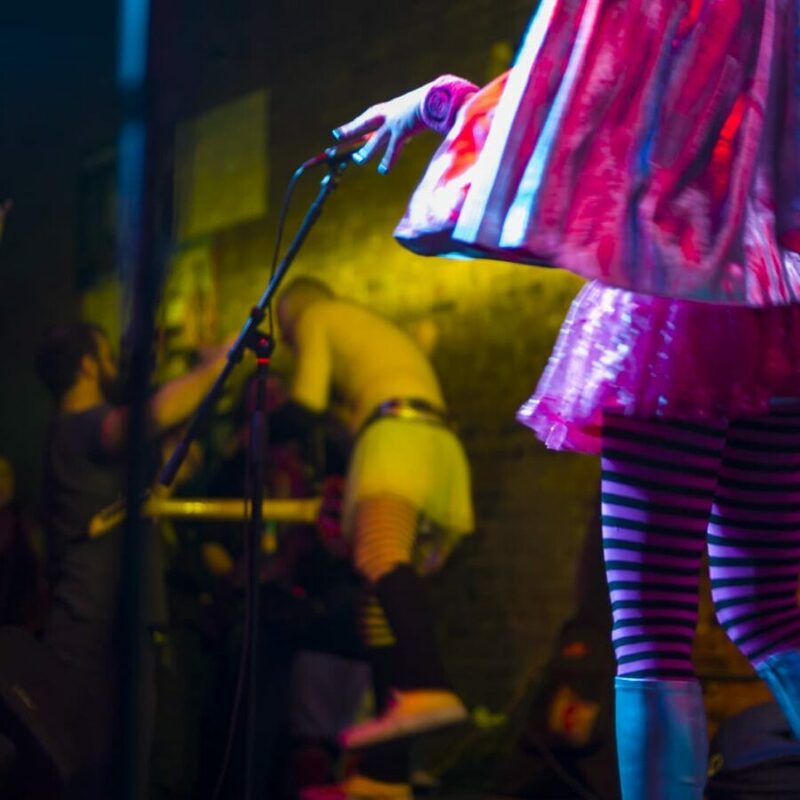 Hail­ing from District Z on Planet Peelander, self-described Japanese action comic punks Peelander-Z trav­eled across the galaxy to eat our smiles at Club Dada in Dallas’s Deep Ellum on Hallowe’en. 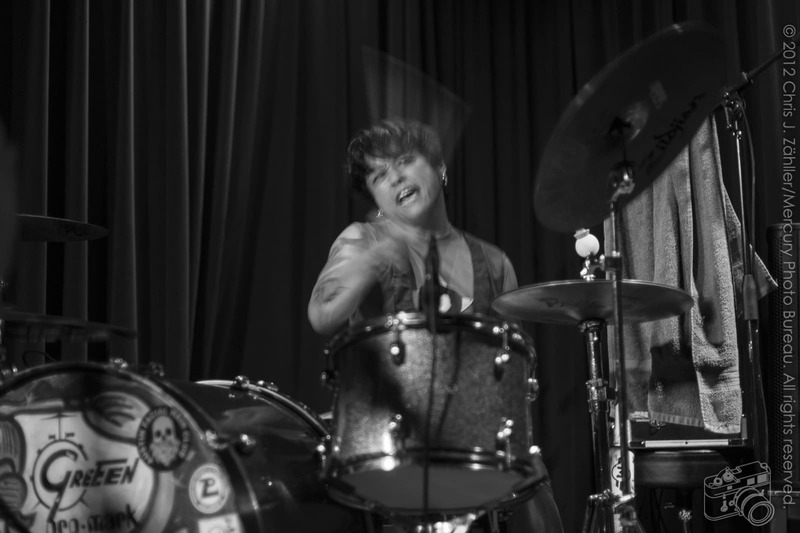 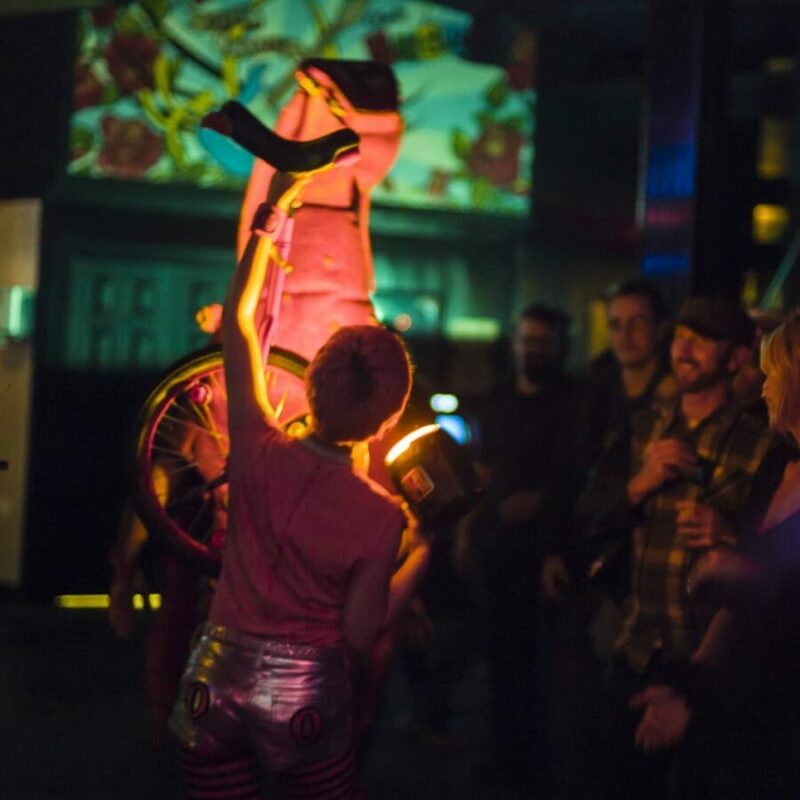 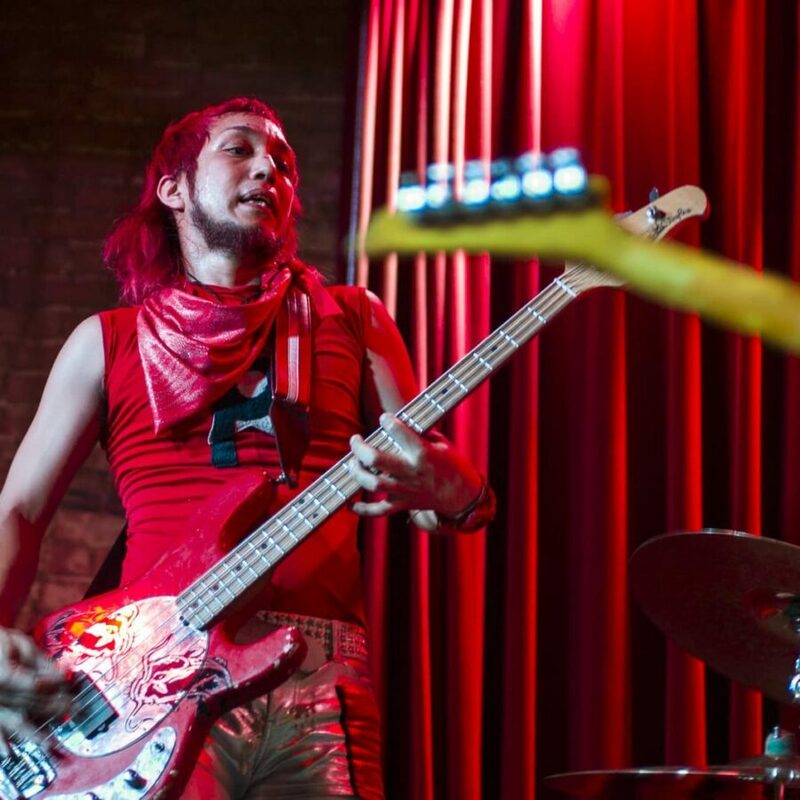 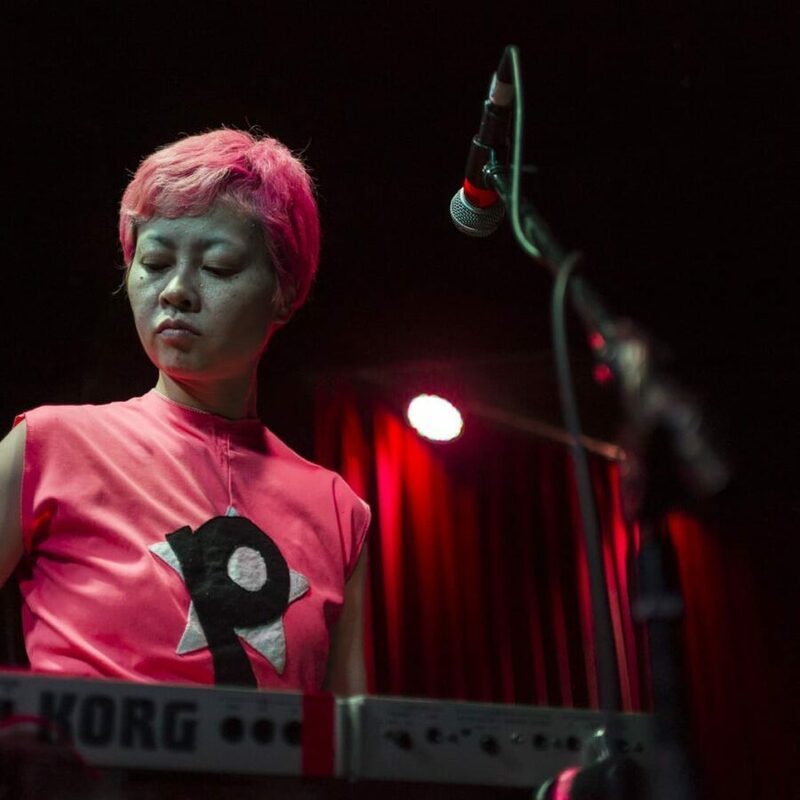 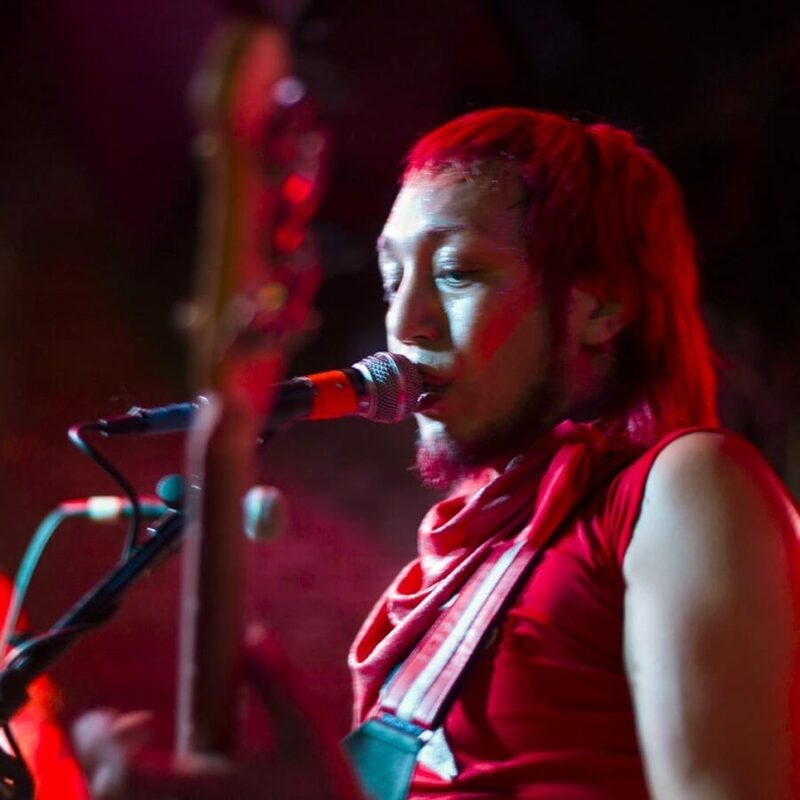 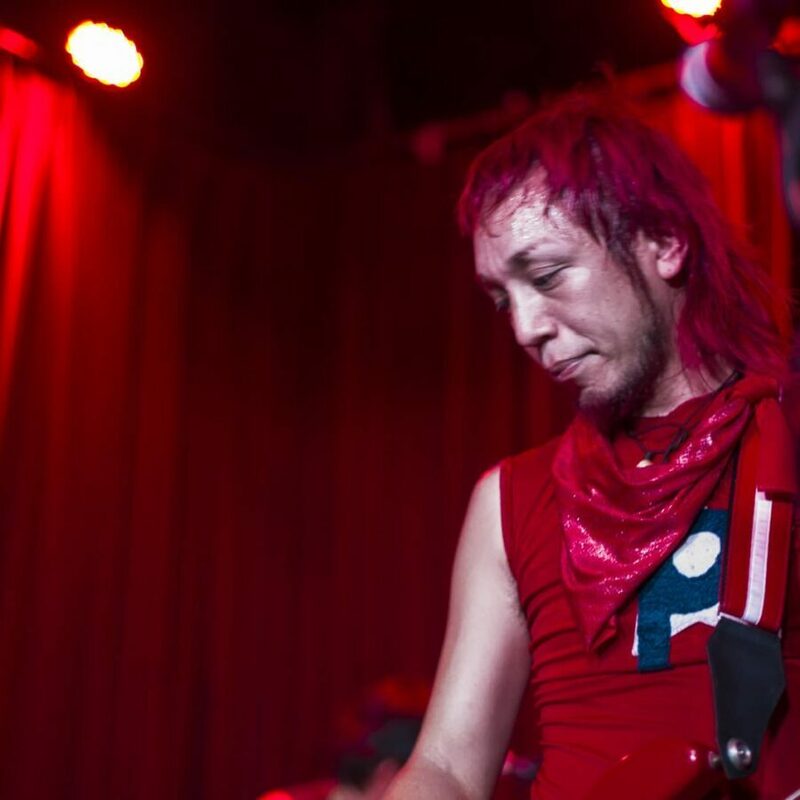 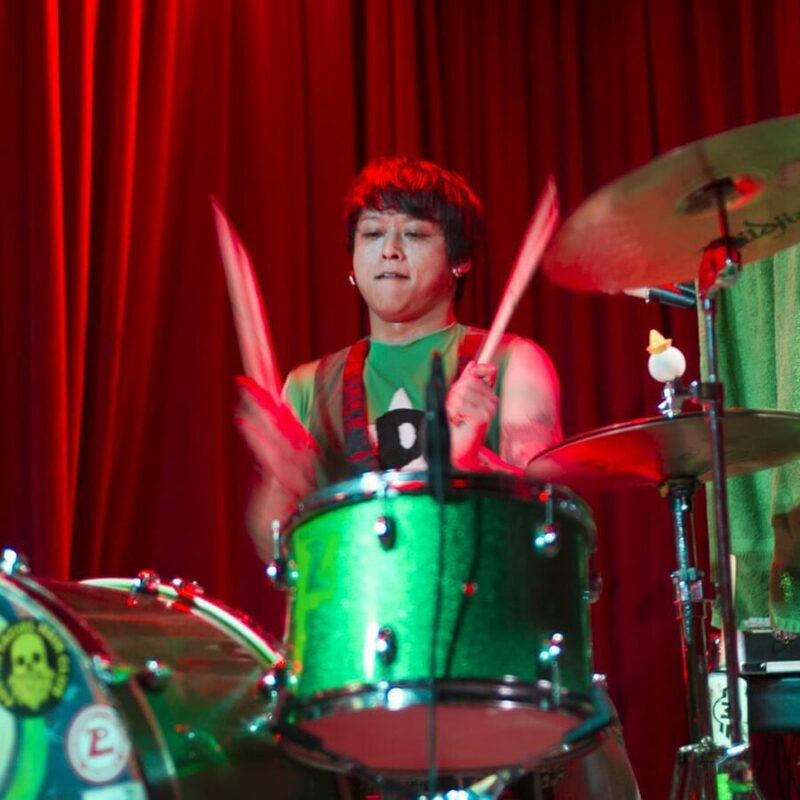 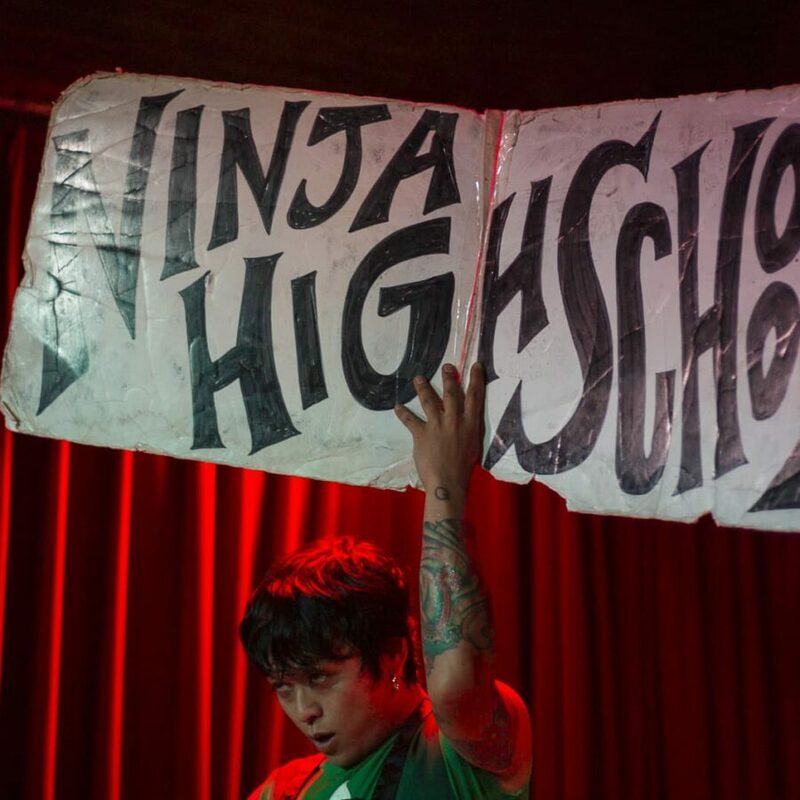 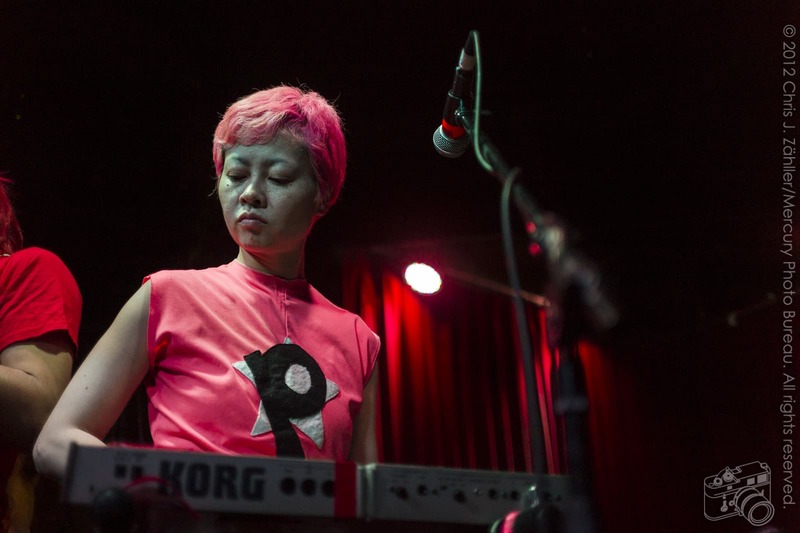 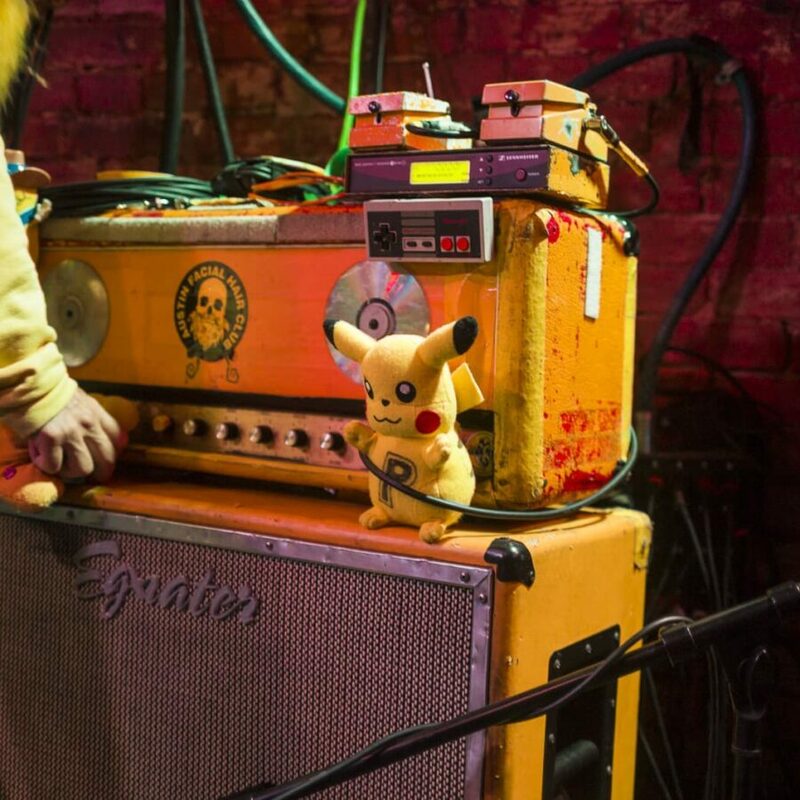 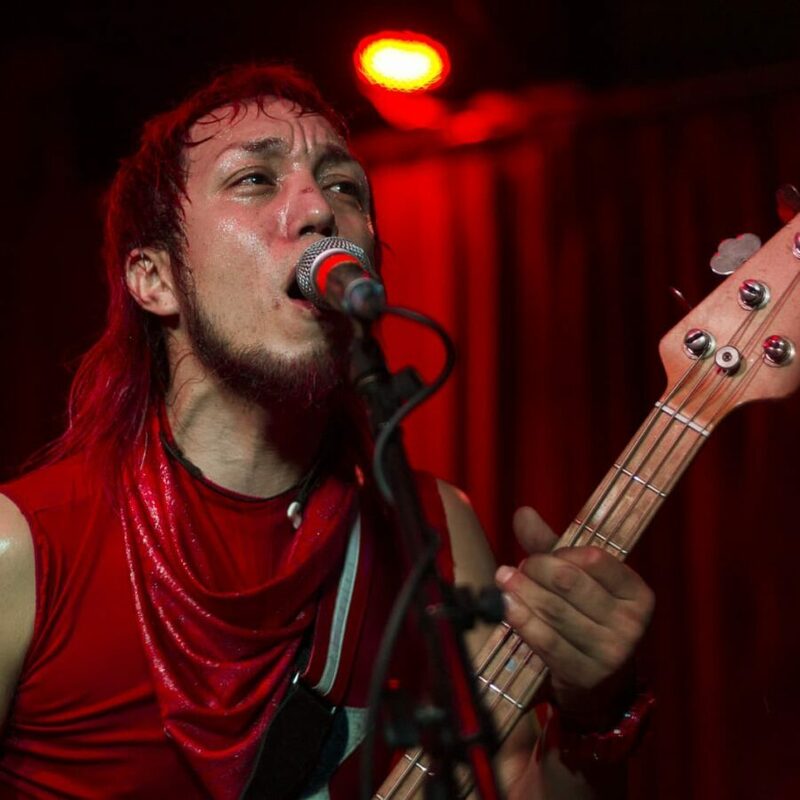 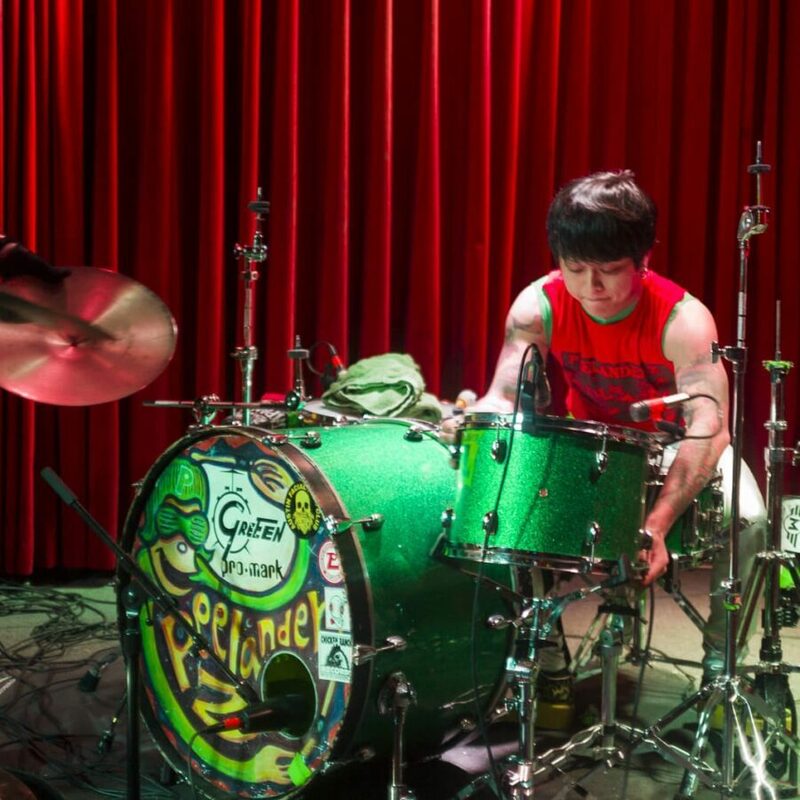 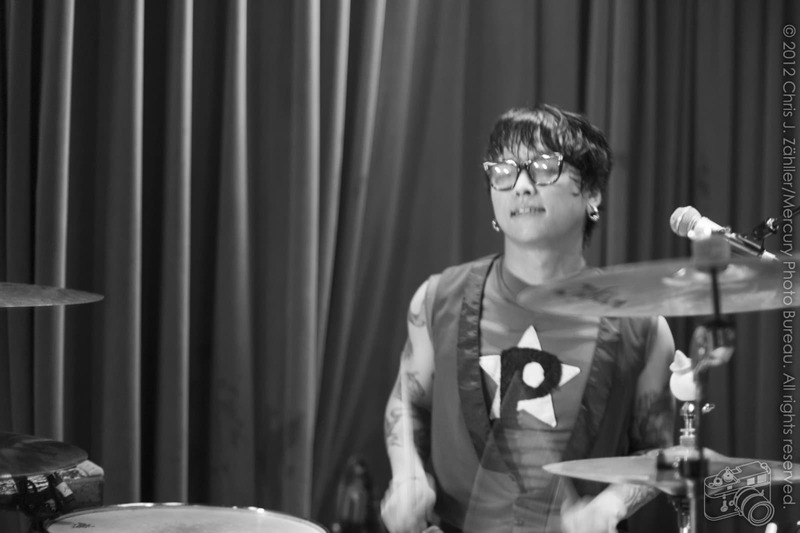 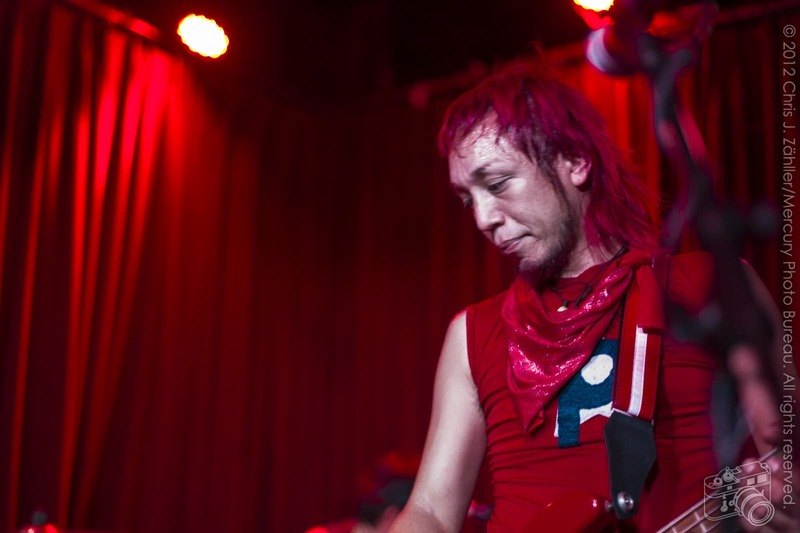 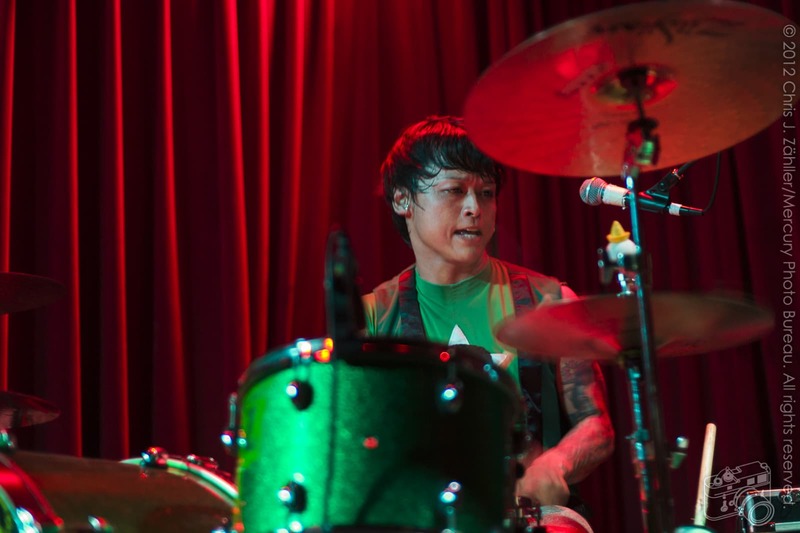 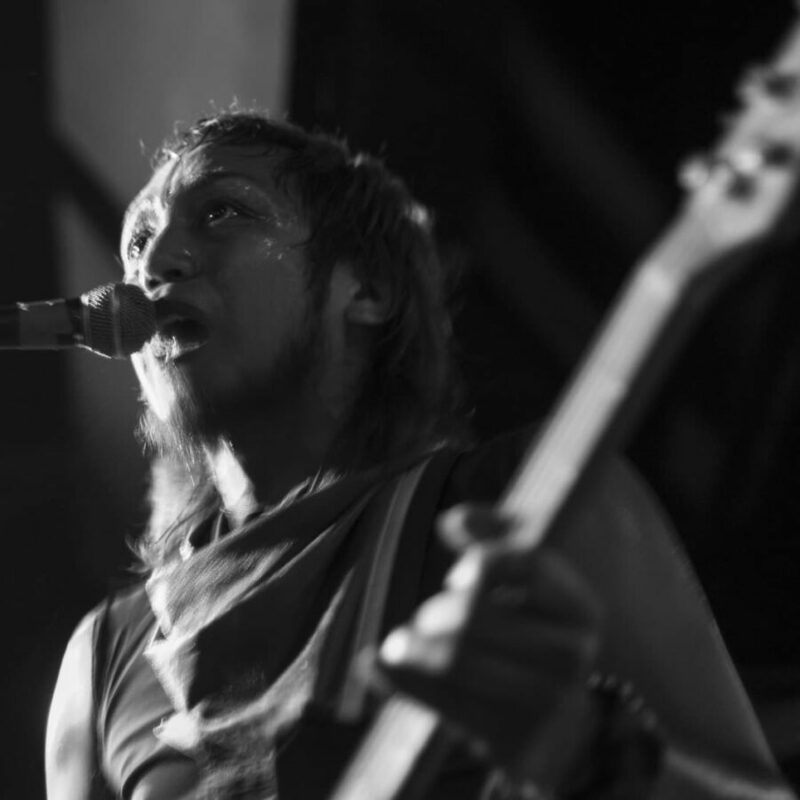 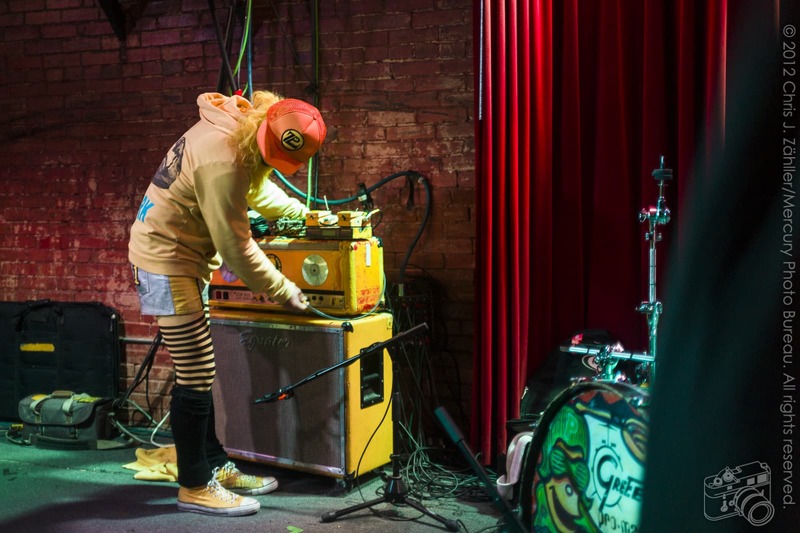 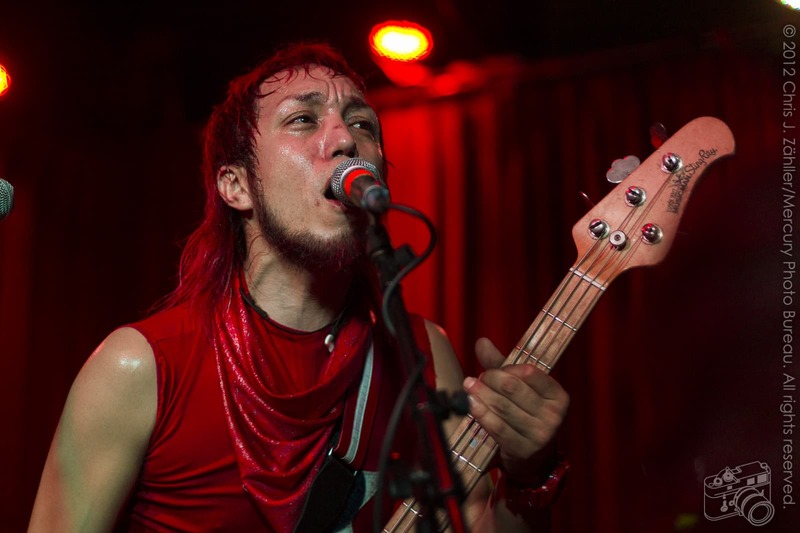 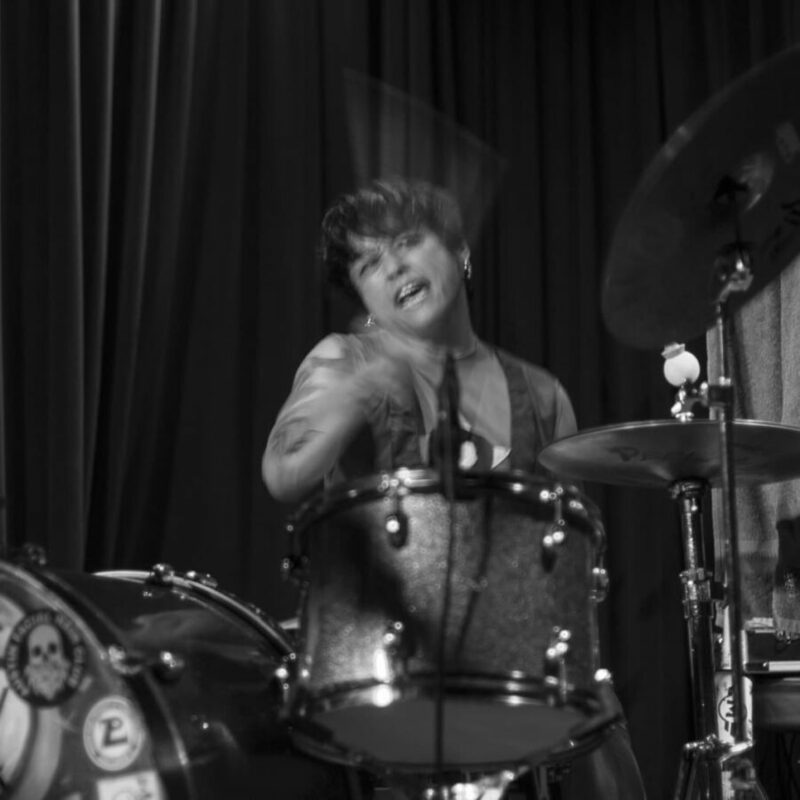 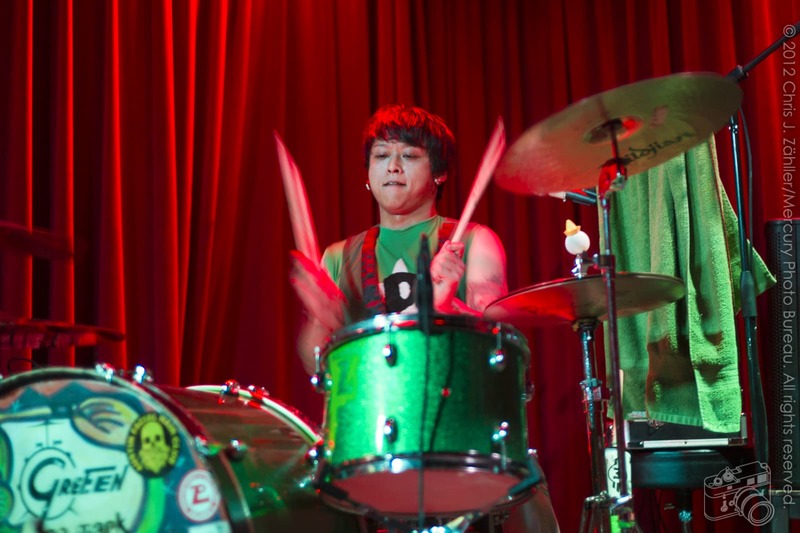 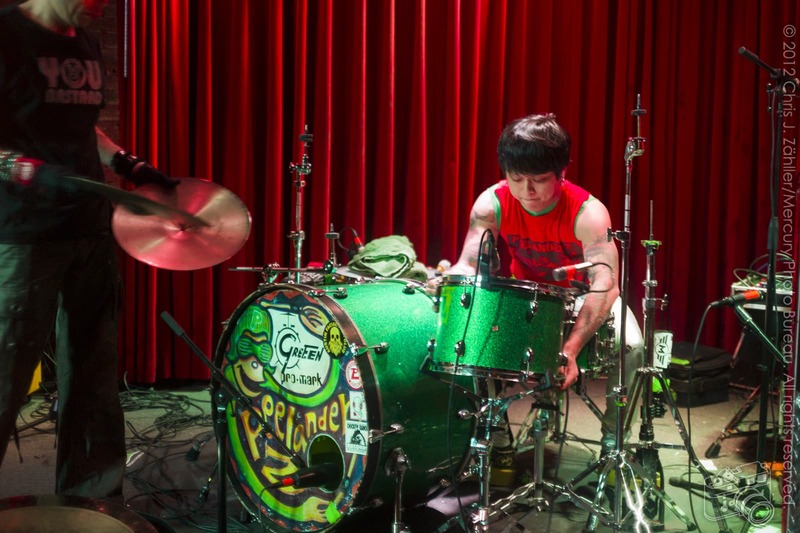 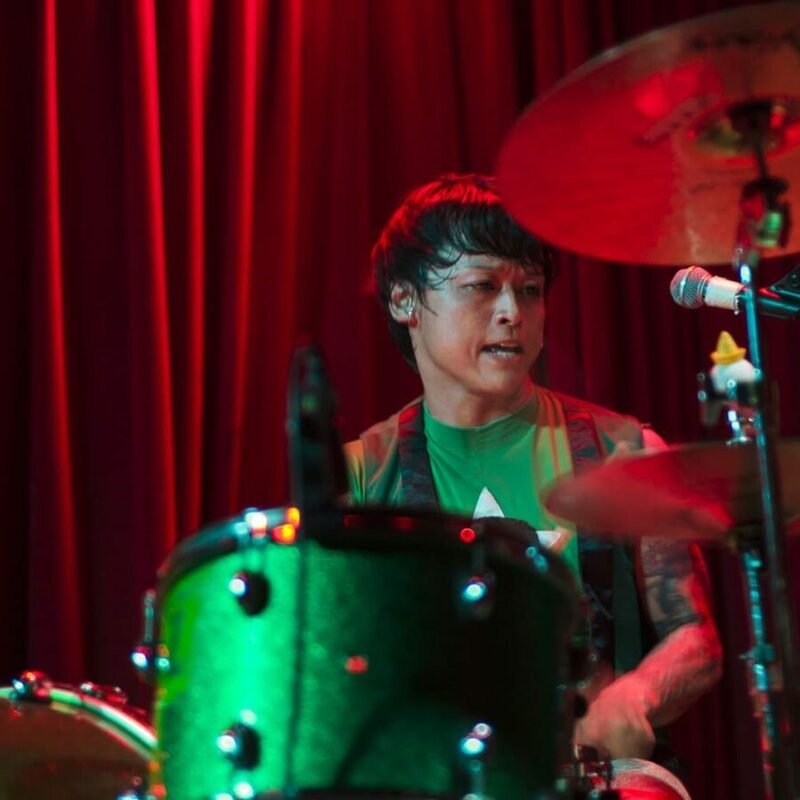 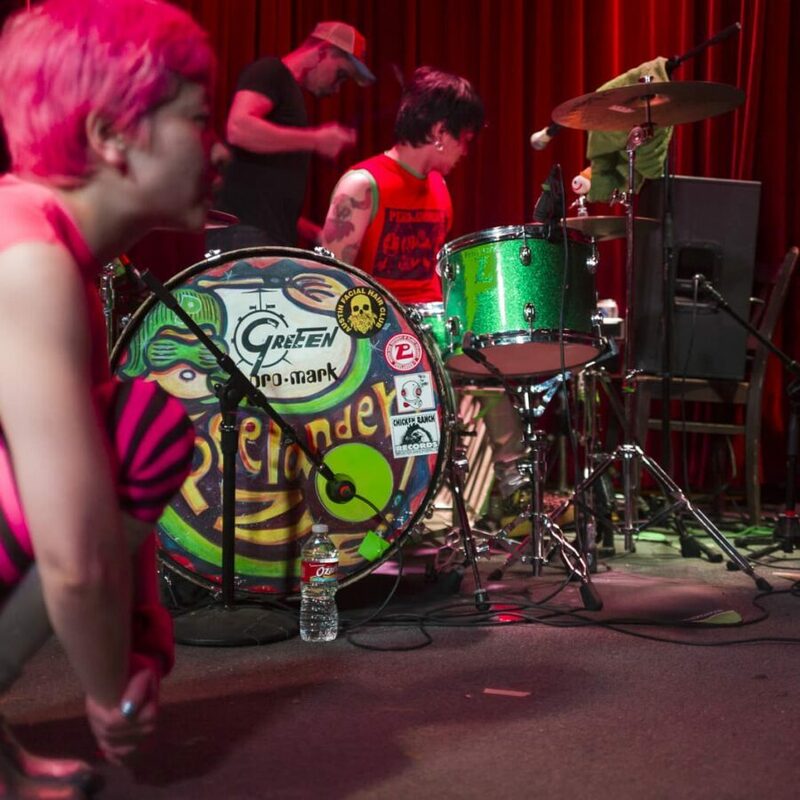 They are cur­rently tour­ing the south­ern US and the east­ern seaboard with Japanese garage metal band Electric Eel Shock. 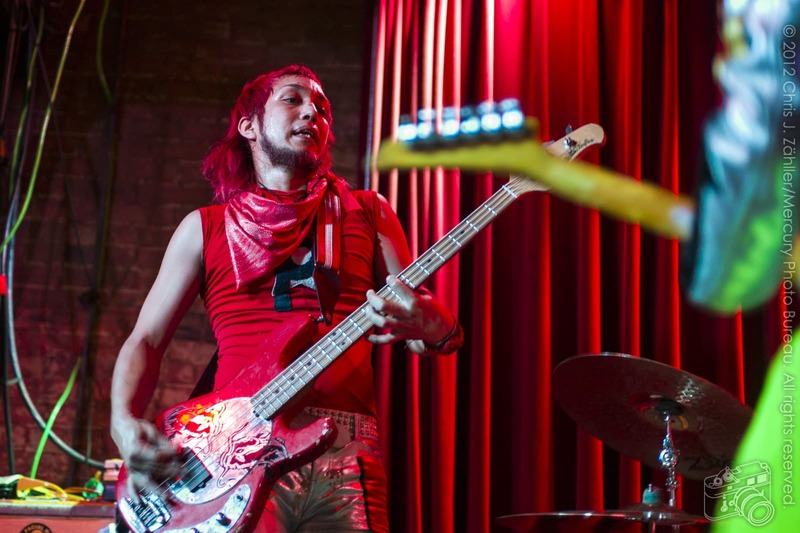 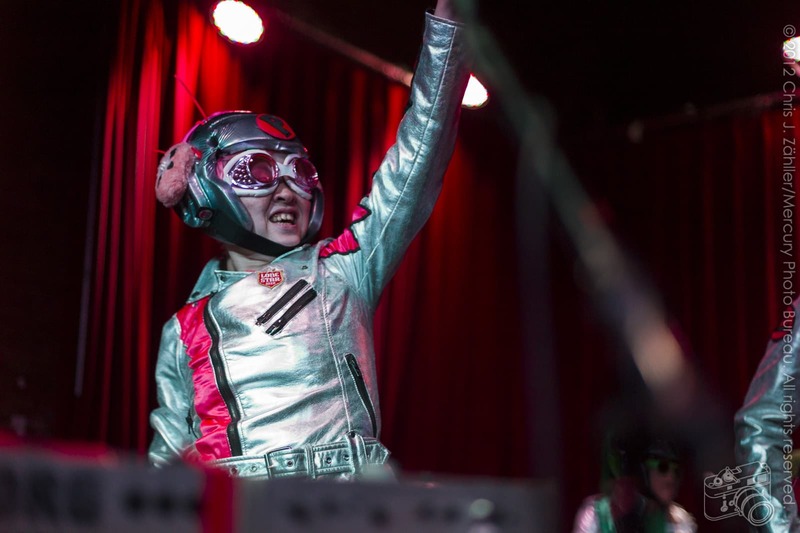 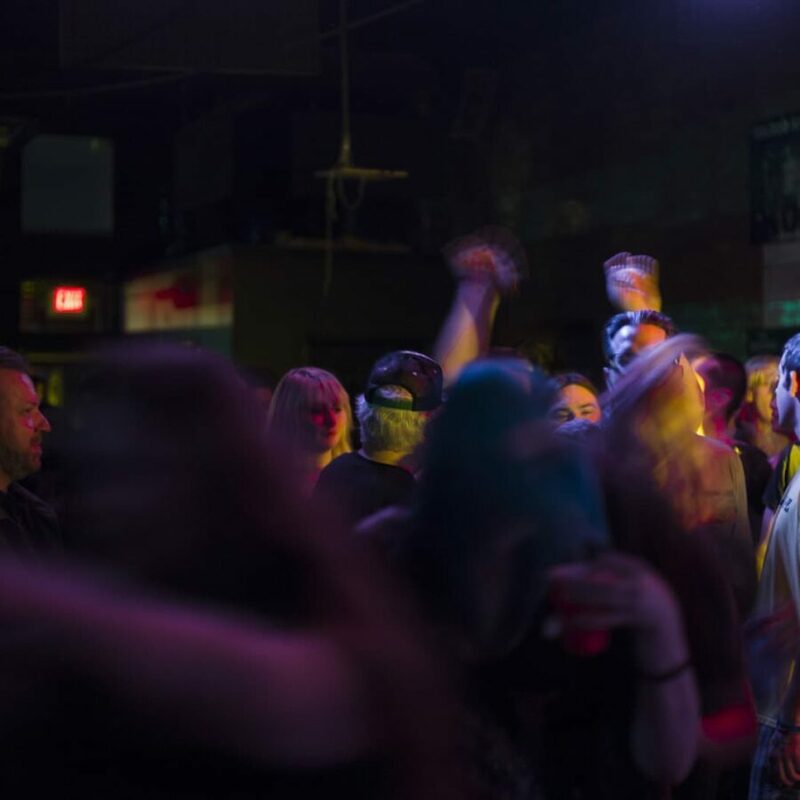 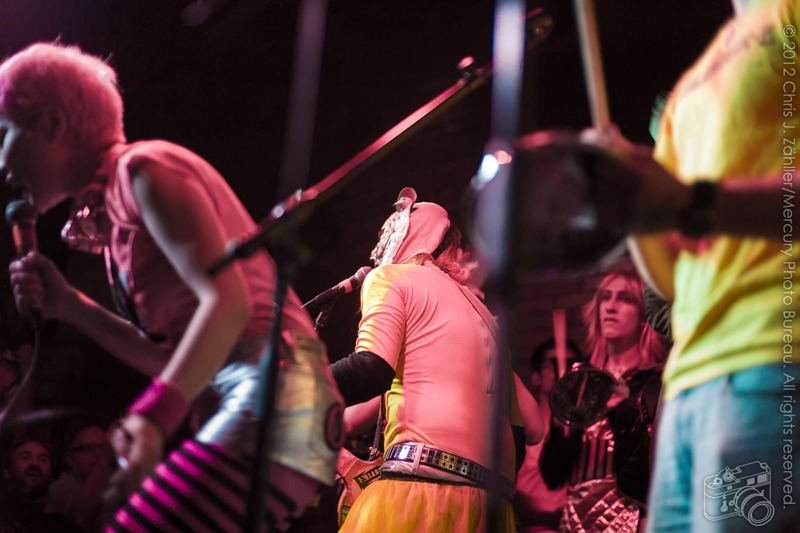 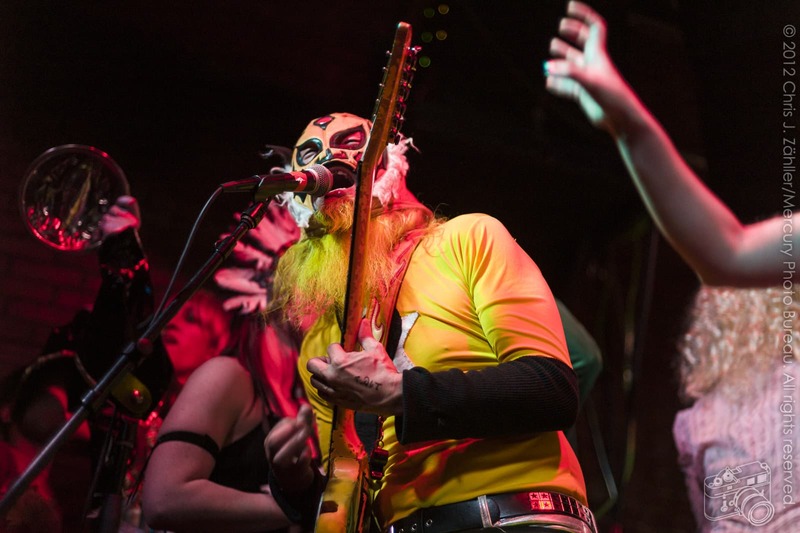 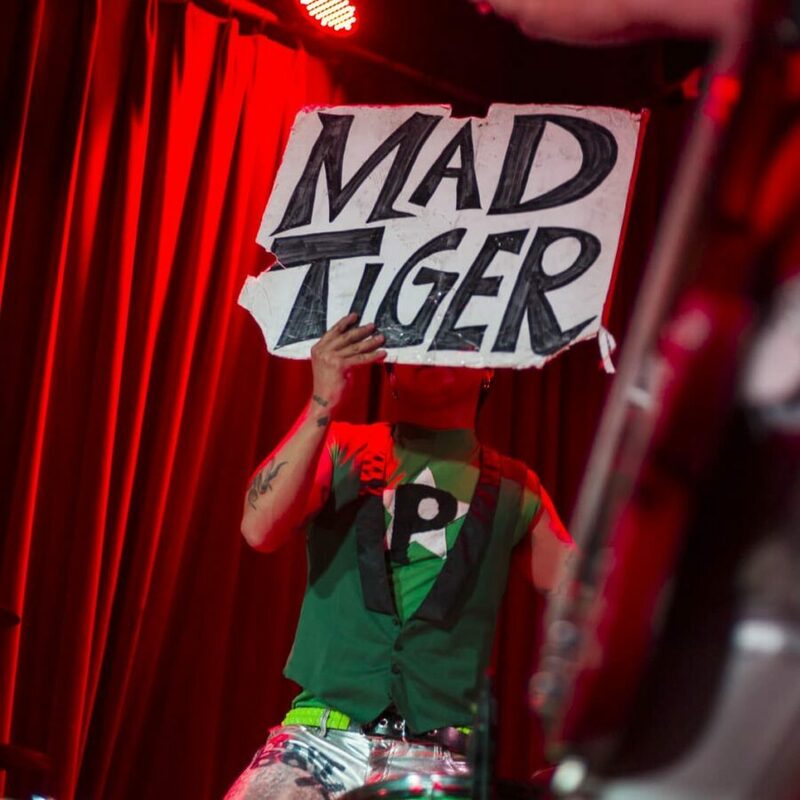 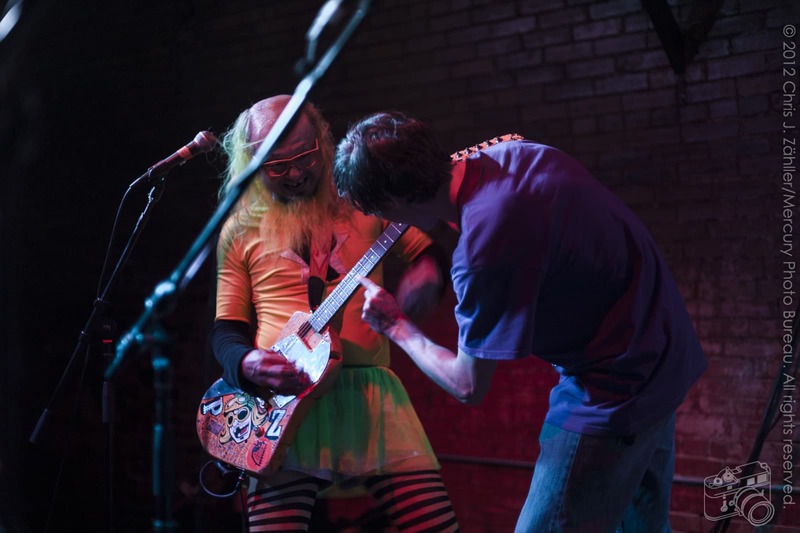 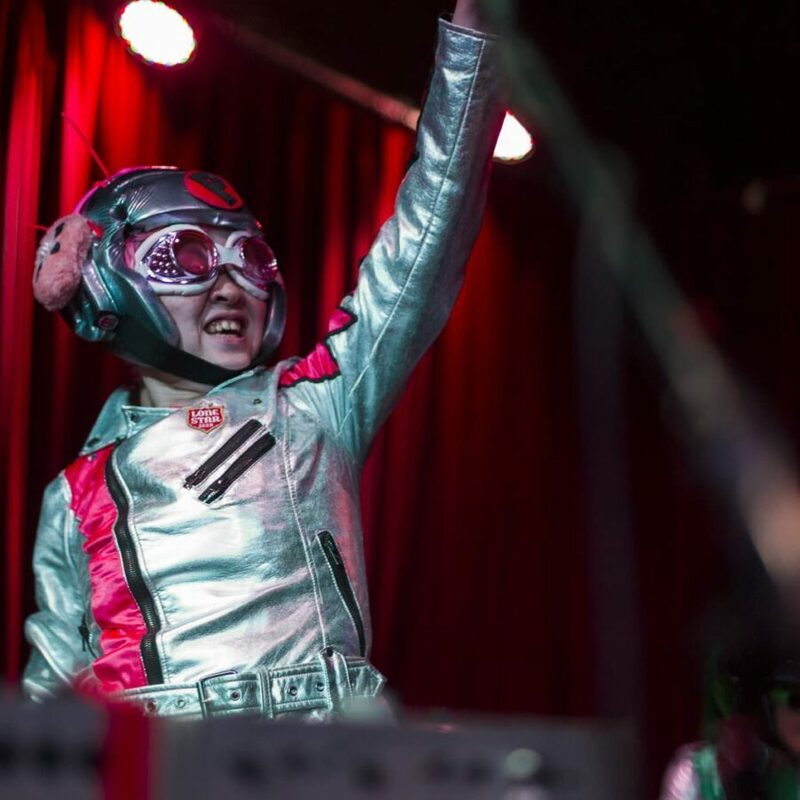 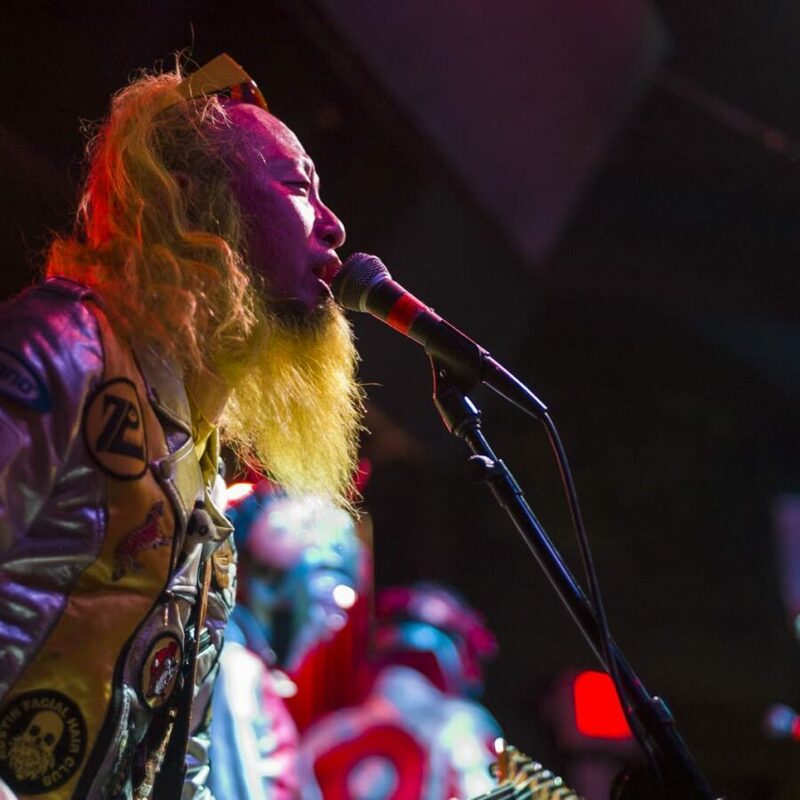 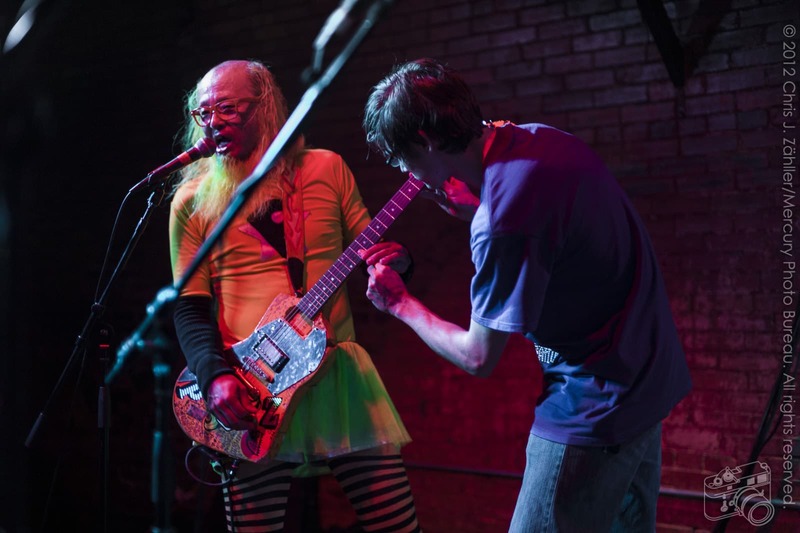 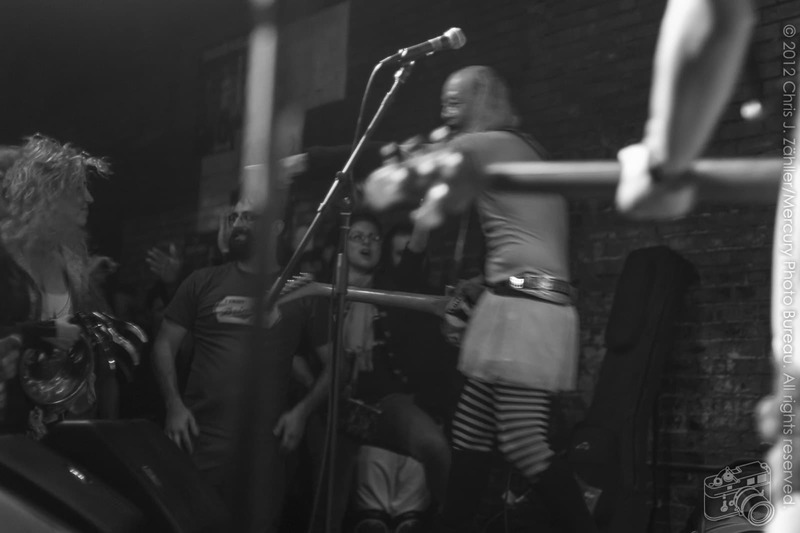 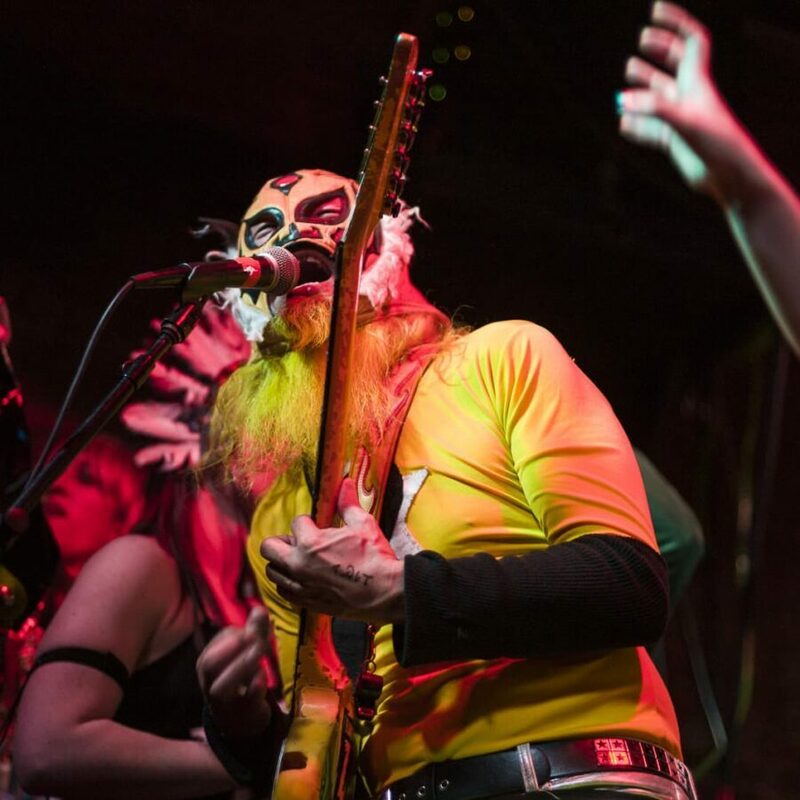 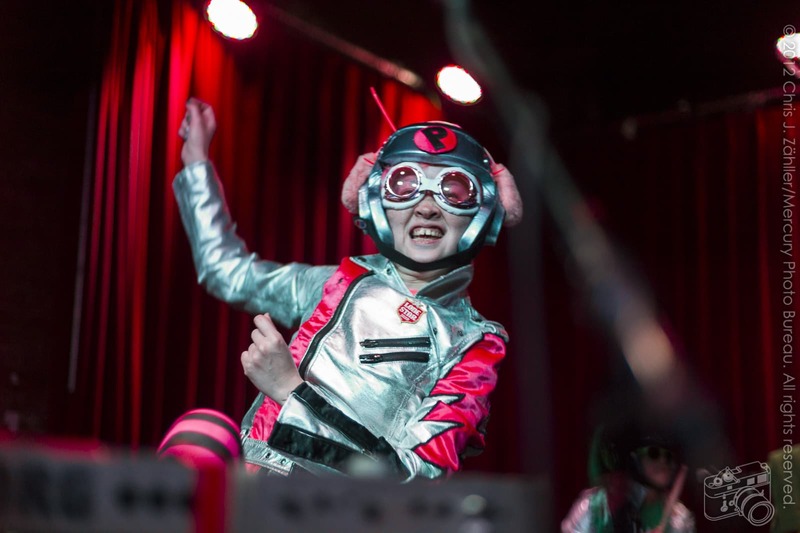 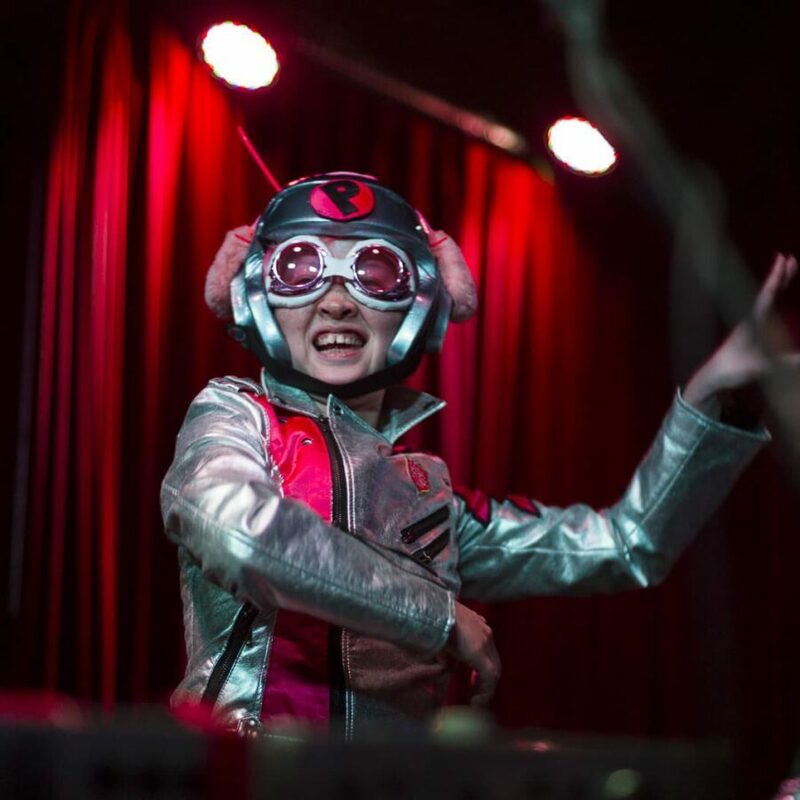 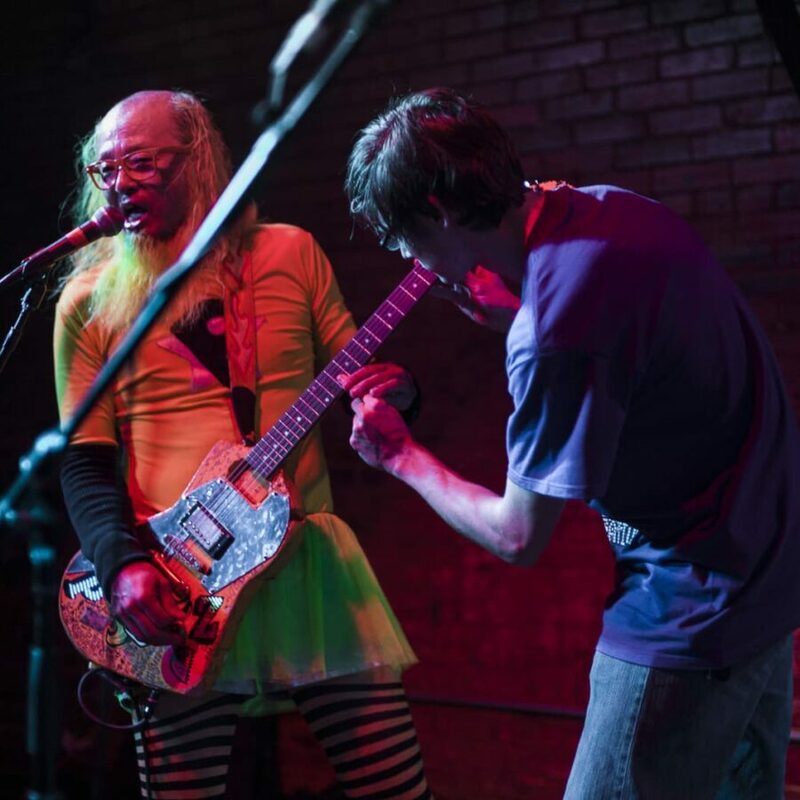 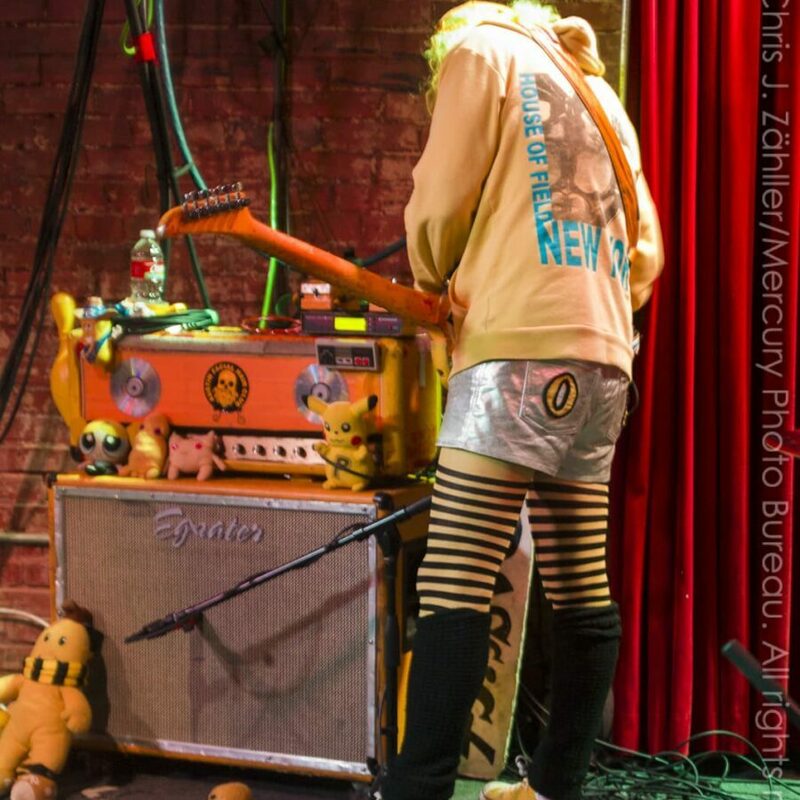 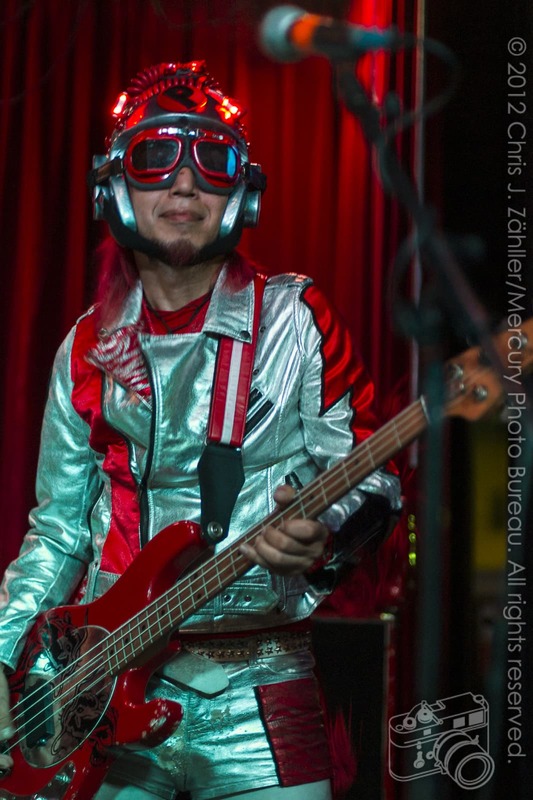 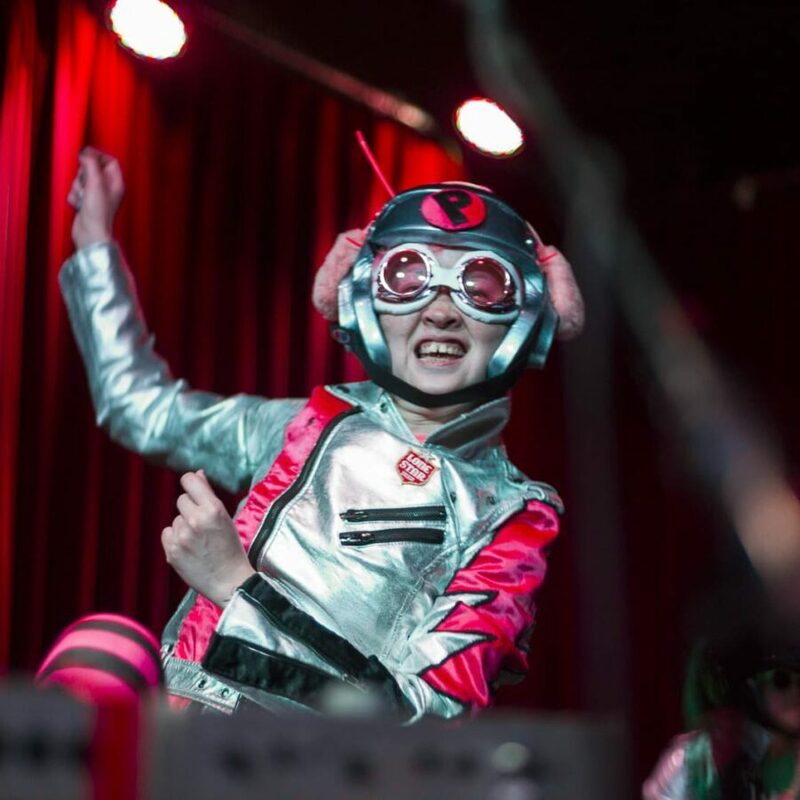 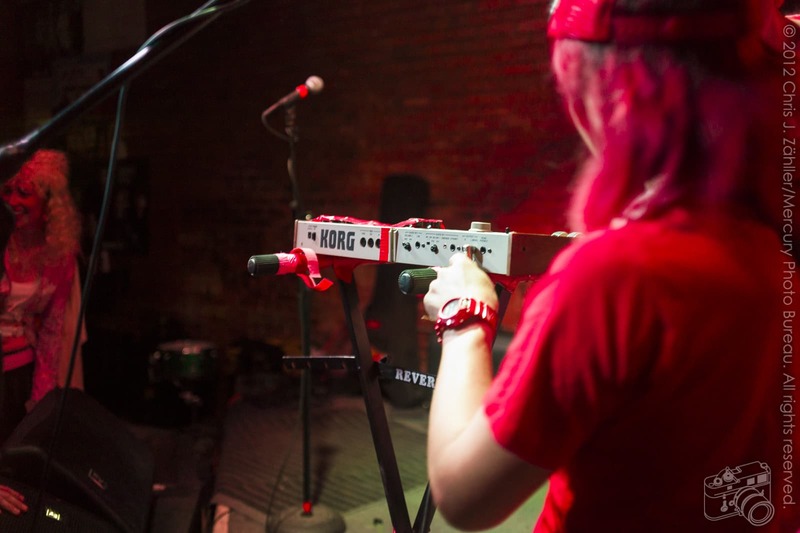 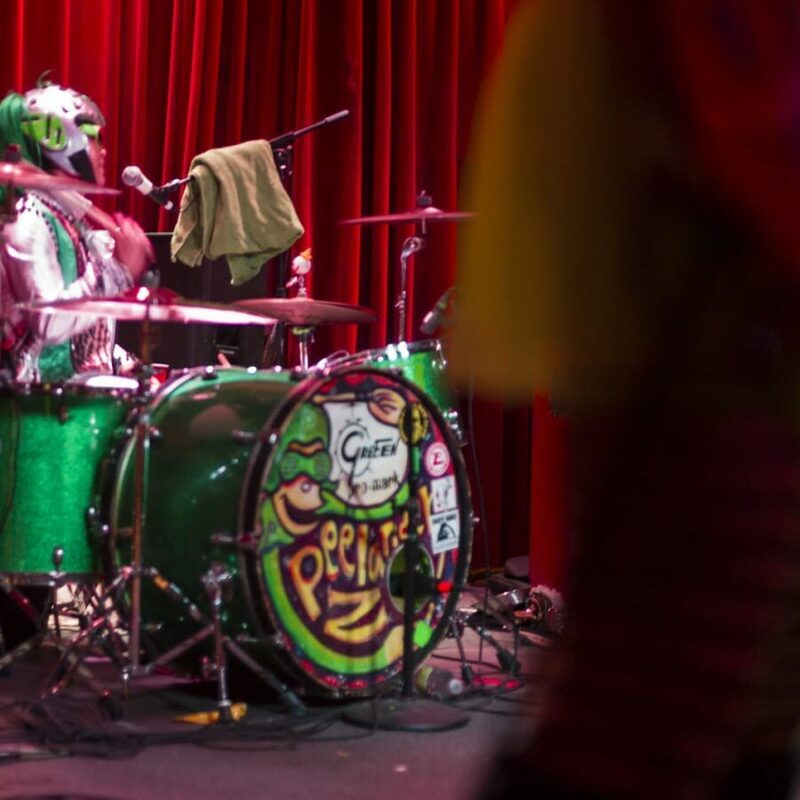 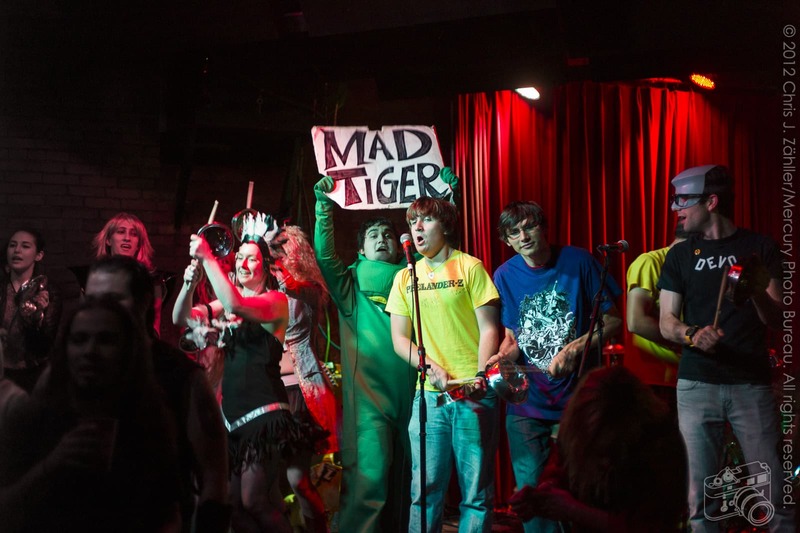 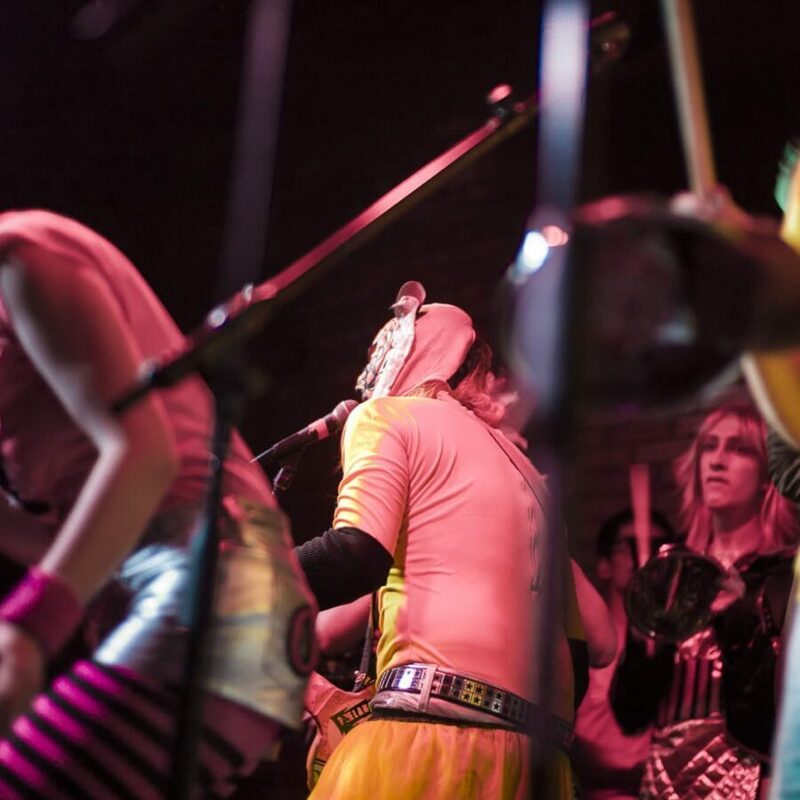 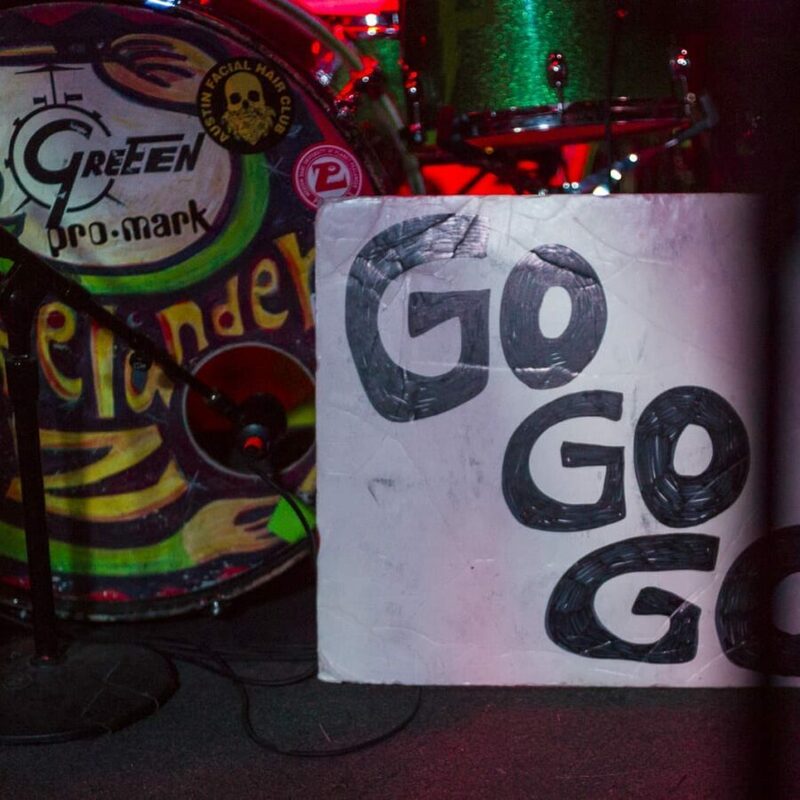 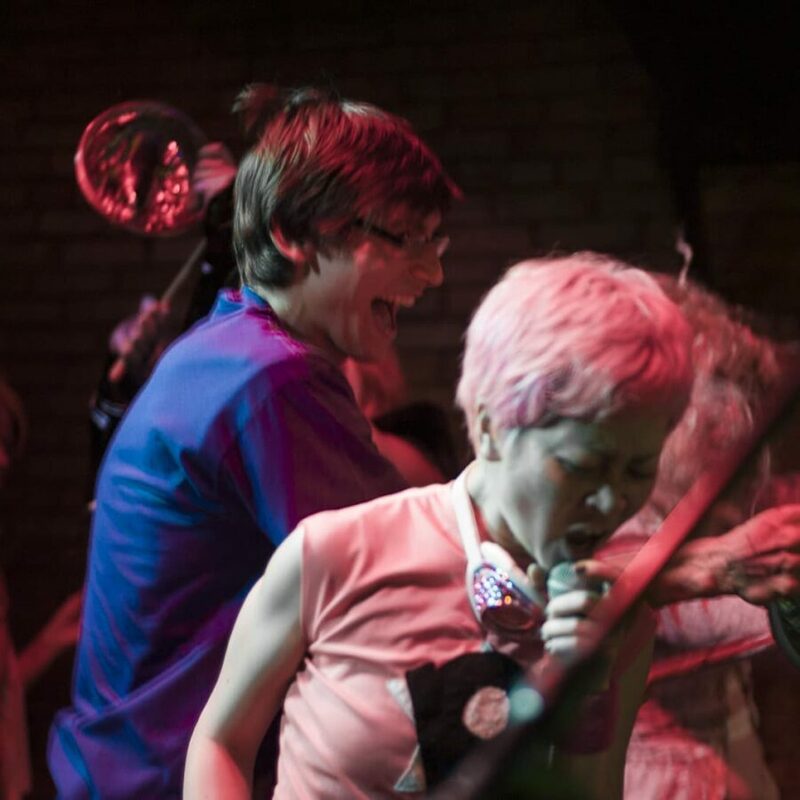 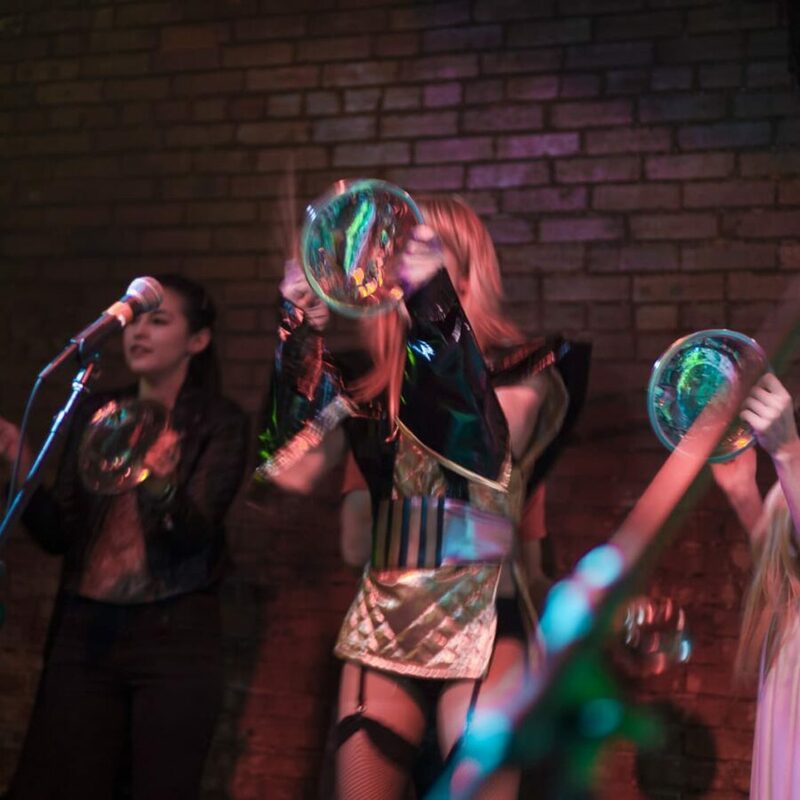 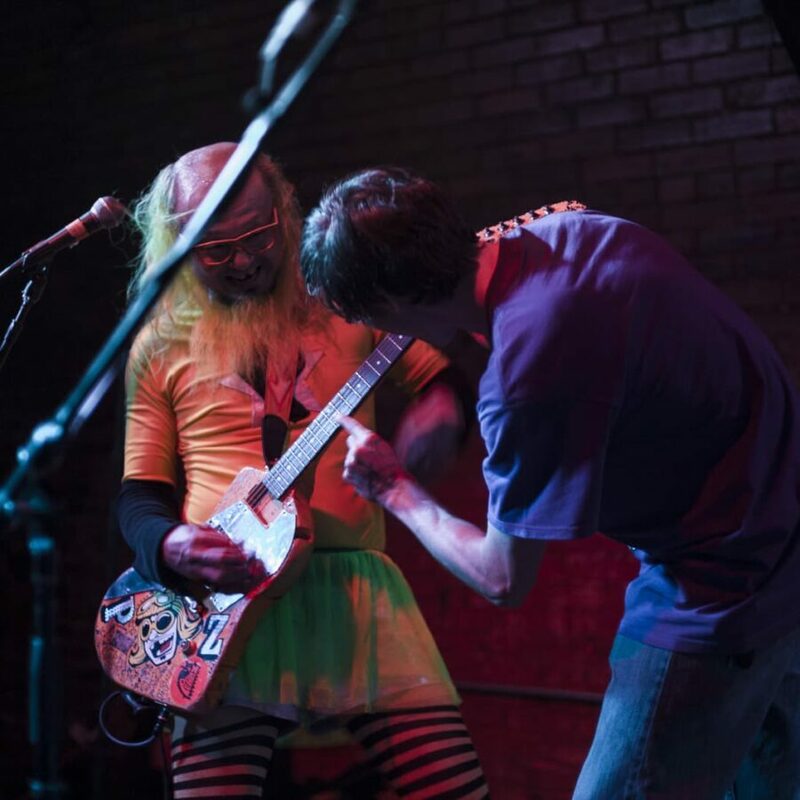 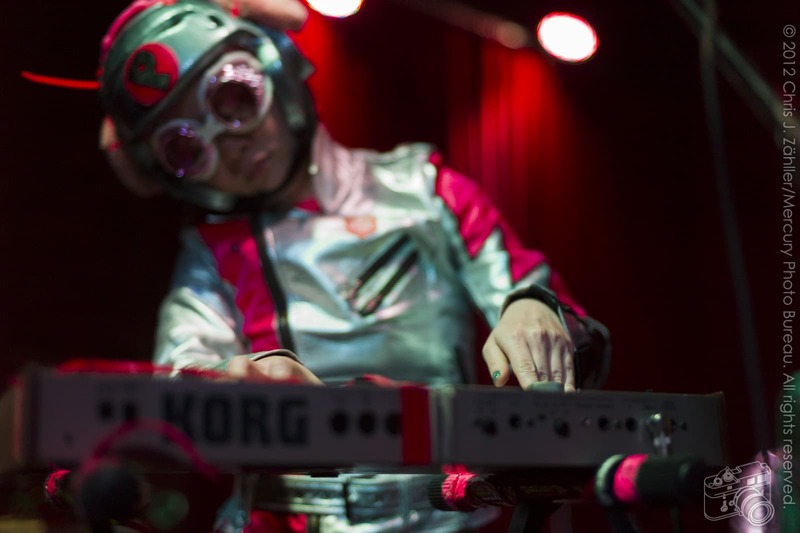 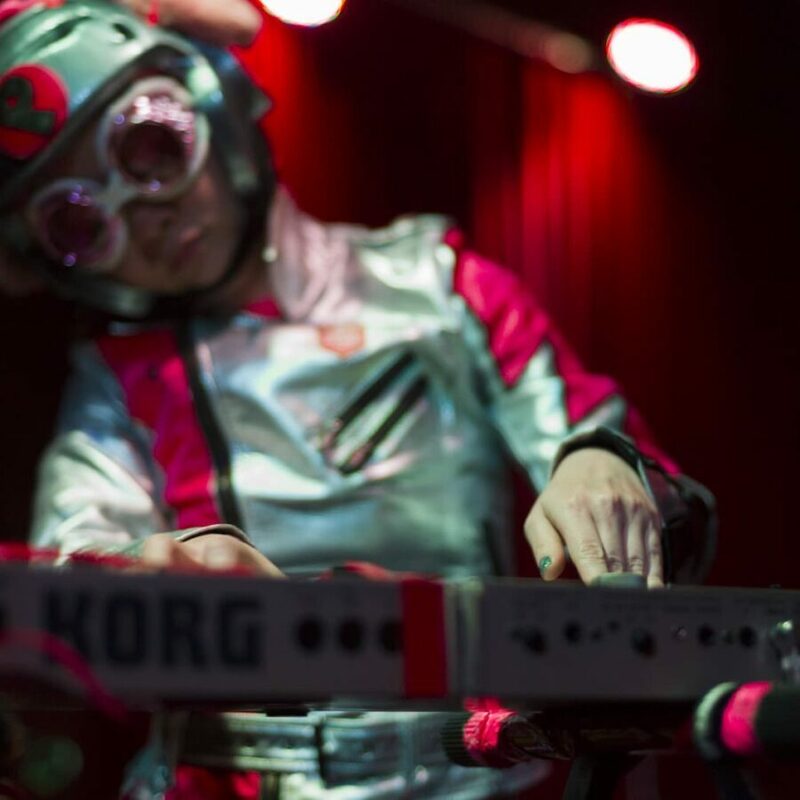 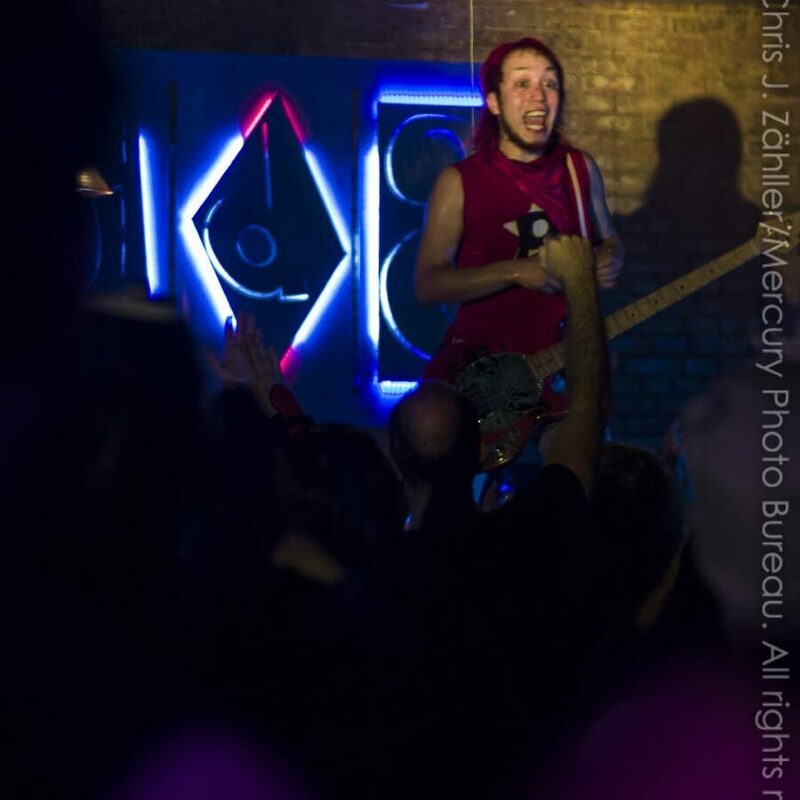 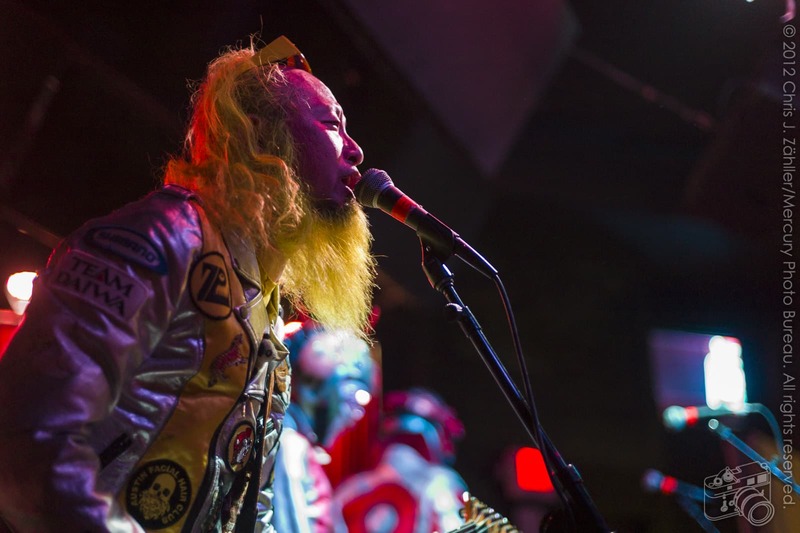 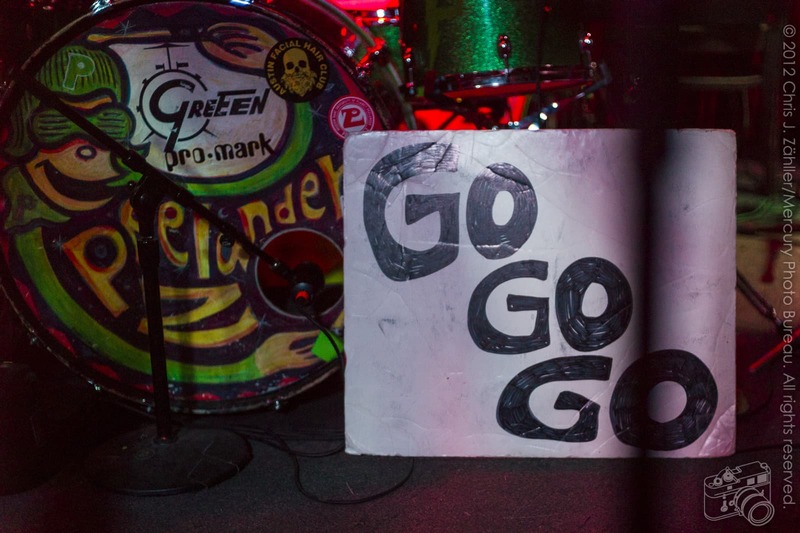 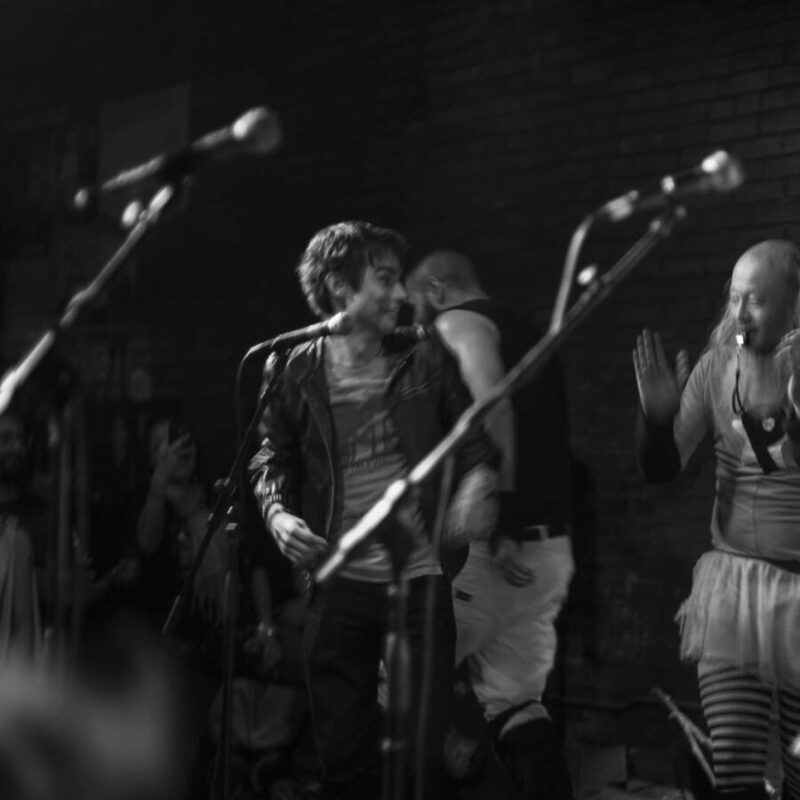 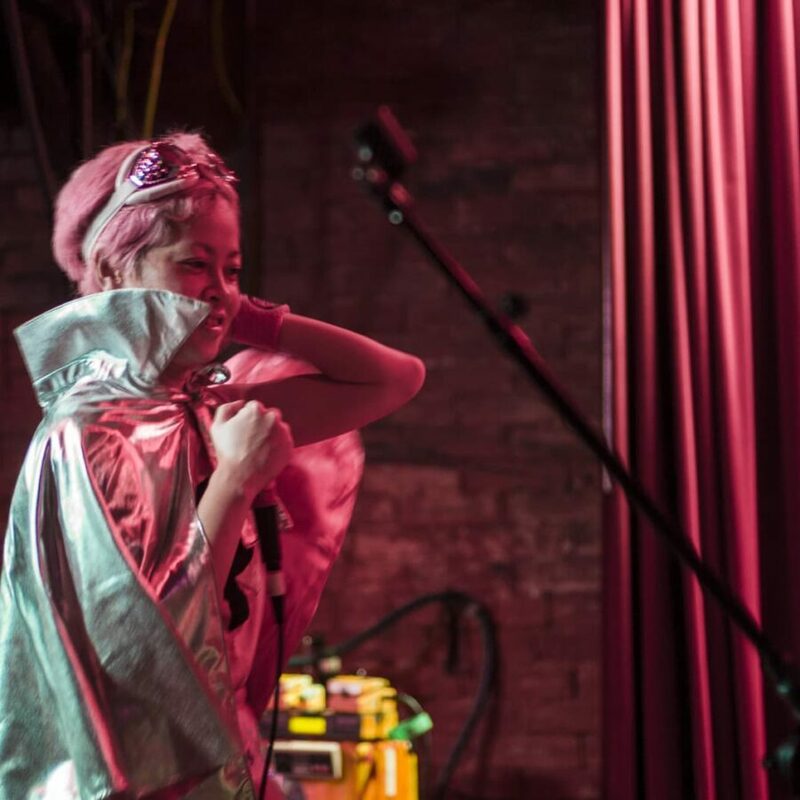 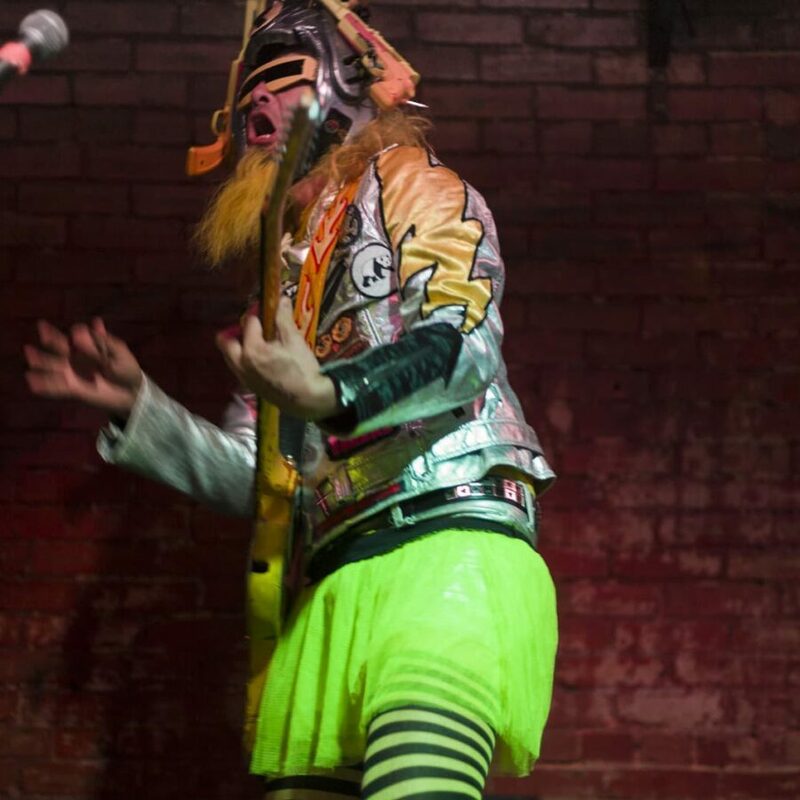 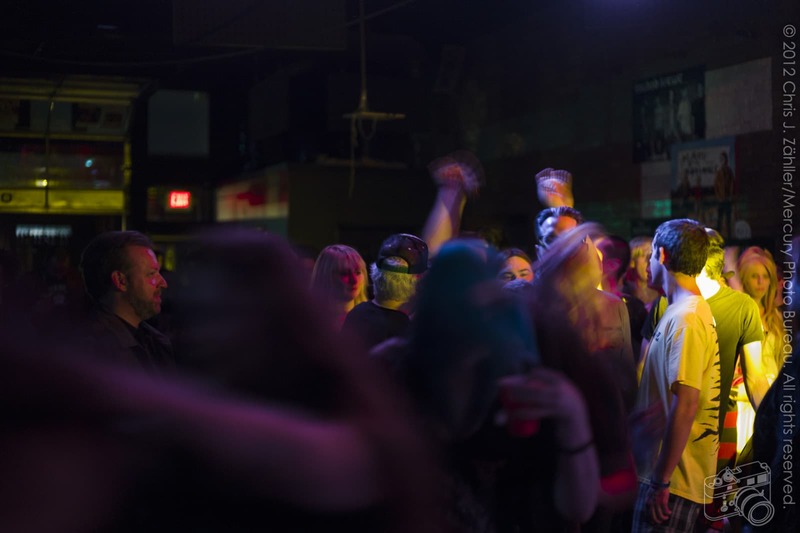 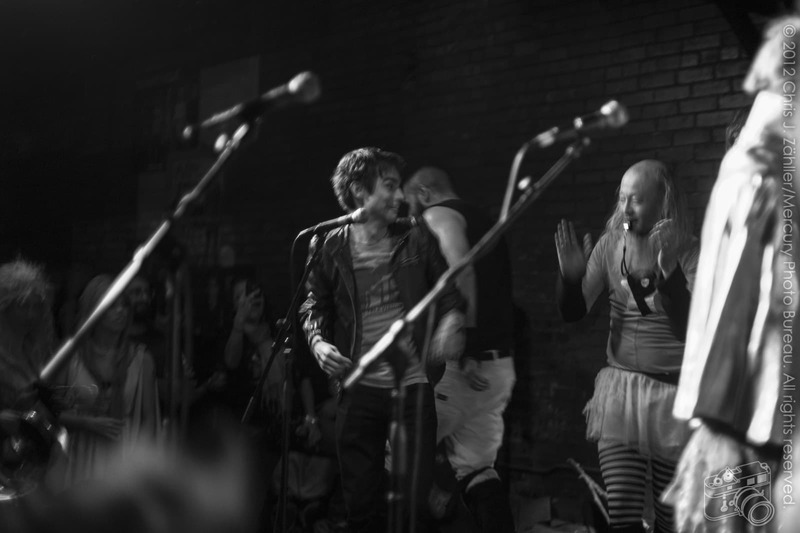 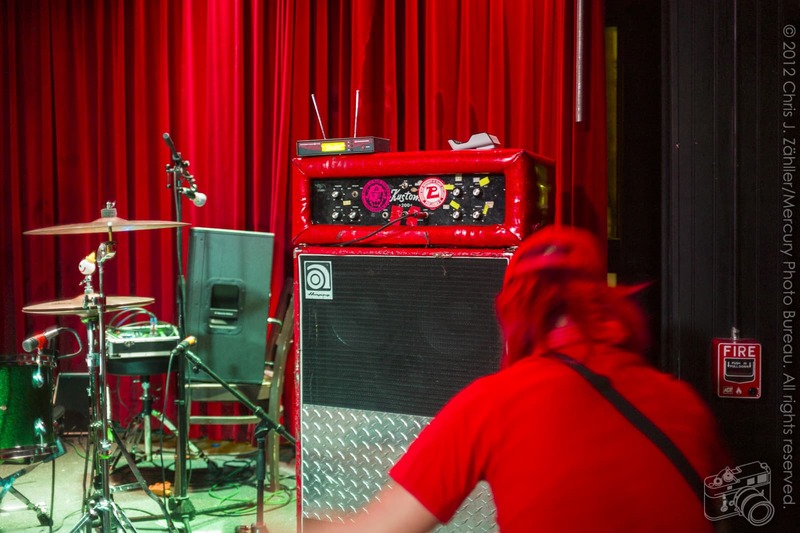 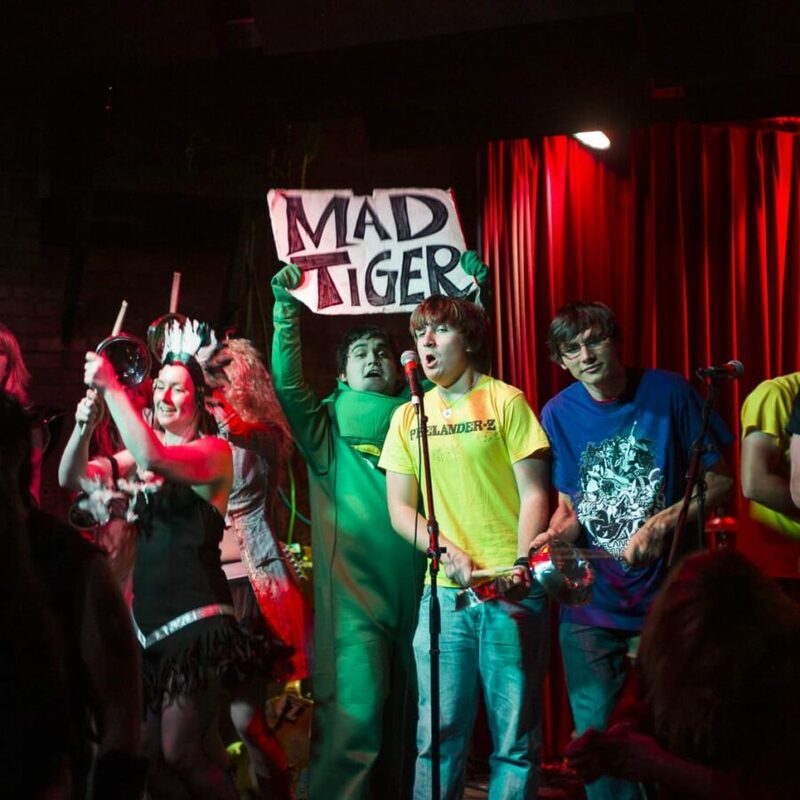 The band rocked the house with their smile-inducing 3-chord punk, zany antics, and brightly col­ored skins (they are not cos­tumes; remem­ber, Peelander-Z are from another planet!) 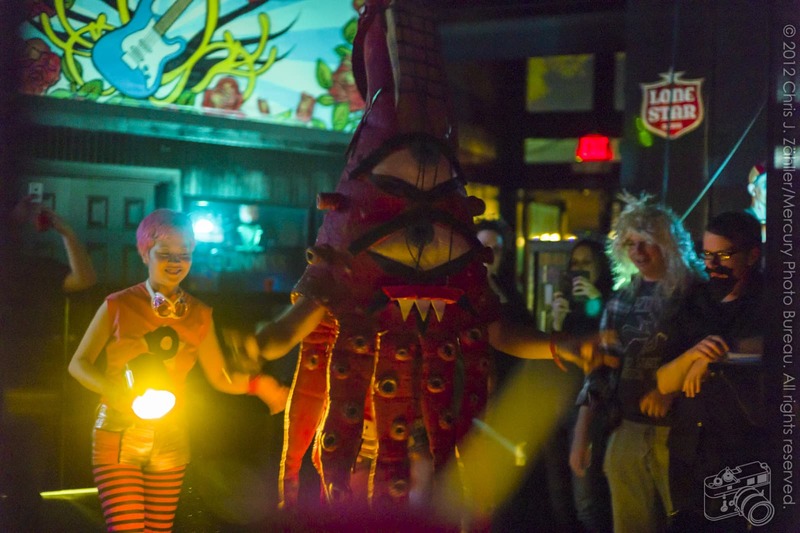 Human bowl­ing, a giant squid (or is it a giant gui­tar?) 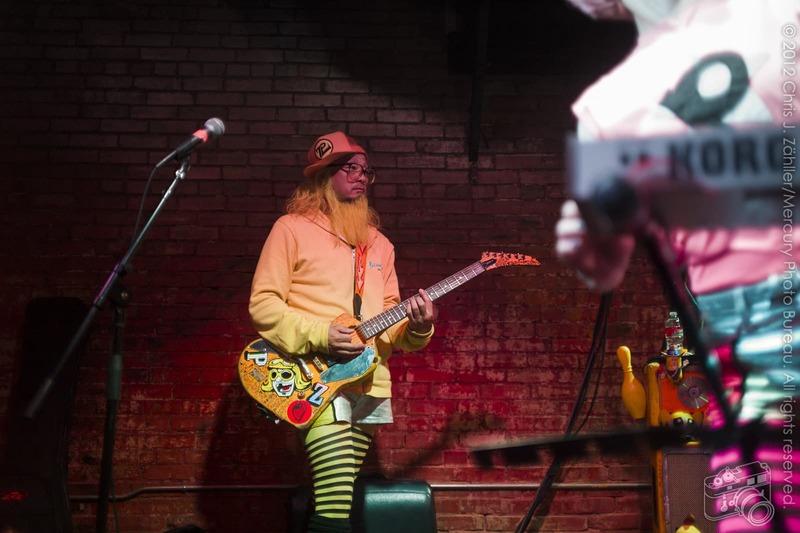 and songs about food are just some of the trade­mark ele­ments audi­ences all over the coun­try expect from the band. 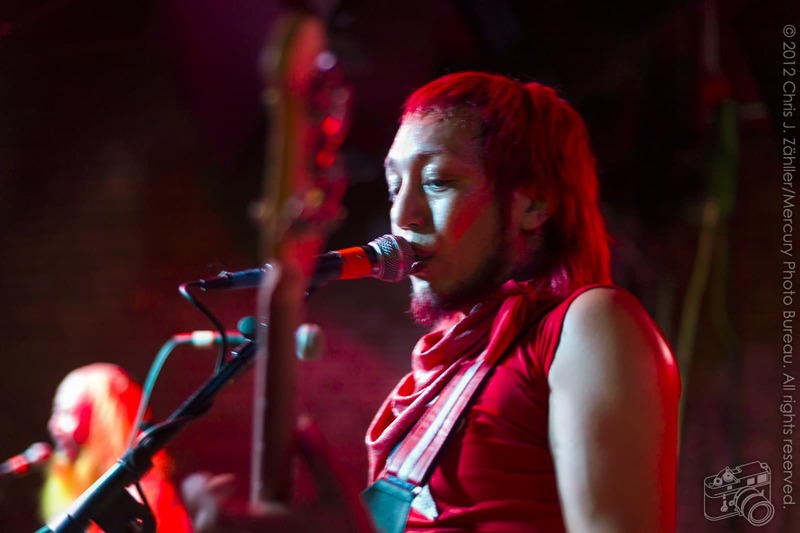 The audi­ence were fre­quently enlisted as per­form­ers; with their sim­ple lyrics, every song is a sing-along. 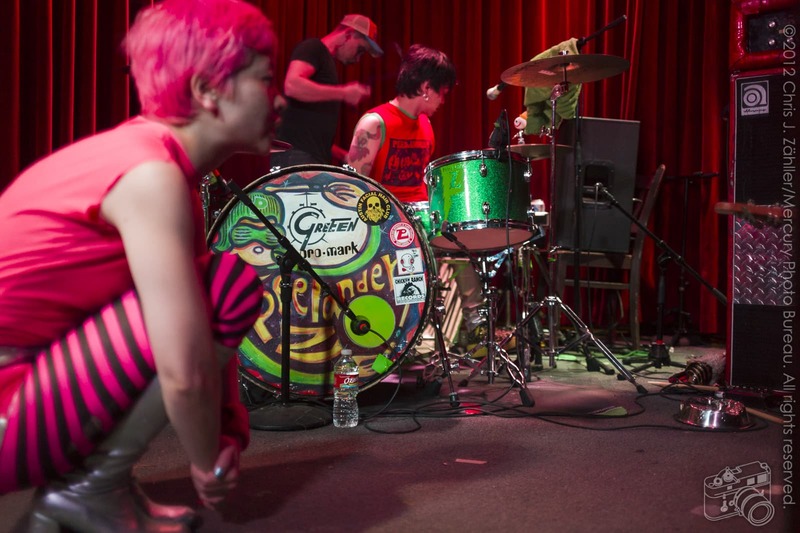 Peelander Pink﻿ If you can see her in this post’s fea­tured image, it means you’re a good per­son. 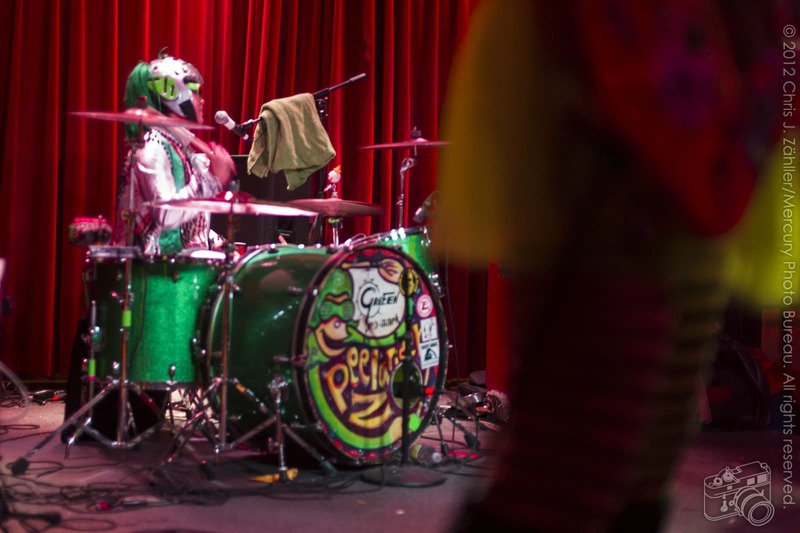 dis­trib­uted steel pet dishes and drum­sticks as makeshift per­cus­sion and pulled us onto the stage. 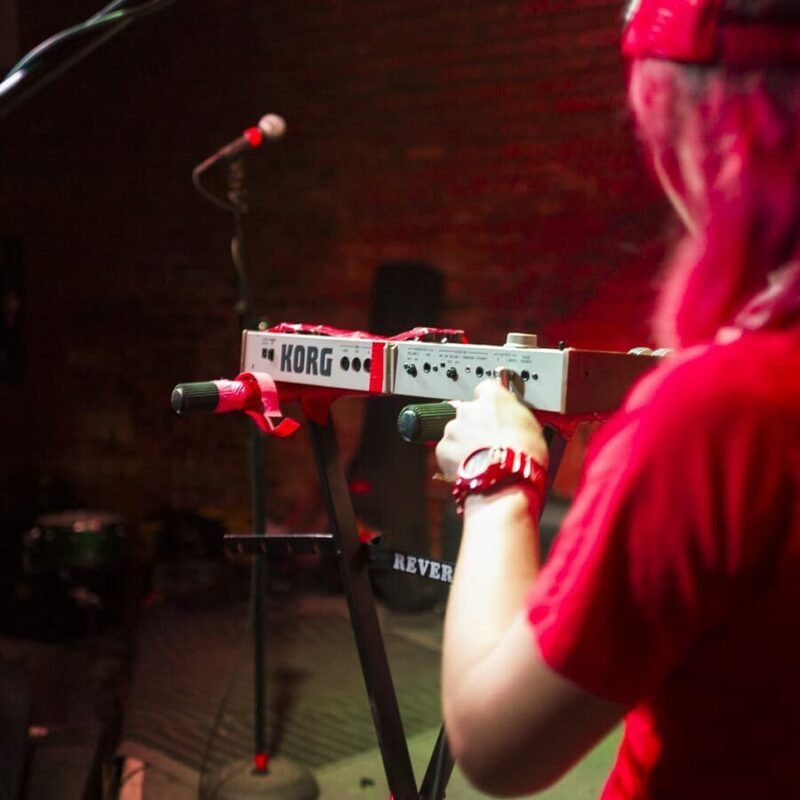 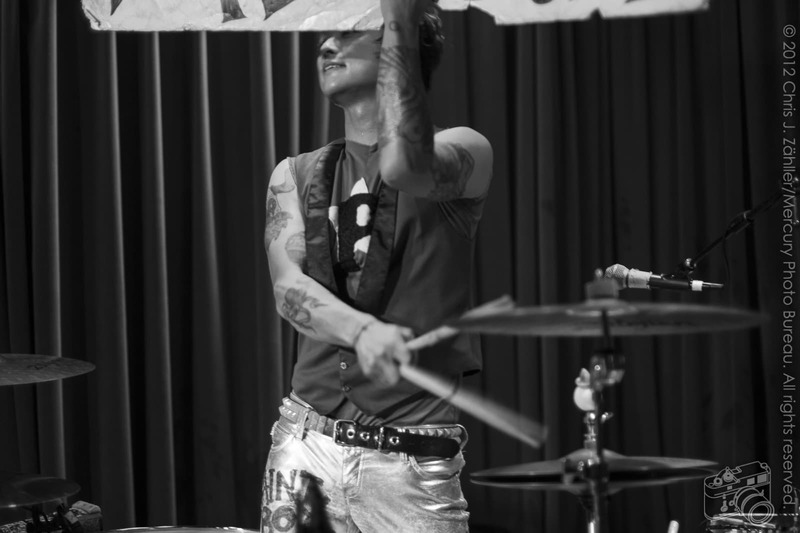 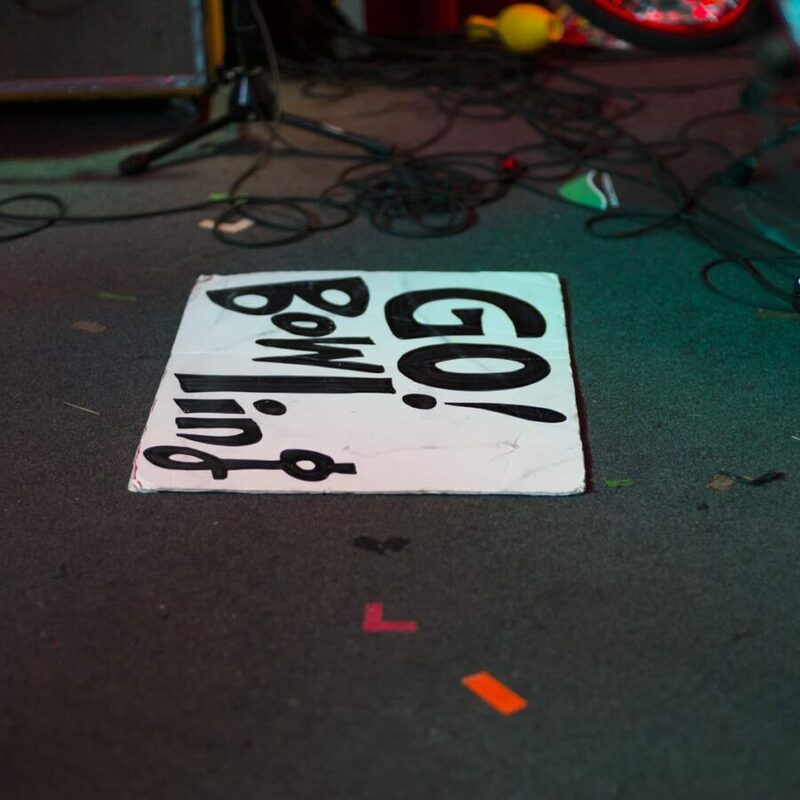 When the Peelanders engaged in “human bowl­ing,” they handed their own instru­ments to audi­ence mem­bers to play while the entire band left the stage. 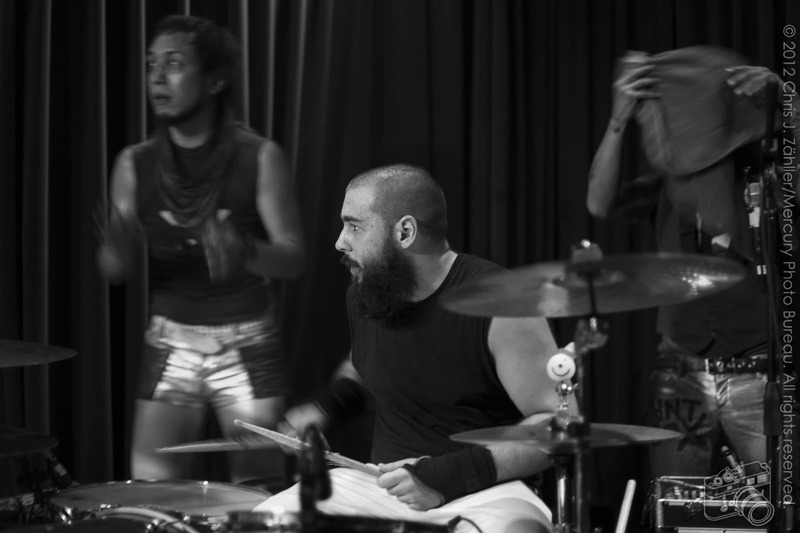 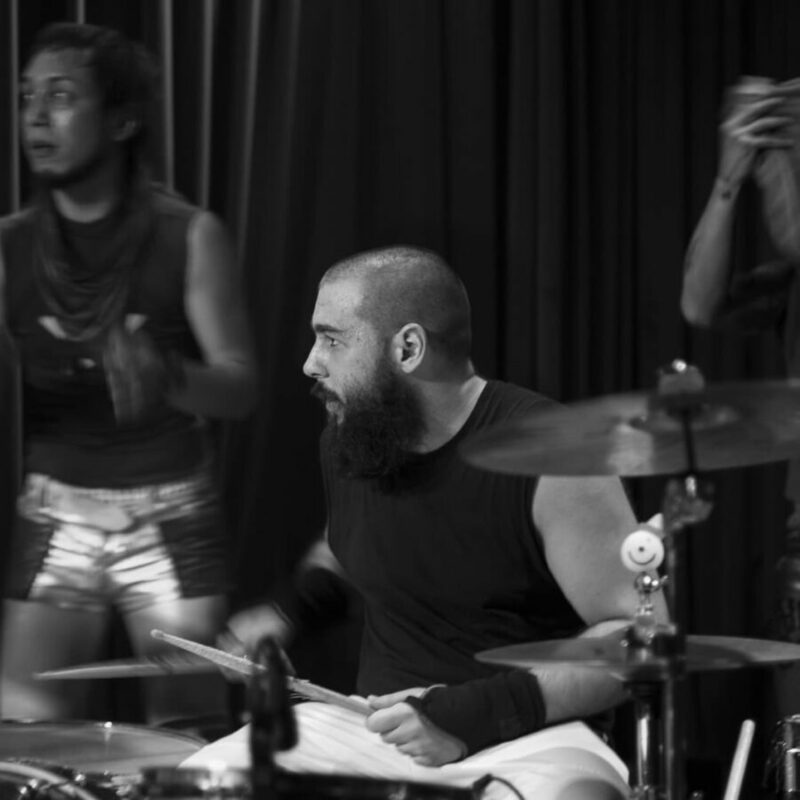 Daniel Drinnen, key­board player for open­ing band Urizen, was enlisted as the sub­sti­tute drum­mer. 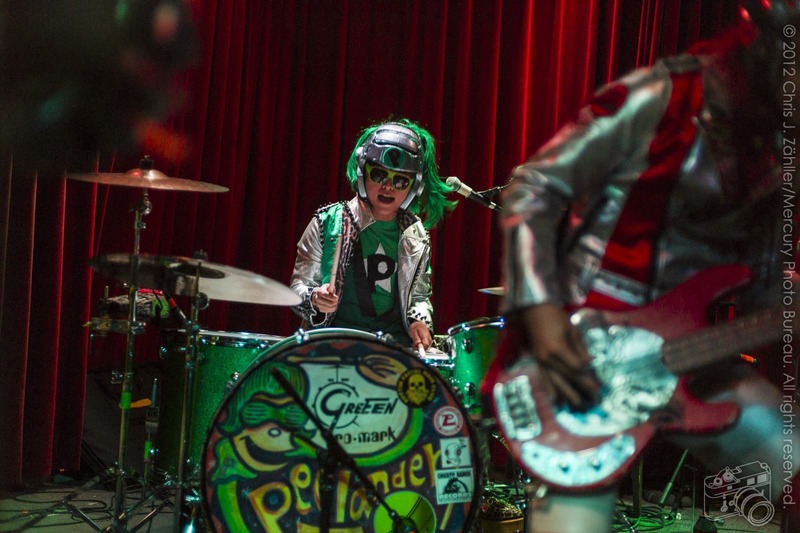 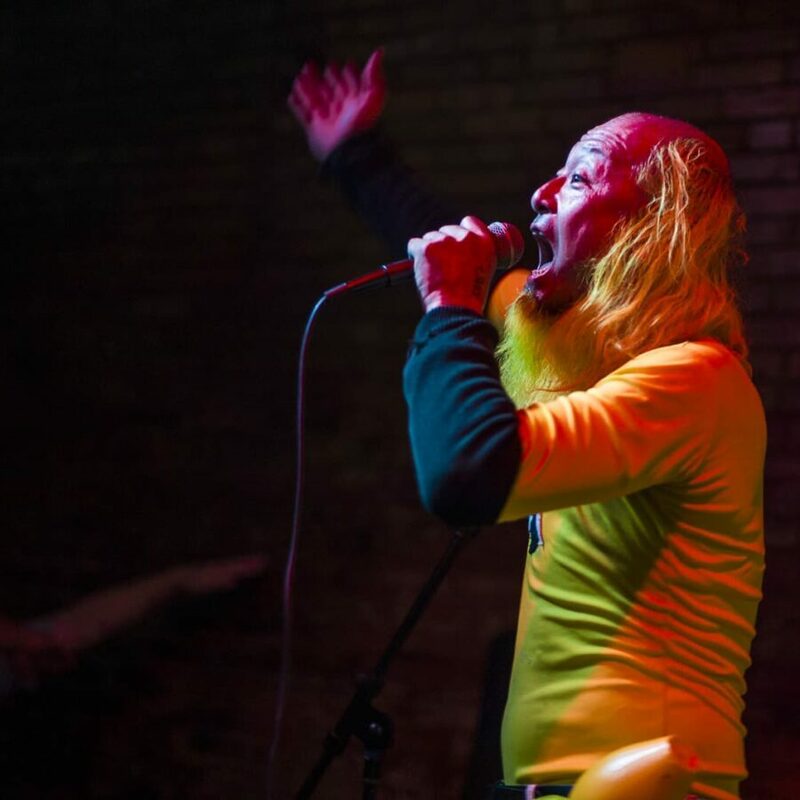 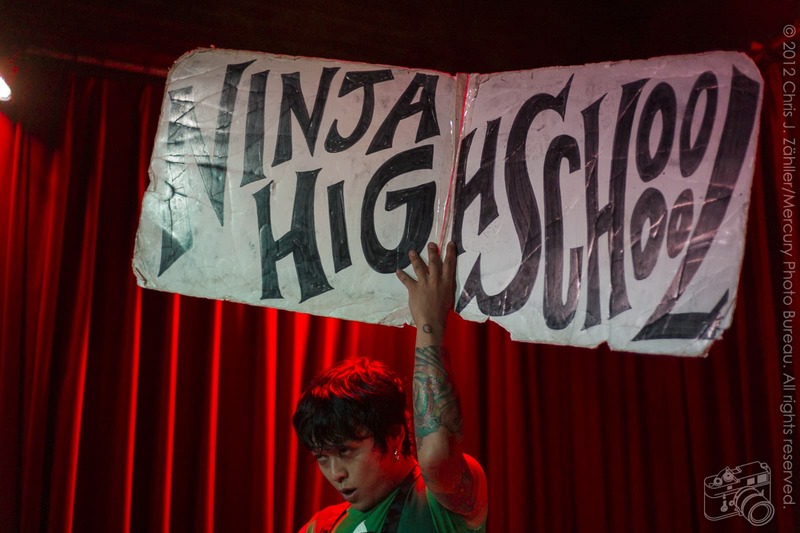 Plan to catch them at their upcom­ing shows: this is Peelander Green’s Red’s last tour before he retires to teach at Ninja High School. 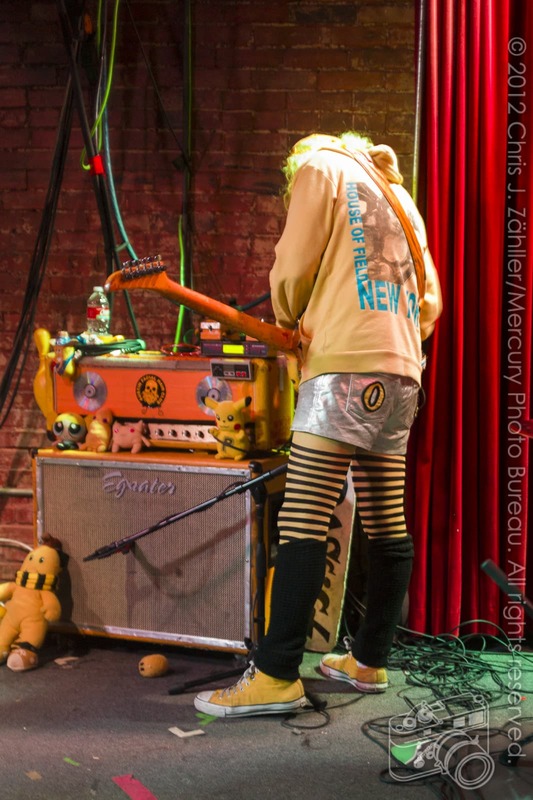 Mercury Photo Bureau arranged to doc­u­ment the insan­ity﻿ Thanks to Christopher Moon at Anhedonia Management and Josh Bloom at Fanatic Promotion for arrang­ing the inter­view and grant­ing me access dur­ing the show. 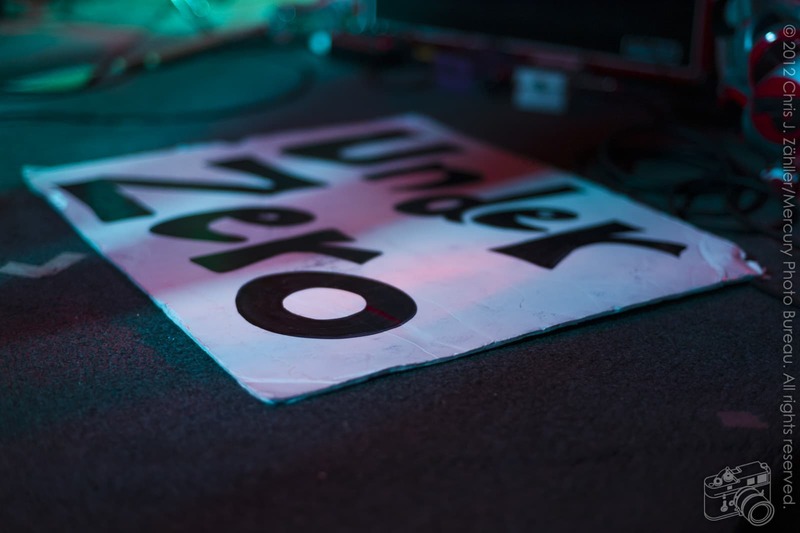 and here are the results. 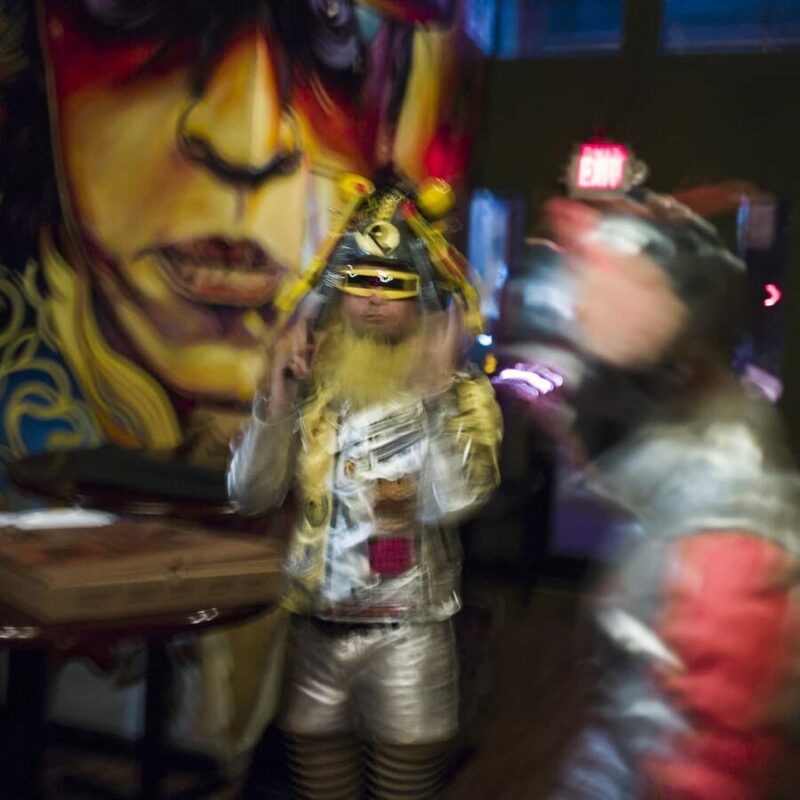 Be sure to view the gallery and read the exclu­sive inter­view. 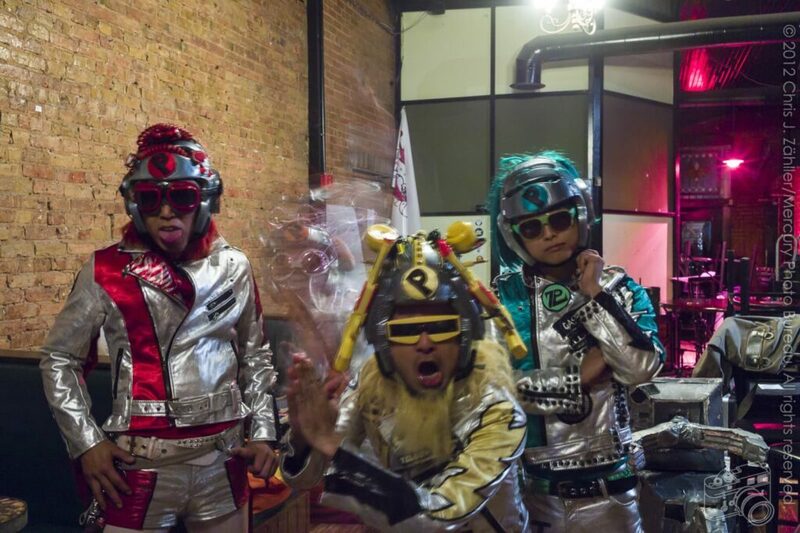 And why haven’t you bought their new album yet? 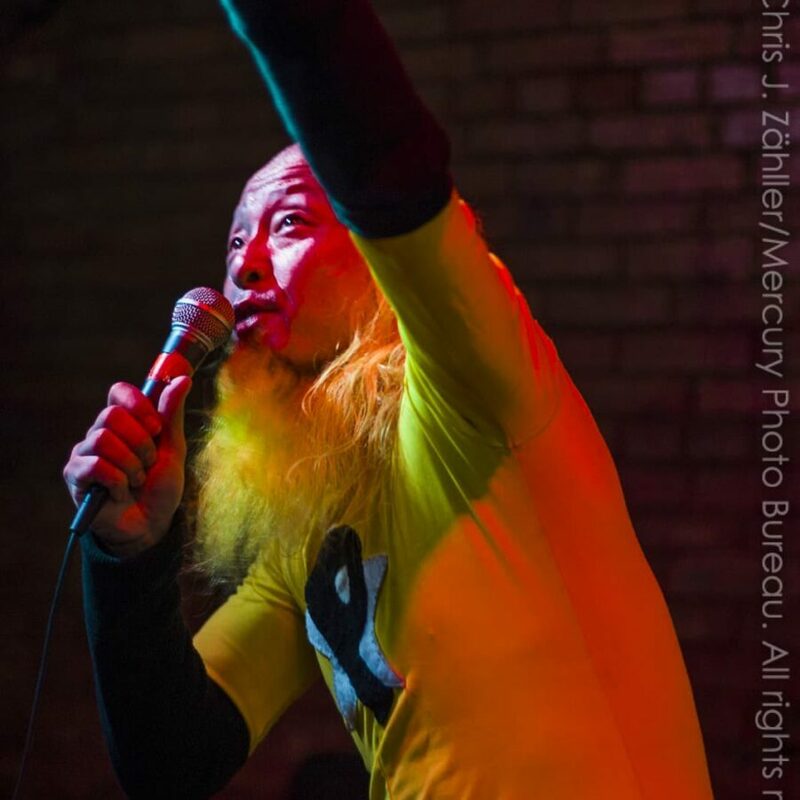 You can find Peelander-Z on iTunes and Amazon. 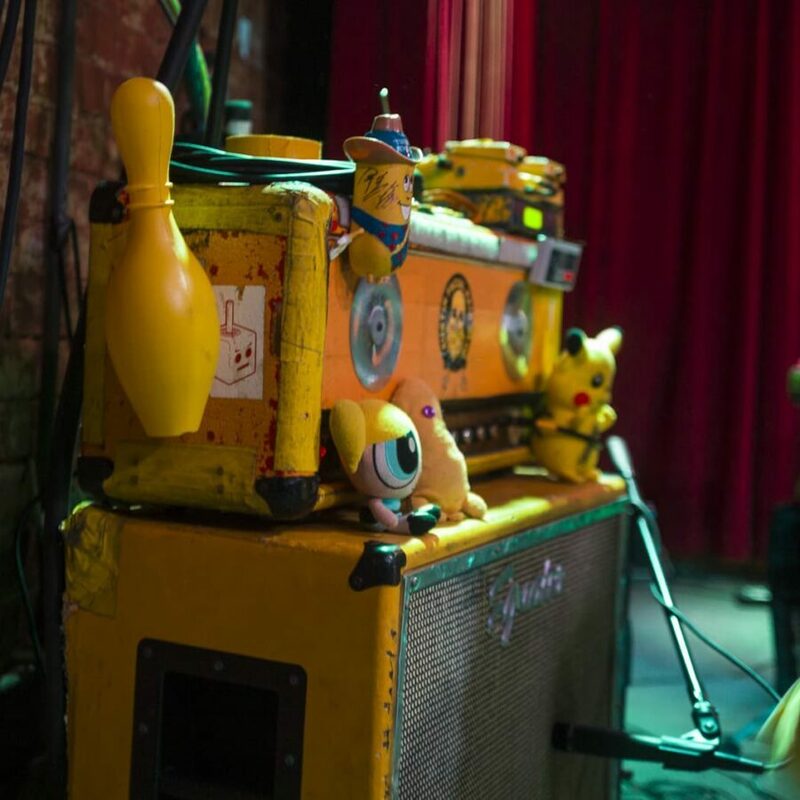 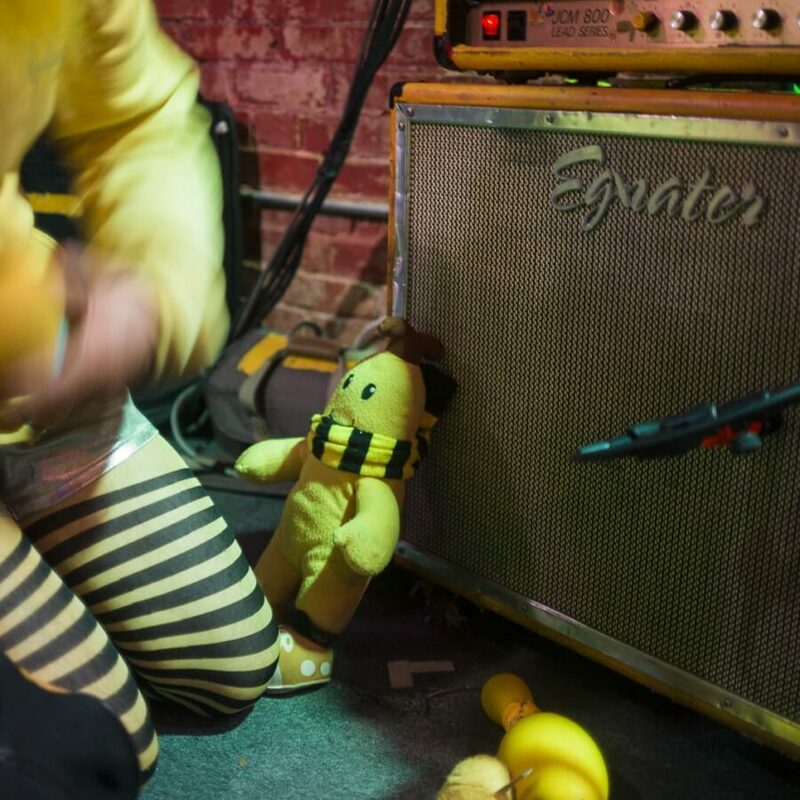 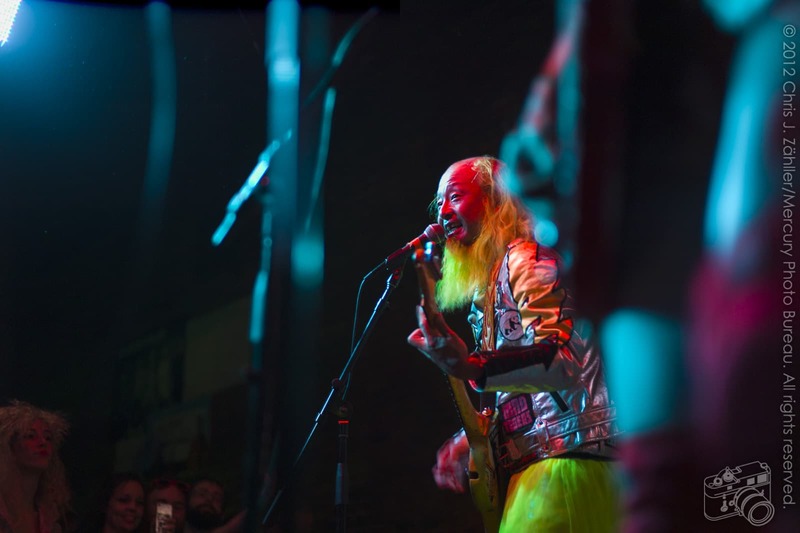 I orig­i­nally intended to record my tele­phone con­ver­sa­tion with Kengu (Peelander Yellow), but when I called at the appointed time, he was dri­ving the band to their next show in Arizona.﻿ You can see the soft­ware setup I would have used to record the inter­view here. 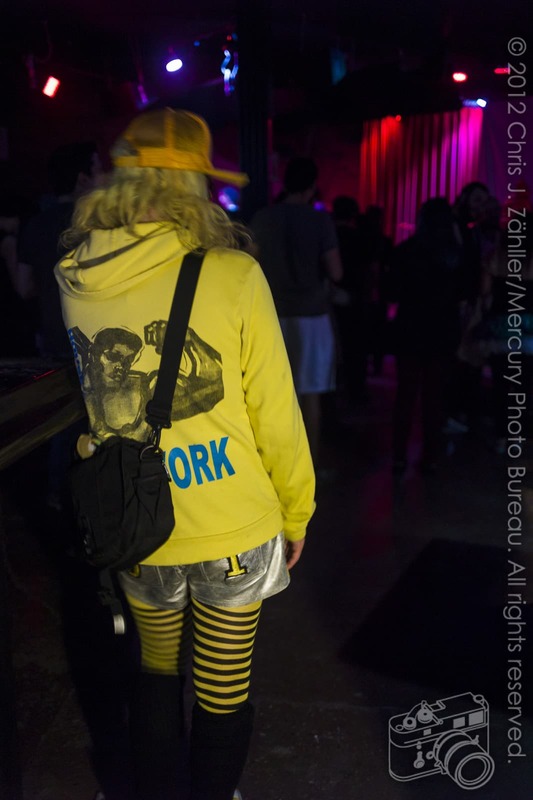 So he asked me to call back in 10 min­utes when he could switch dri­vers. 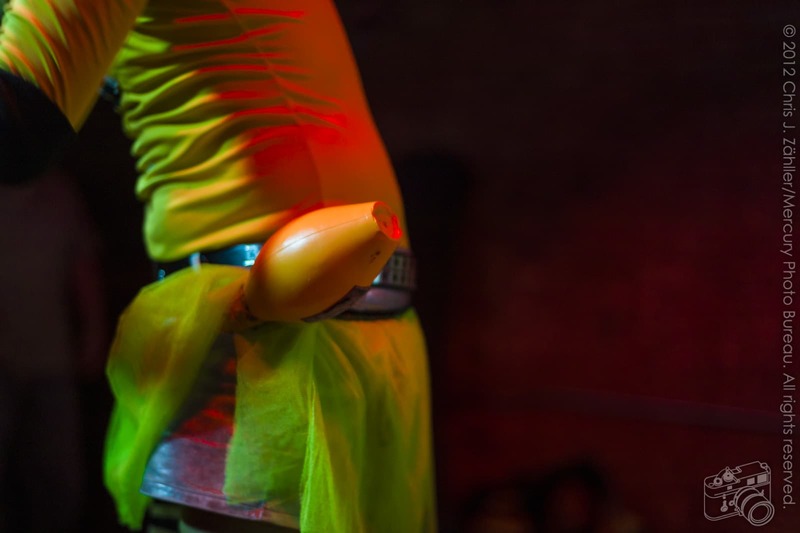 The 2nd time I called, he asked for a few more min­utes because he needed to do some­thing you might have to do dur­ing any long trip (I’ll leave that to your imag­i­na­tion). 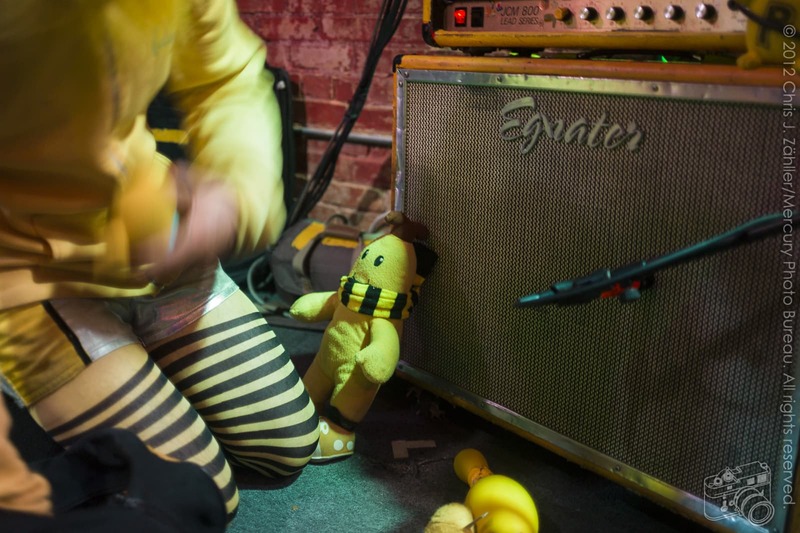 So he wound up call­ing me back, and when I answered, I for­got to press the record but­ton. 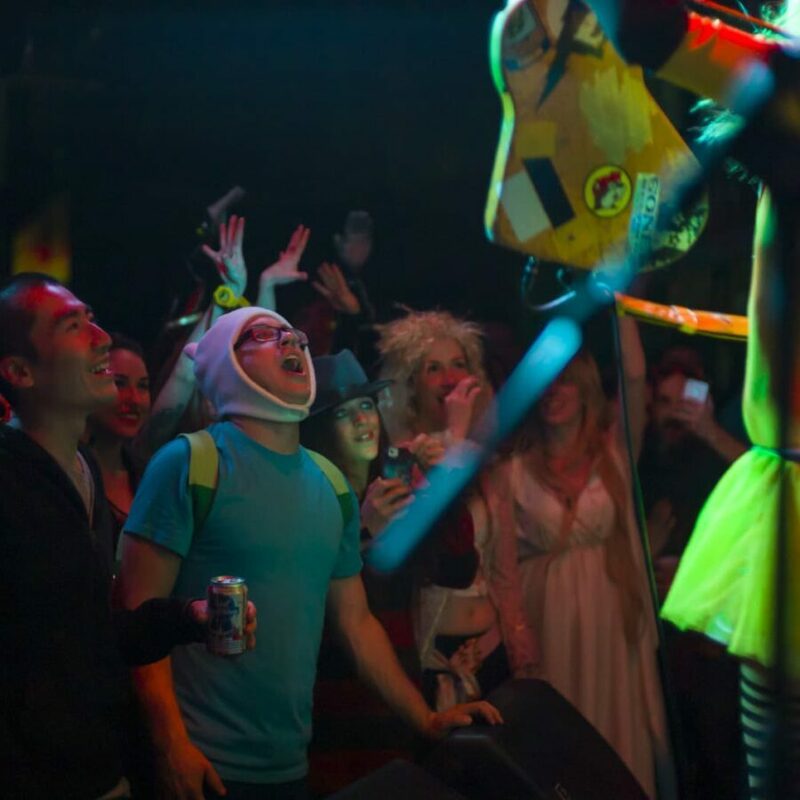 The fol­low­ing is there­fore recre­ated from my notes. 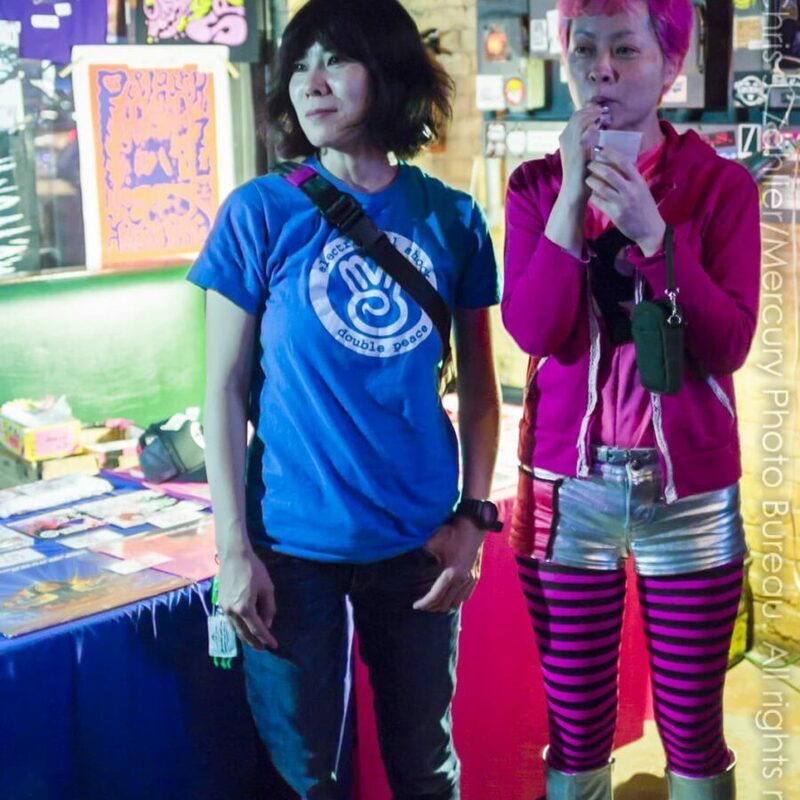 Mercury Photo Bureau Hello, Kengu-san. 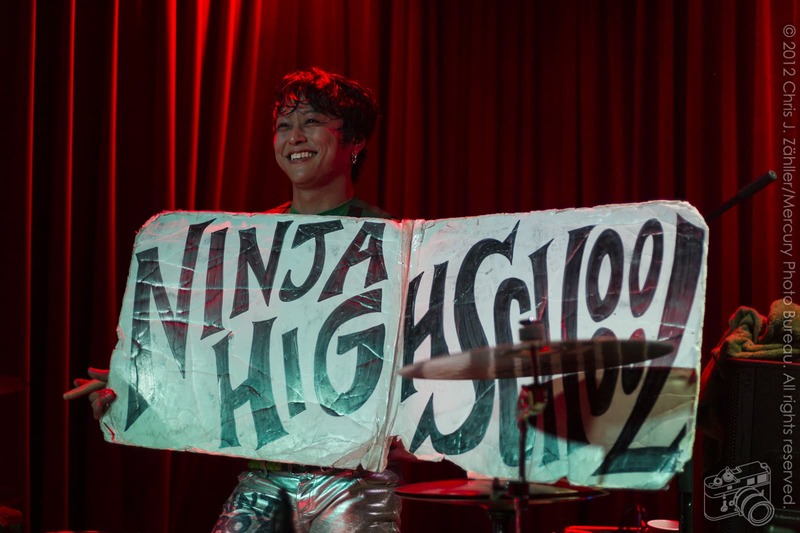 Thanks for tak­ing my ques­tions! 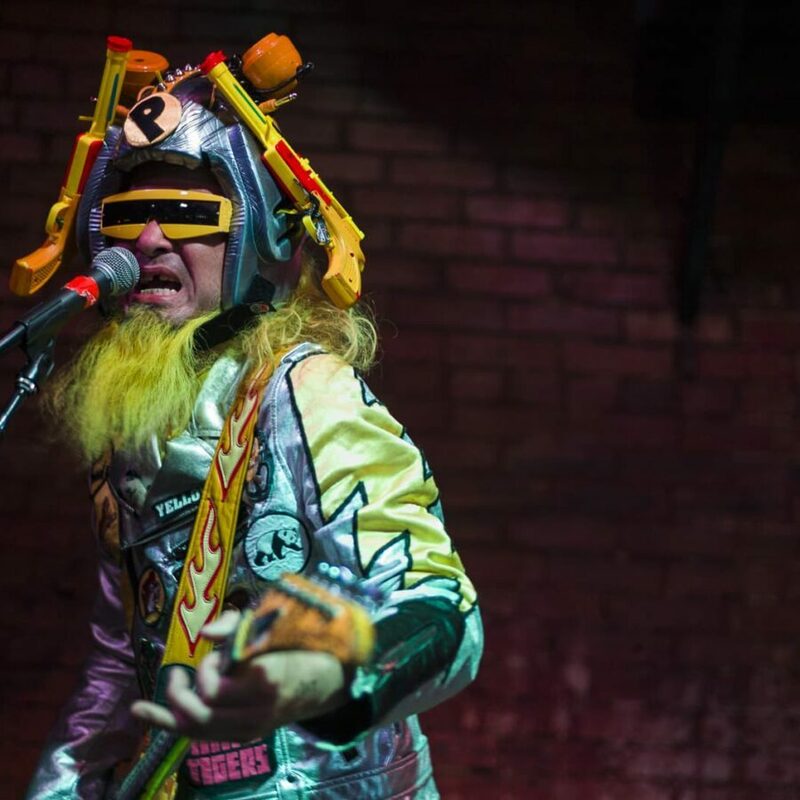 MPBEvery inter­view with you that I’ve read starts with “Where is Planet Peelander?” to which you invari­ably reply, “Don’t try to find it, feeeel it.” Human nature being what it is, when we’re told not to do some­thing, our 1st impulse is to do exactly that. 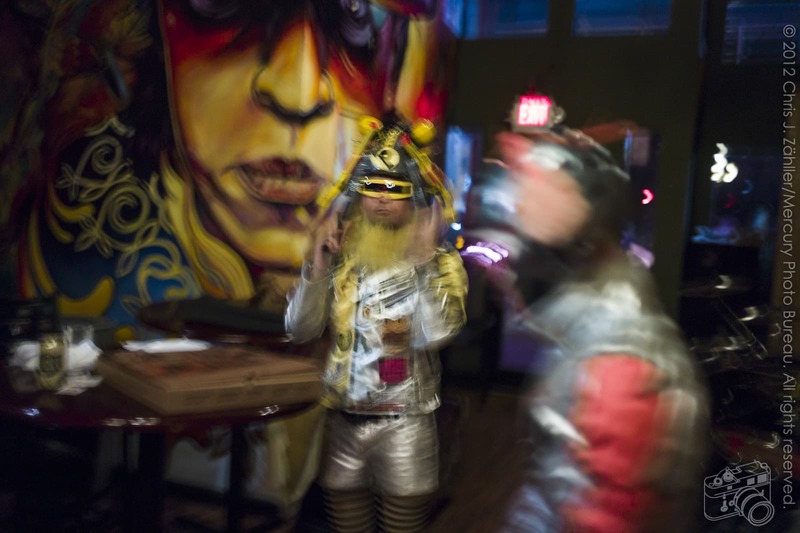 Have you thought about using reverse psy­chol­ogy the next time some­one asks you this? 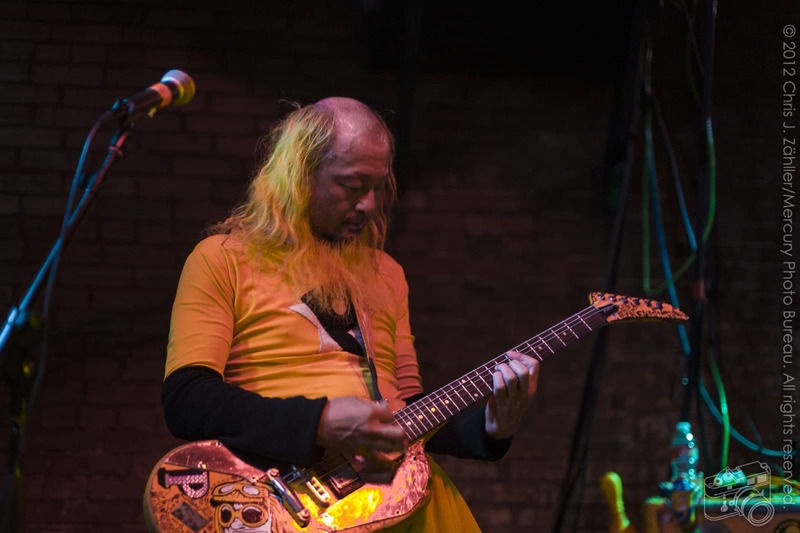 Peelander YellowWhen you want some­thing very badly — you try very hard to get it, but it won’t hap­pen. 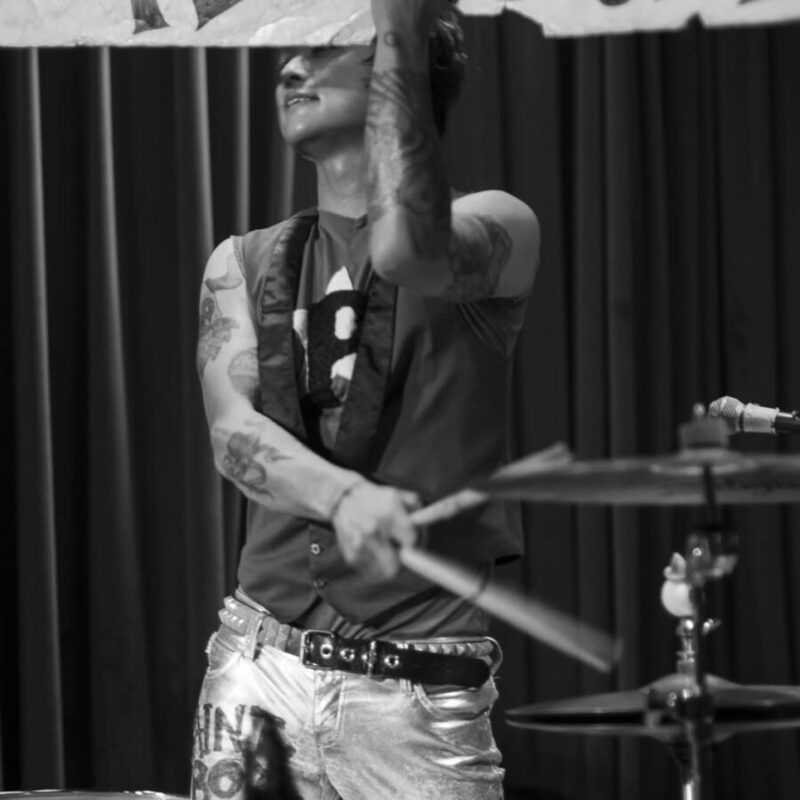 Better to stop try­ing and just let it come to you. 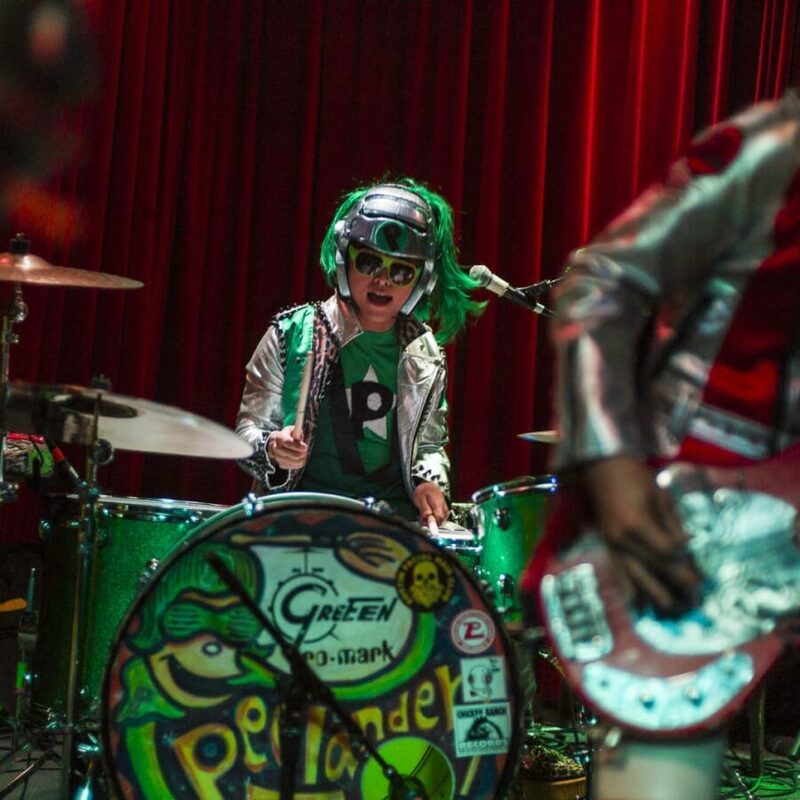 Planet Peelander is like that. 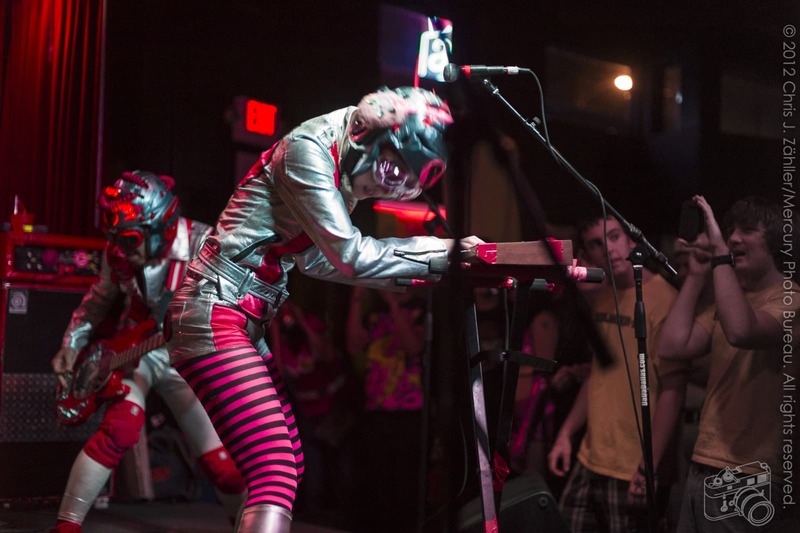 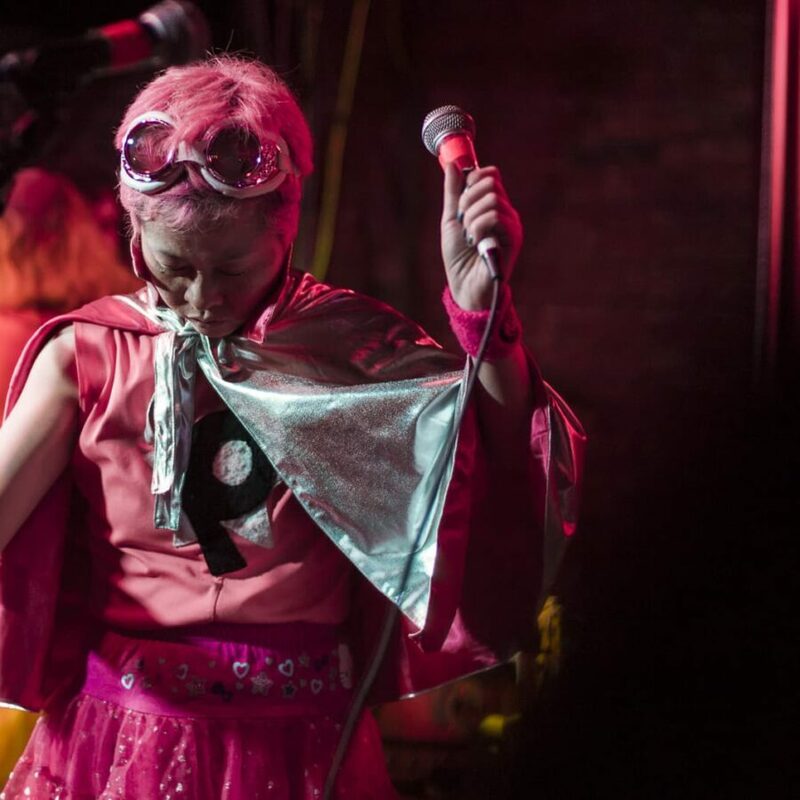 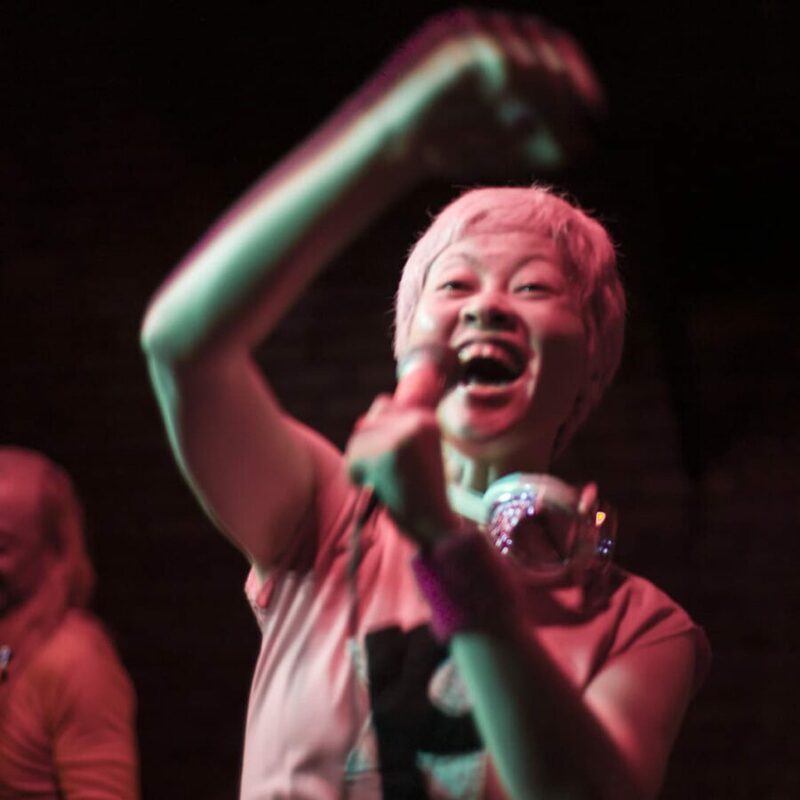 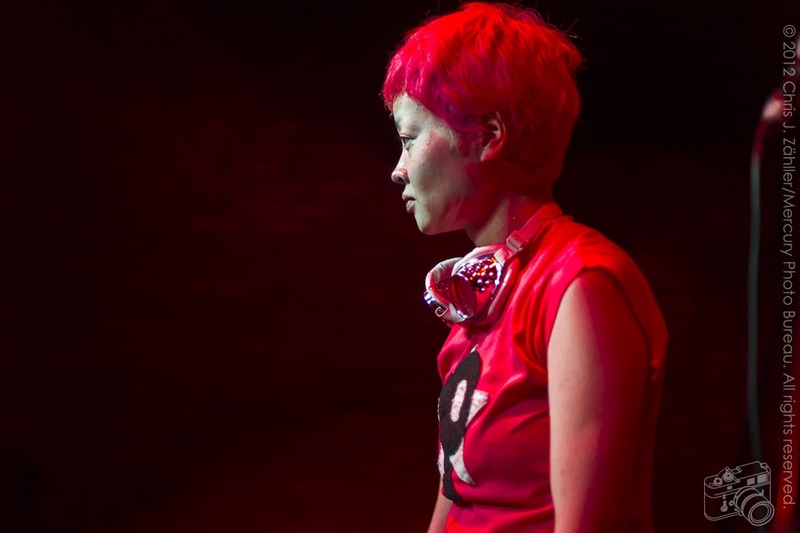 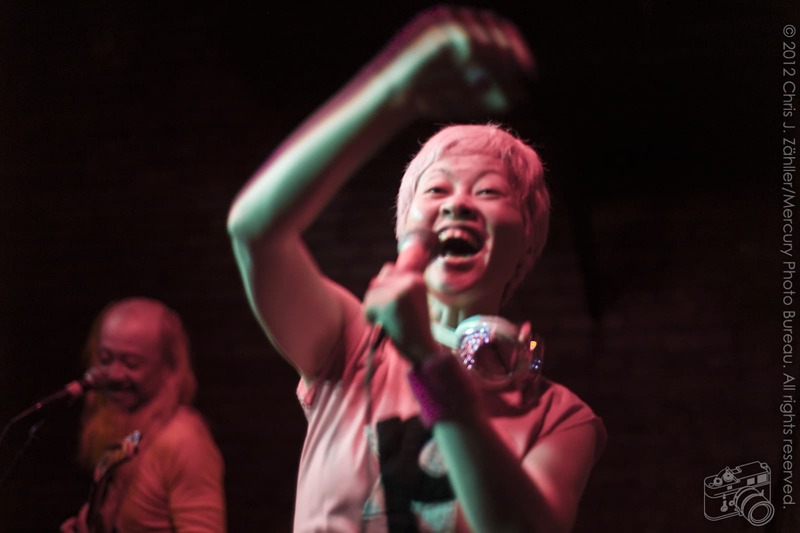 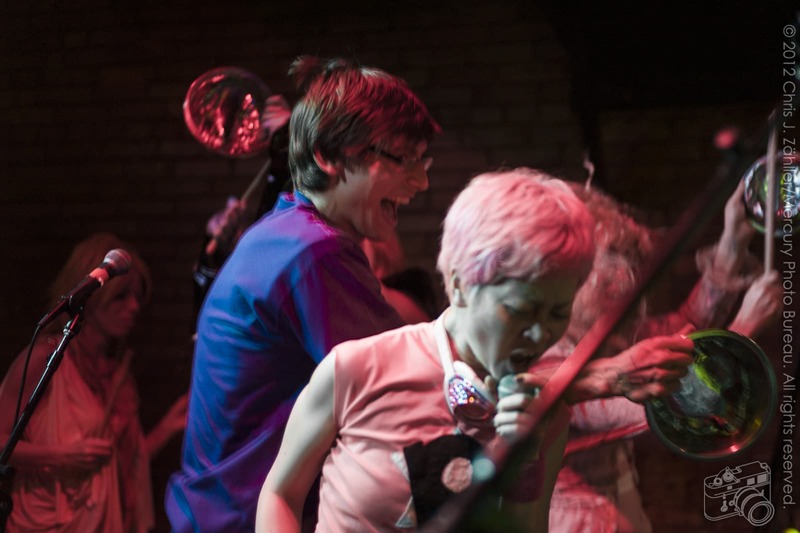 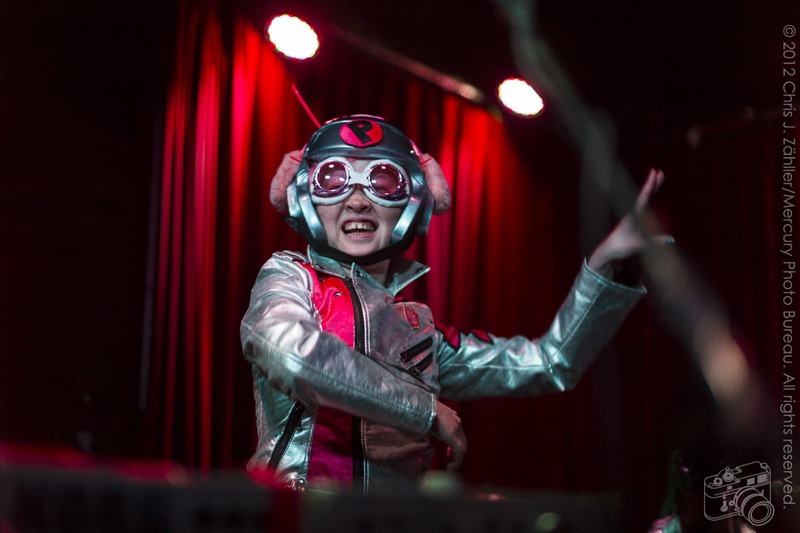 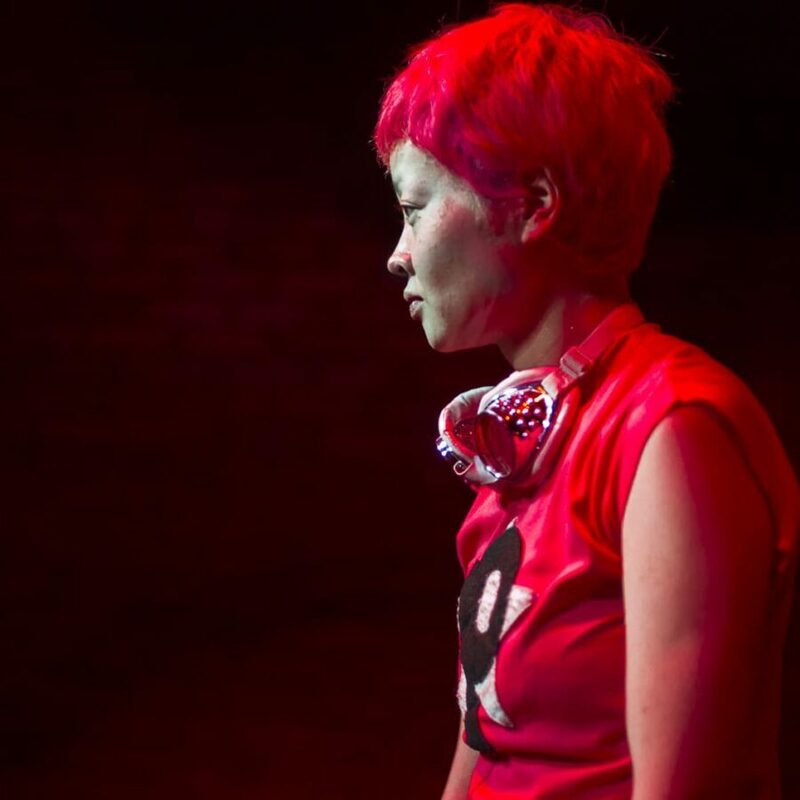 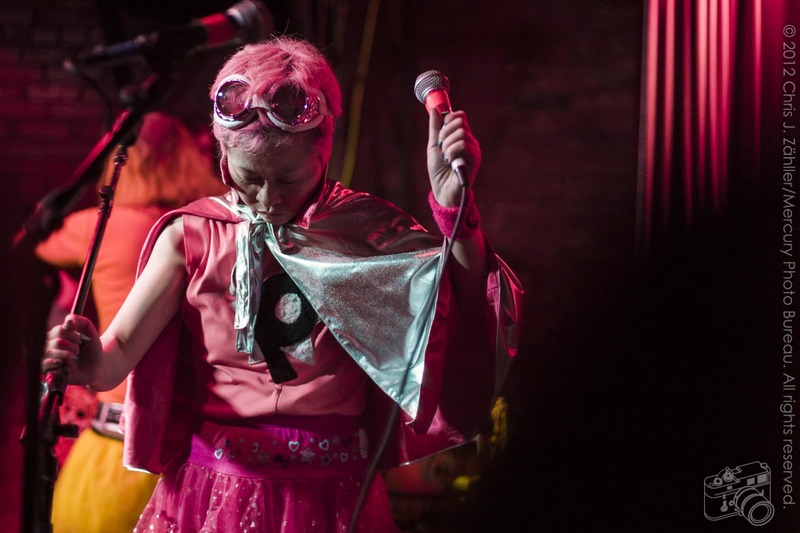 You can­not find Planet Peelander. 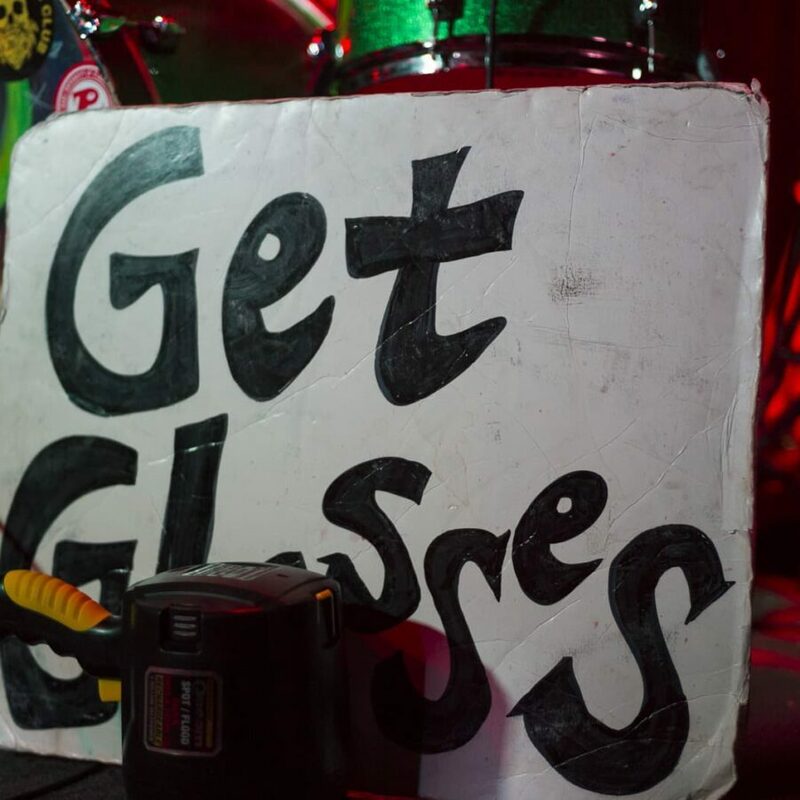 You must feeeeel it. 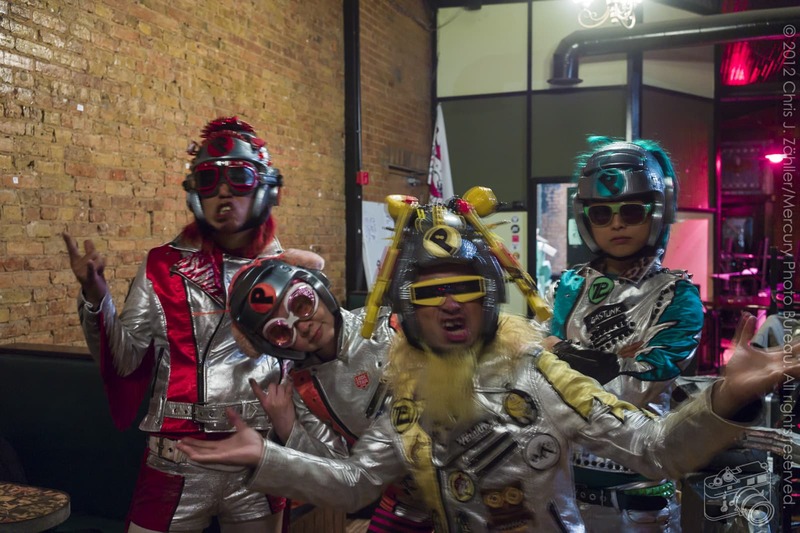 MPBWas there some sport or activ­ity like Earth wrestling that you liked before you came to our planet, or were you always fans of Earth wrestling, even before the jour­ney across space? 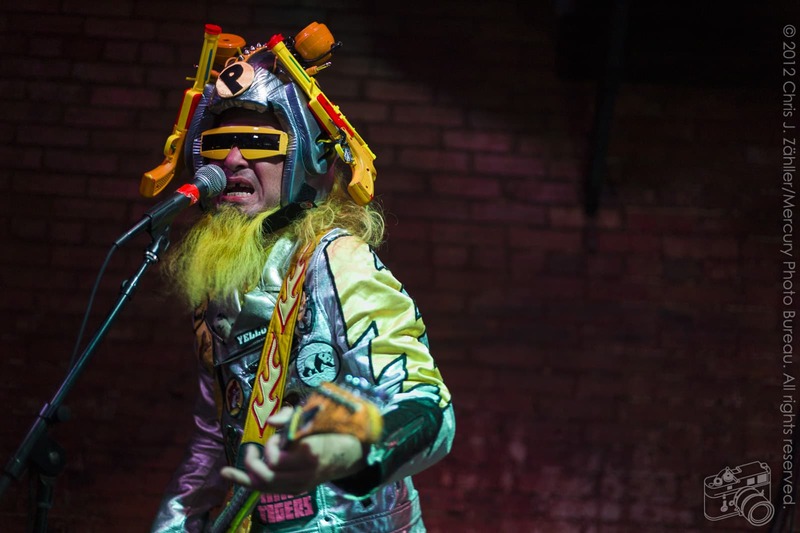 Peelander YellowWe didn’t have pro­fes­sional wrestling on Planet Peelander. 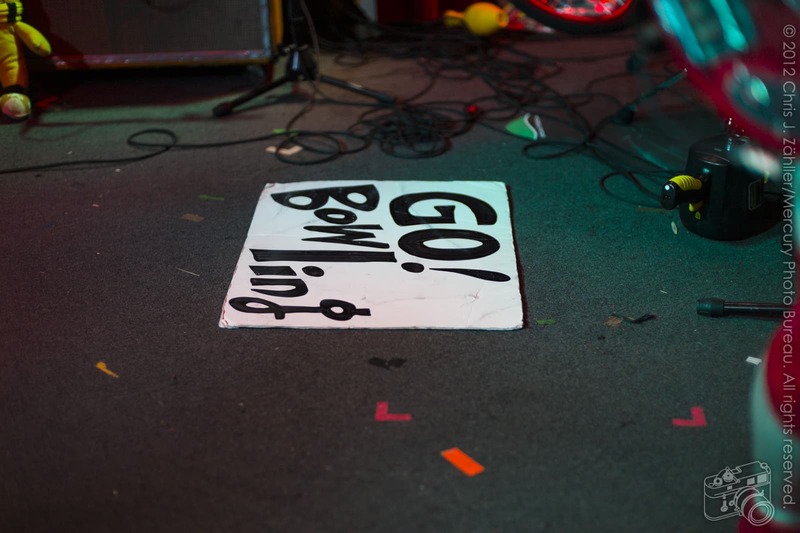 We do other sports, like fly­ing — peo­ple are very light there; they float. 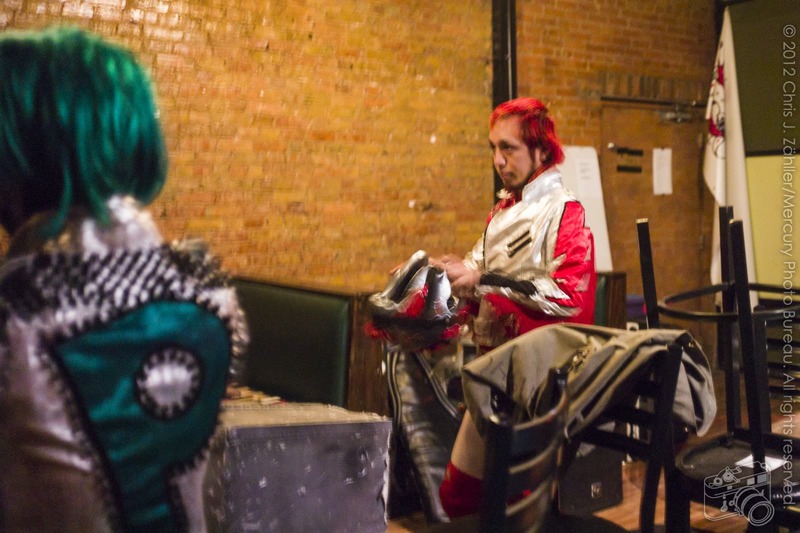 We dis­overed [pro­fes­sional] wrestling after we came to Earth. 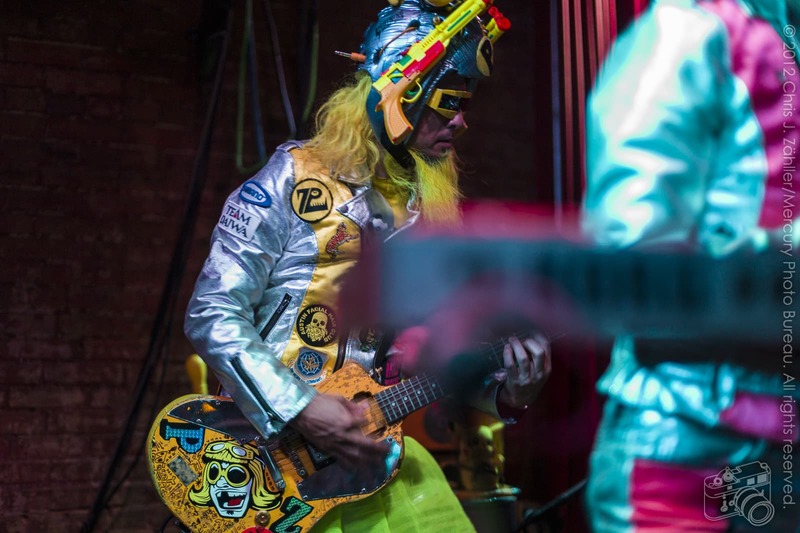 MPBDo Planet Peelander natives share your col­ors, or is each 1 unique? 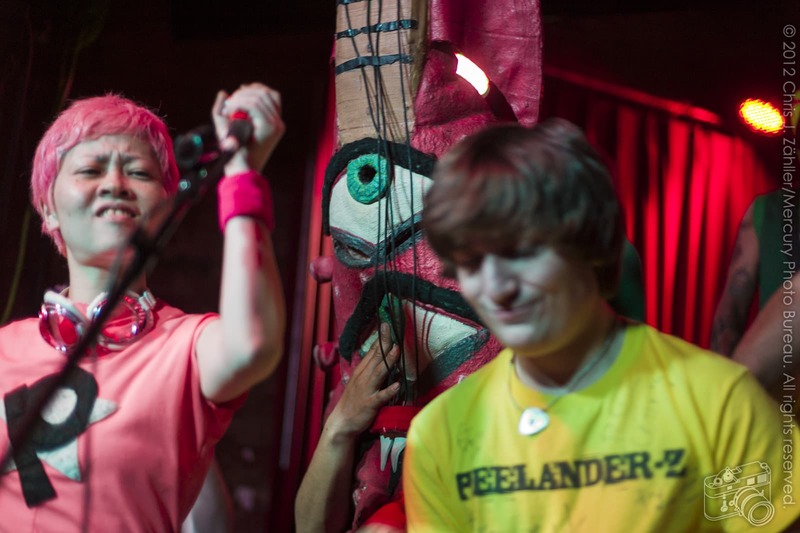 Is there a Peelander Fuschia-with-a-touch-of-orange-but-only-in-a-certain-light, or a Peelander Magenta-almost-maroon-but-not-quite? 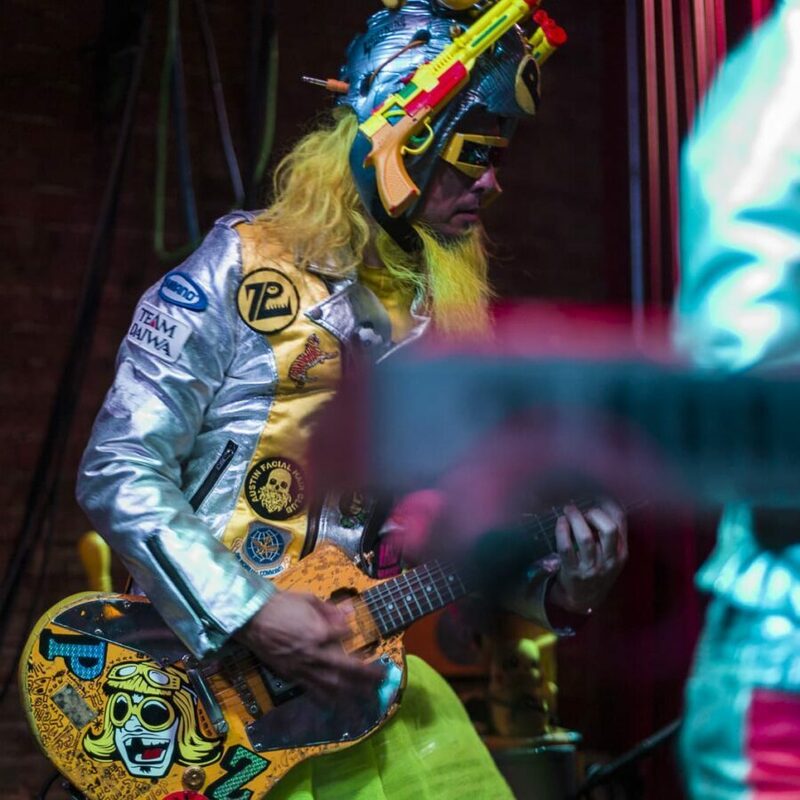 Peelander YellowAll dif­fer­ent, and not just col­ors: you could be Peelander Mountain, or Peelander Rainbow, or Peelander Flower. 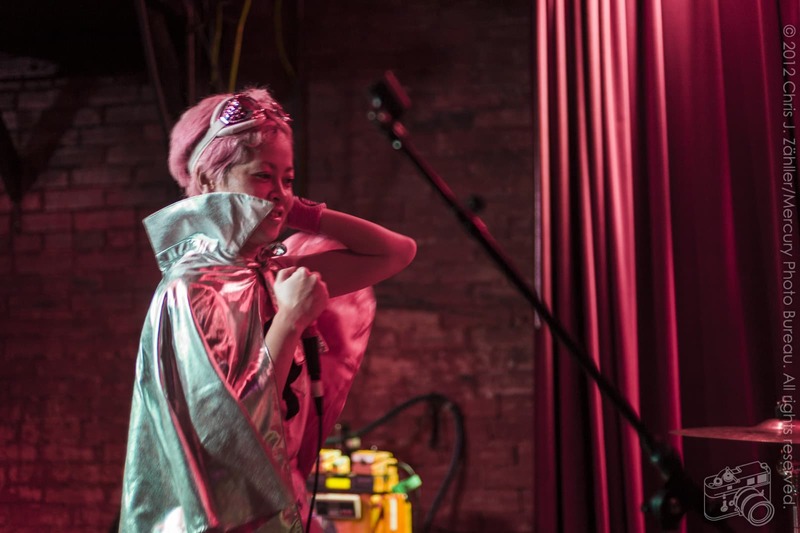 Your name describes your inner per­son, and your skin shows your per­son­al­ity. 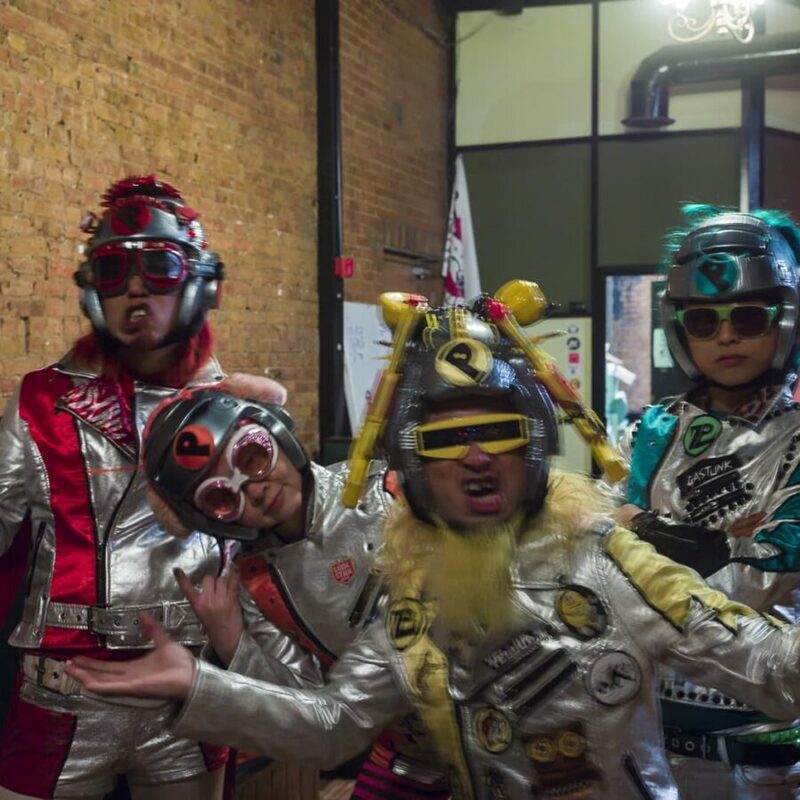 When we came to Earth, we thought every­one was the same [as each other], because they all look sim­i­lar. 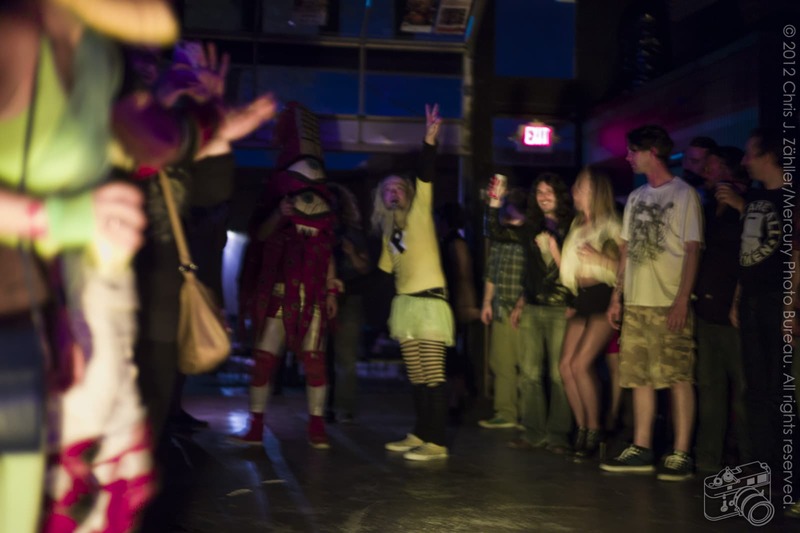 We dis­cov­ered that, inside, each per­son is very dif­fer­ent; it doesn’t show as much on the out­side. 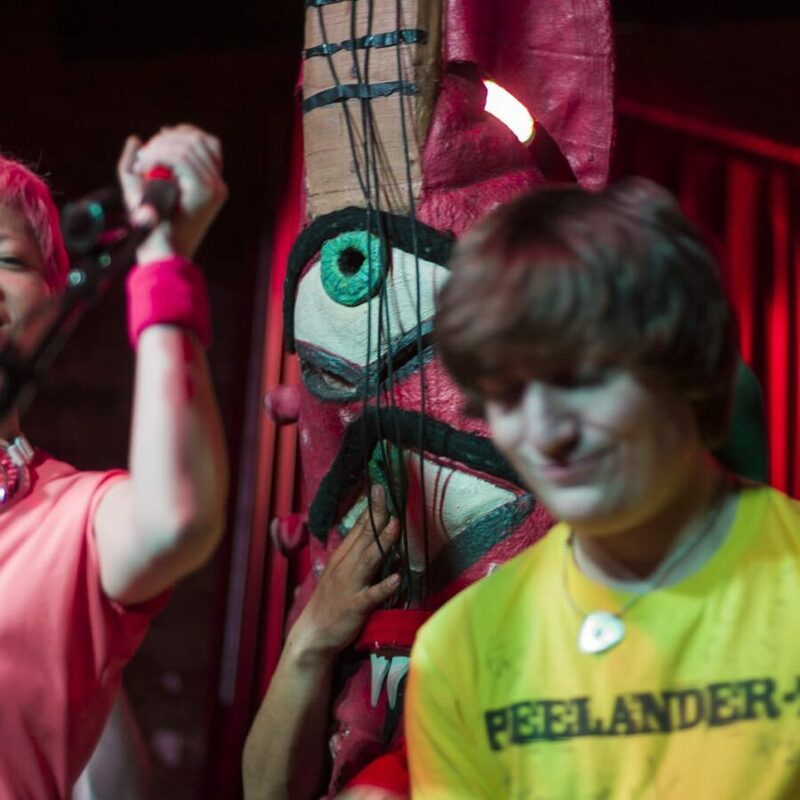 MPBHow did you meet Peelander Pink? 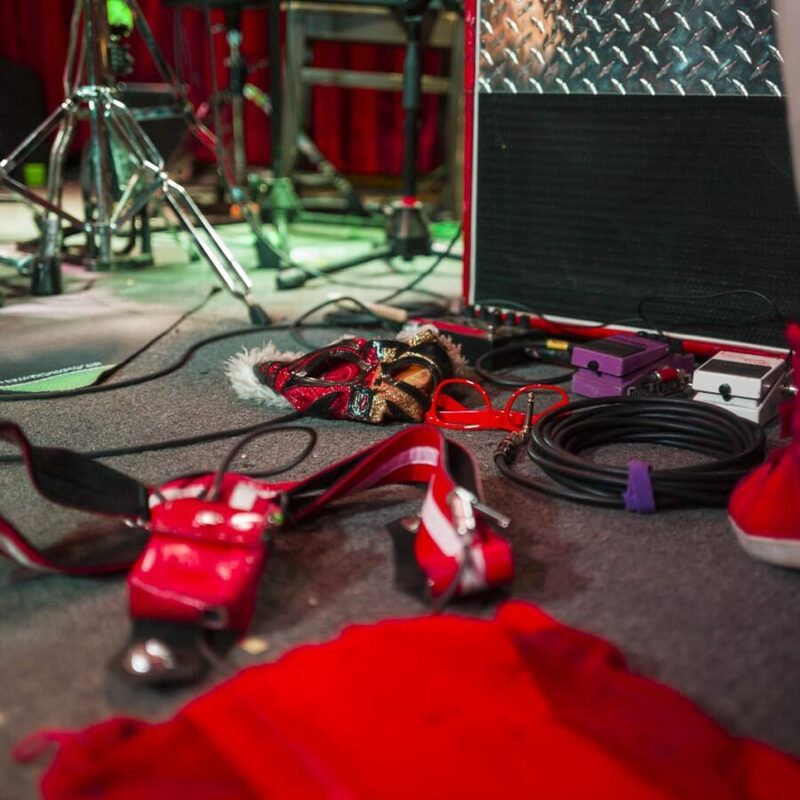 — and when did she join the band? 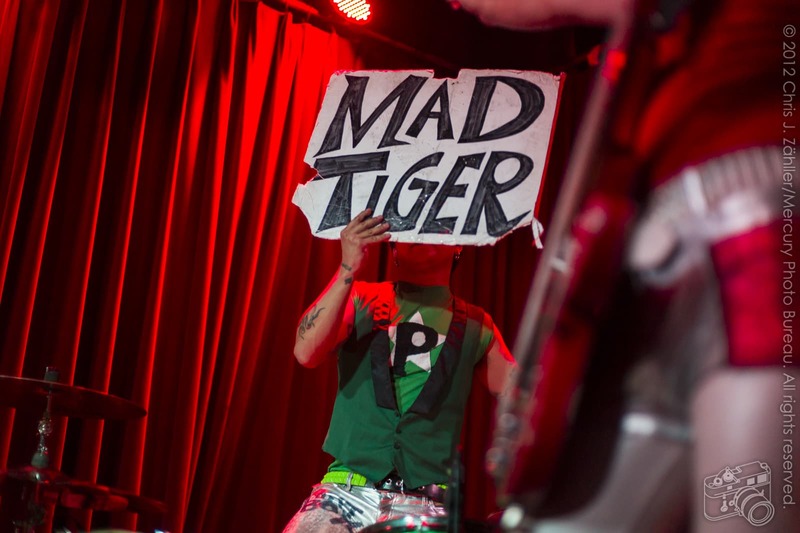 Peelander YellowAh, you’ve seen the YouTube videos? 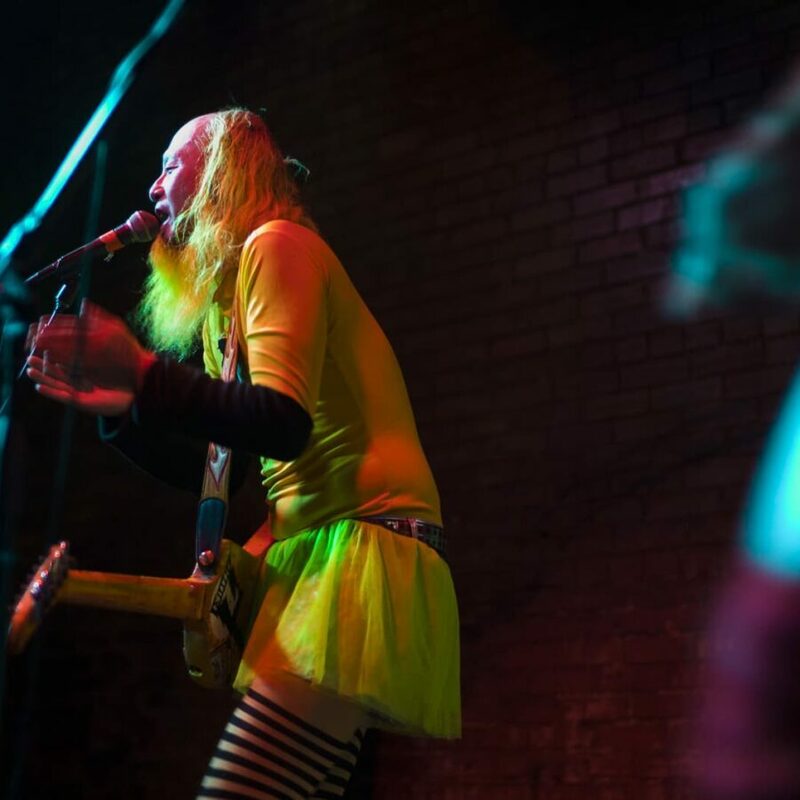 If you see Peelander Pink, it means you are a good per­son. 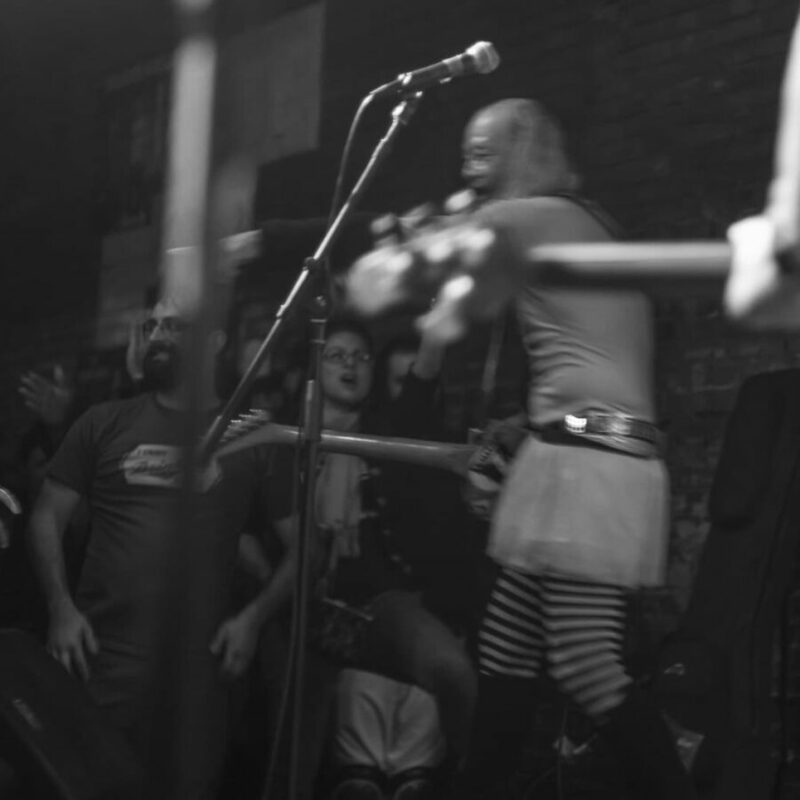 Only good peo­ple can see her! 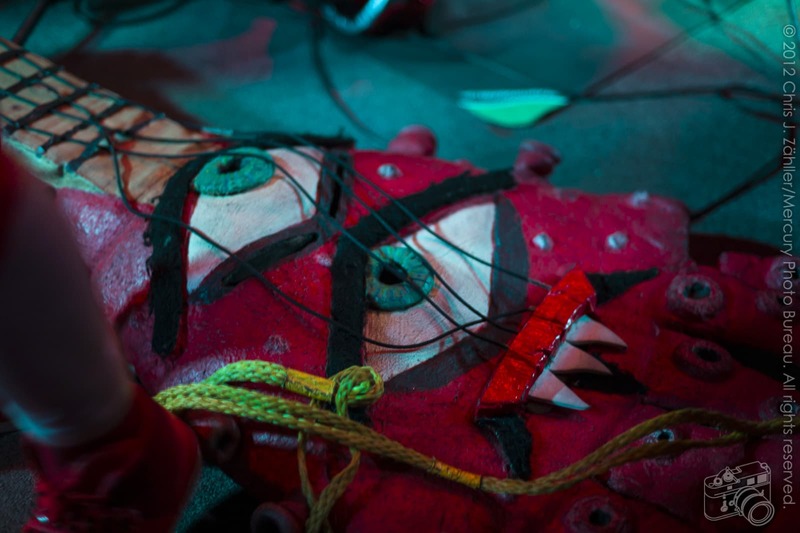 MPBI used to watch Gigantor in the 1960s. 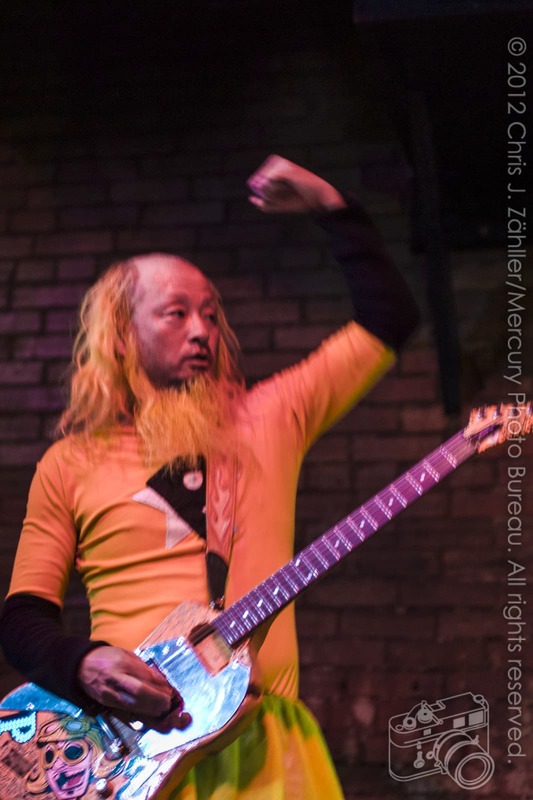 Did any of you grow up with Tetsujin Nijūhachi-gō ( Tetsujin 28-gō )?﻿ 鉄人28号 . 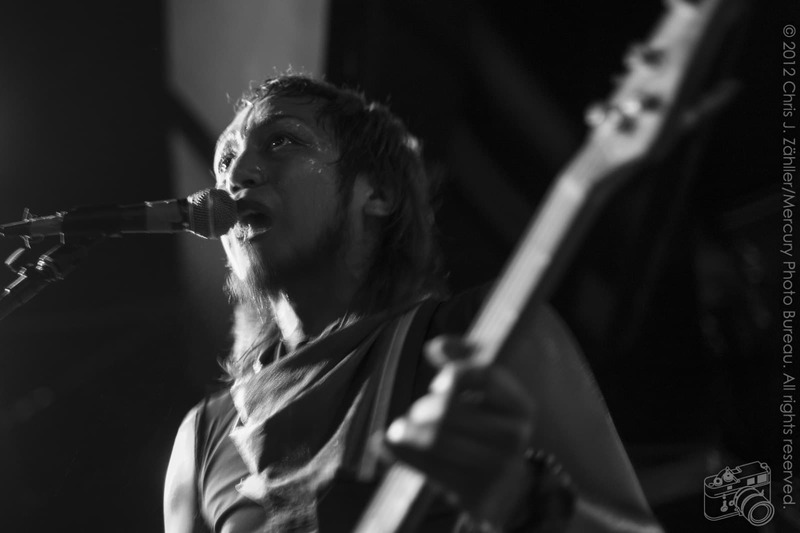 MPBThe happy life cer­e­mony, a.k.a. 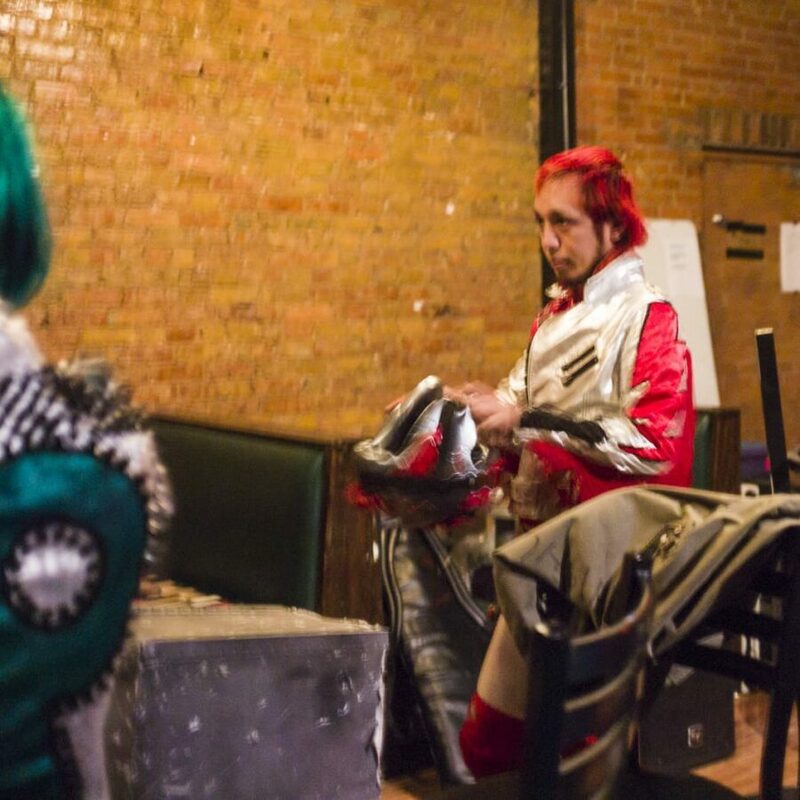 human bowl­ing: is that native to Planet Peelander, or did you cre­ate it after com­ing to the shores of Manhattan? 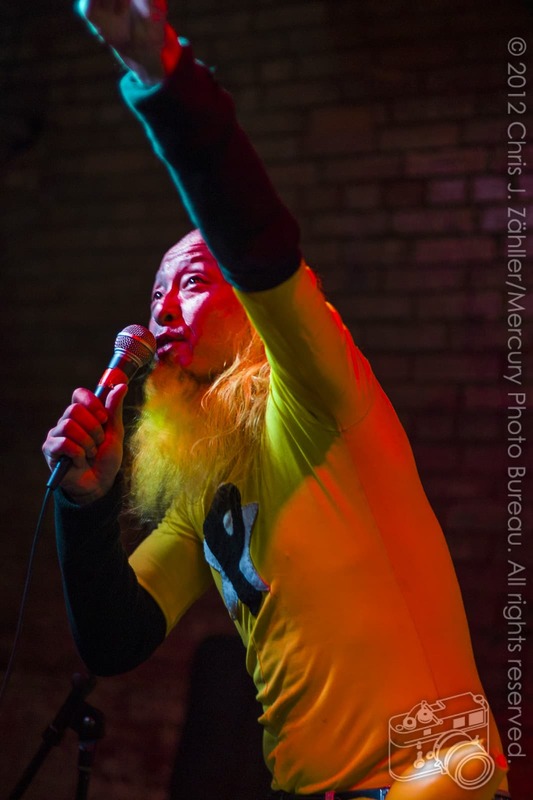 Peelander Yellow That’s from Planet Peelander. 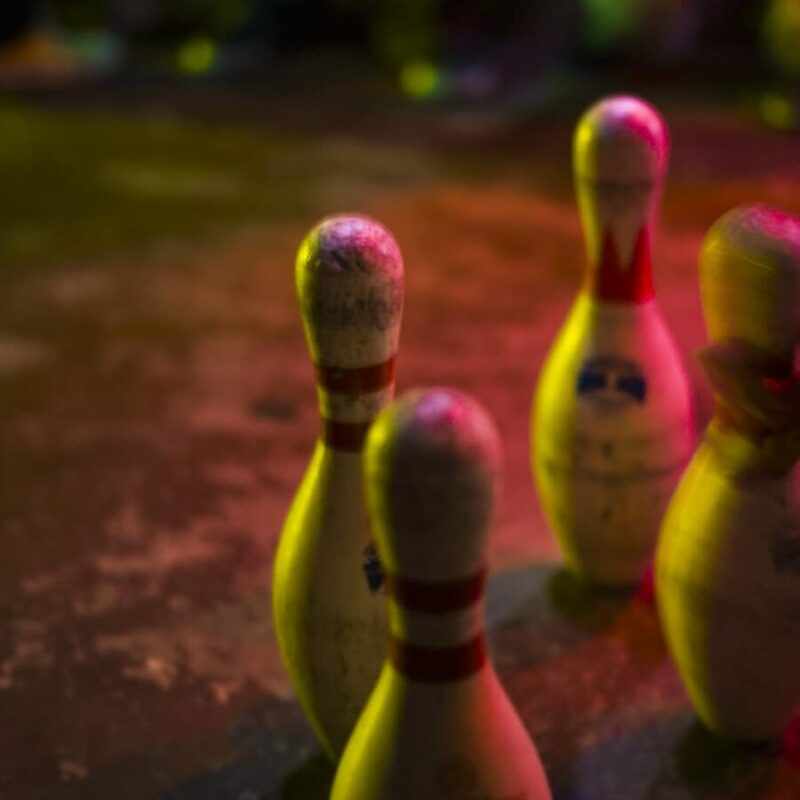 We per­form it when some­thing makes us happy. 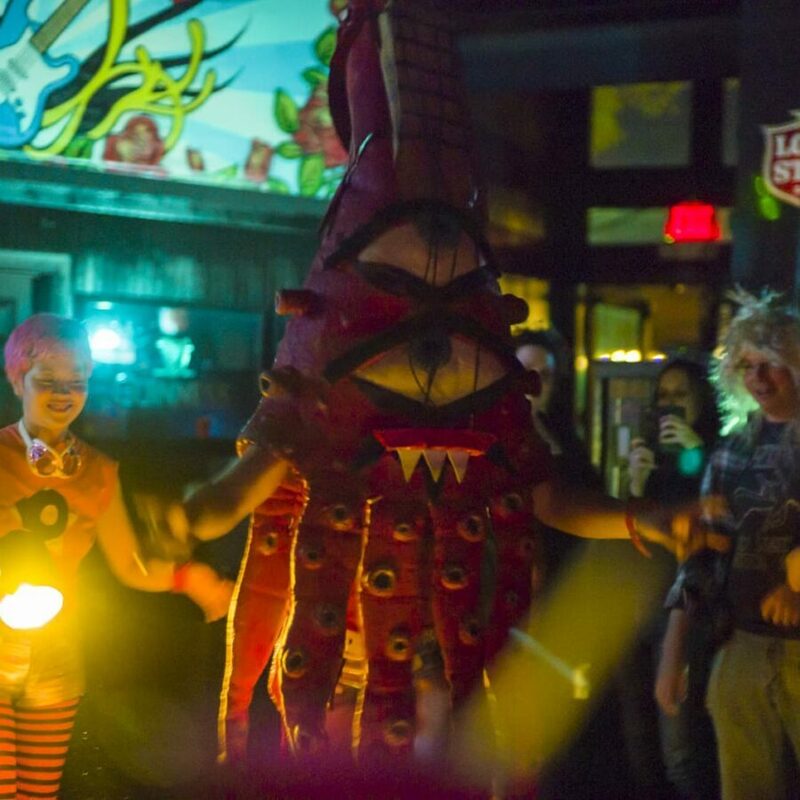 Also, it makes peo­ple smile, and we eat your smiles. 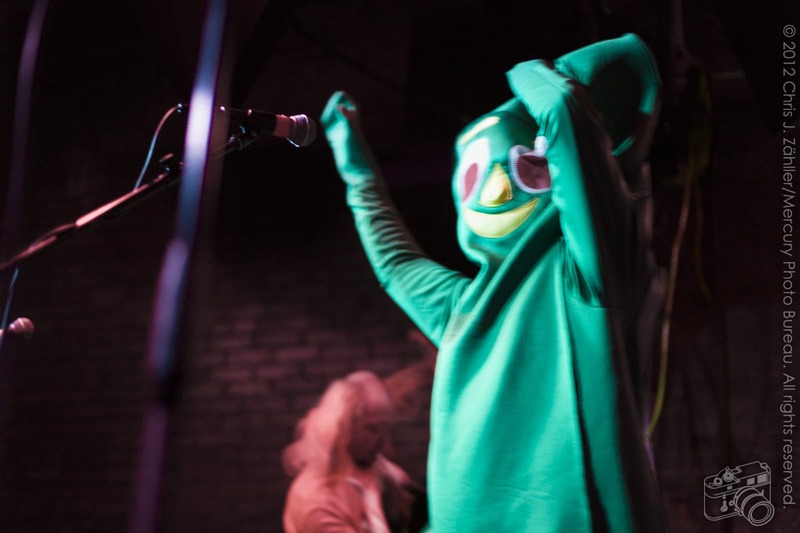 That is our food. 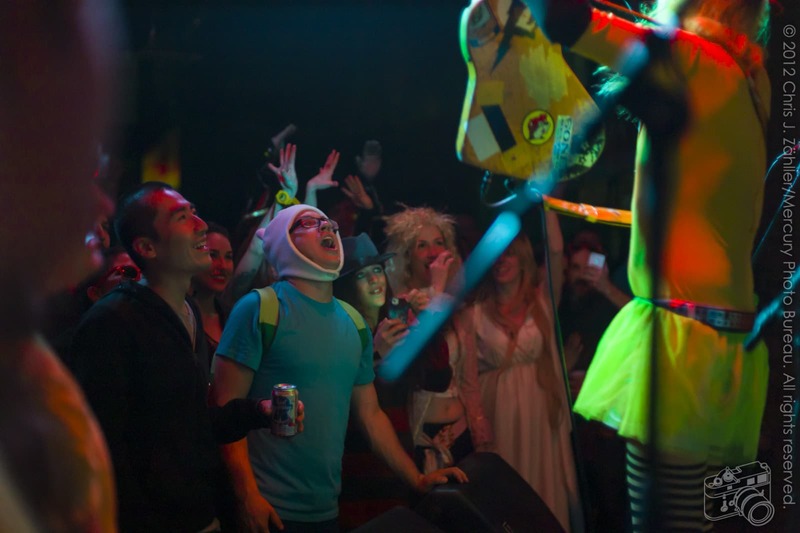 When you smile, you feed us. 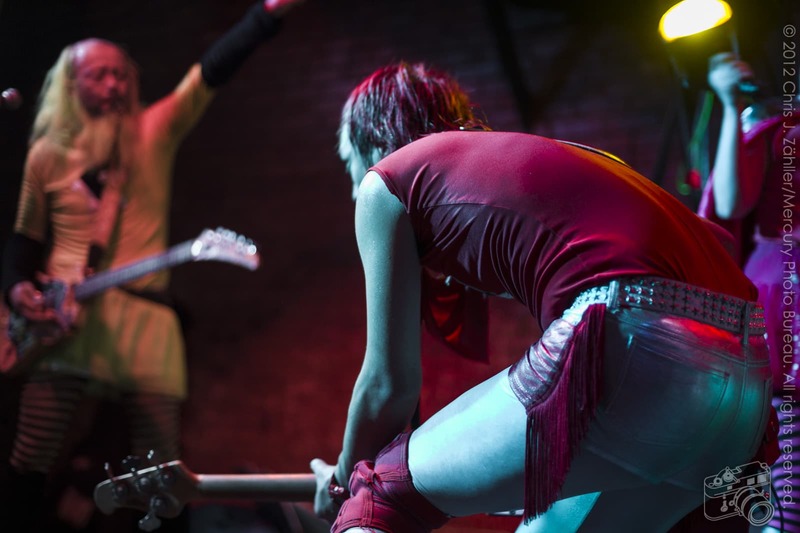 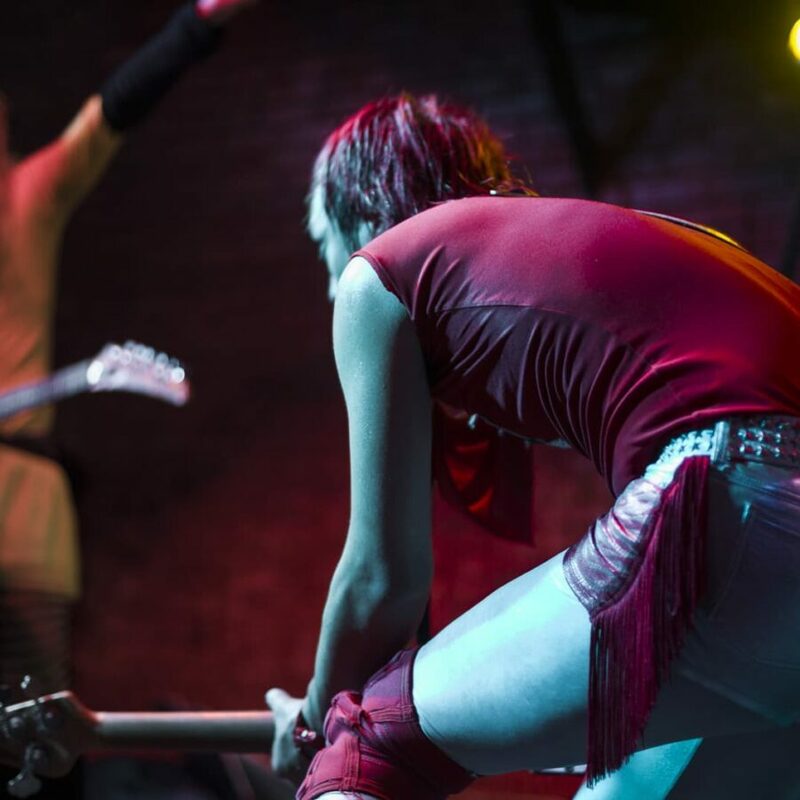 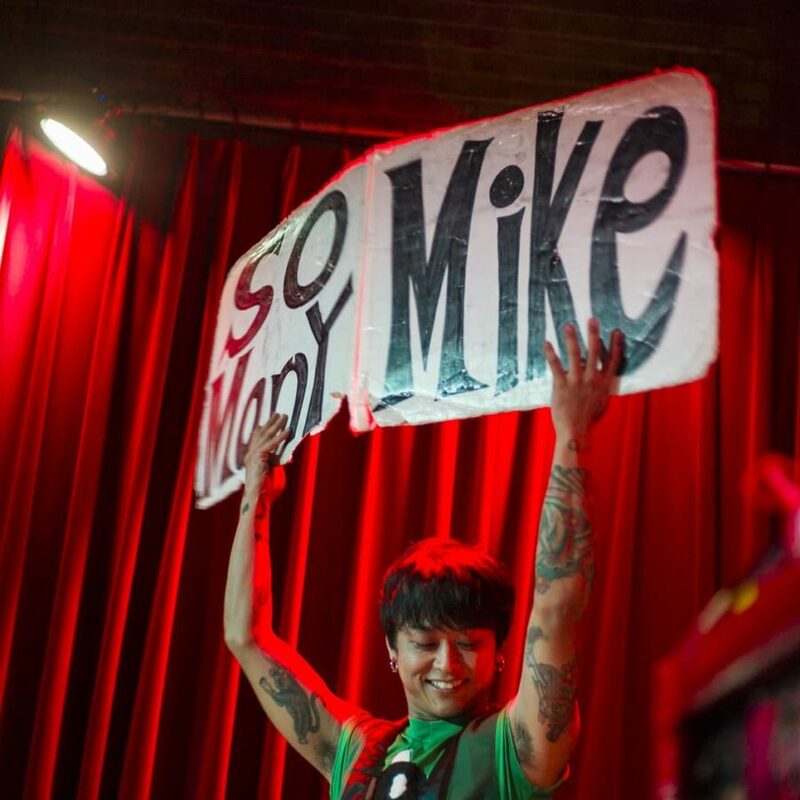 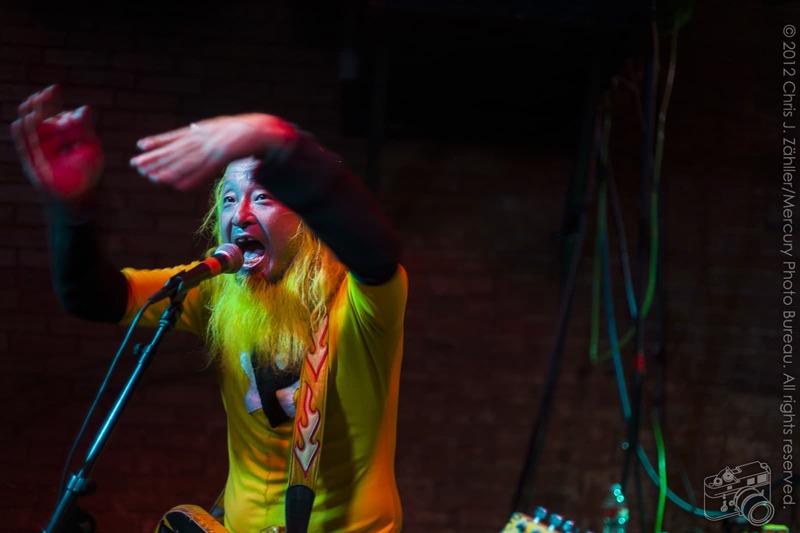 MPBWhy did you and Peelander Red orig­i­nally move to NYC? 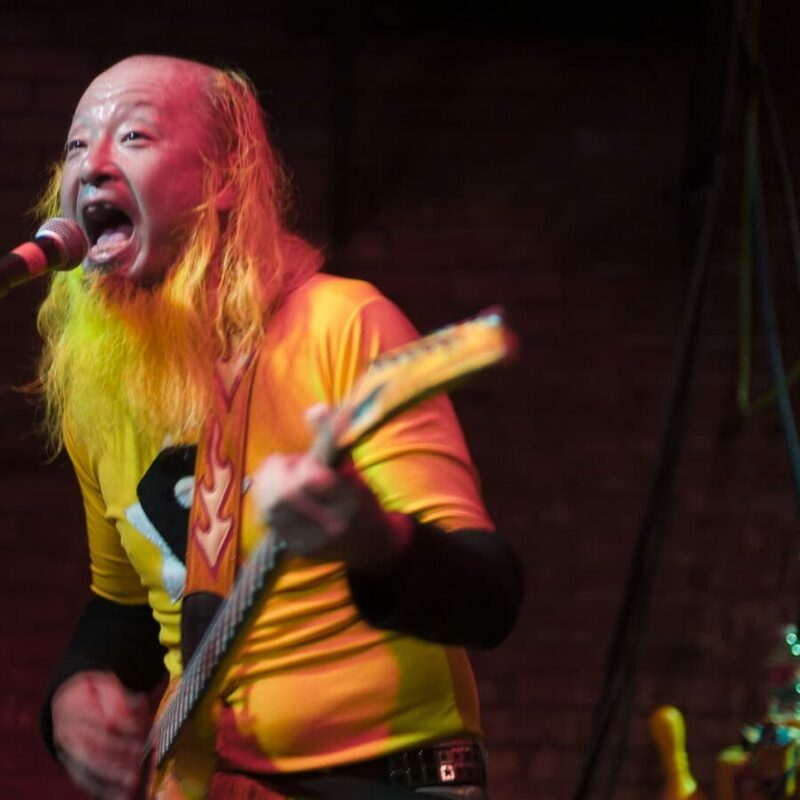 Peelander YellowThere’s a good Japanese restau­rant there! 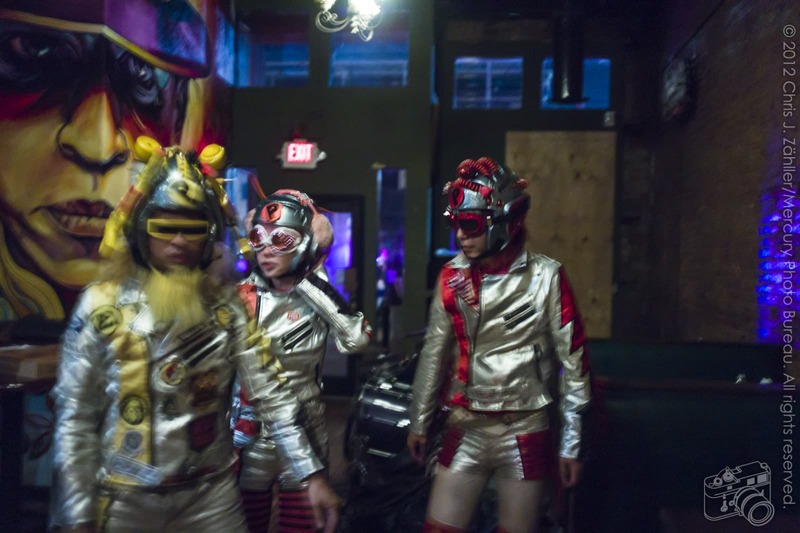 MPBSpeaking of which, chili burg­ers, ice cream, riceball-z, s.t.e.a.k. 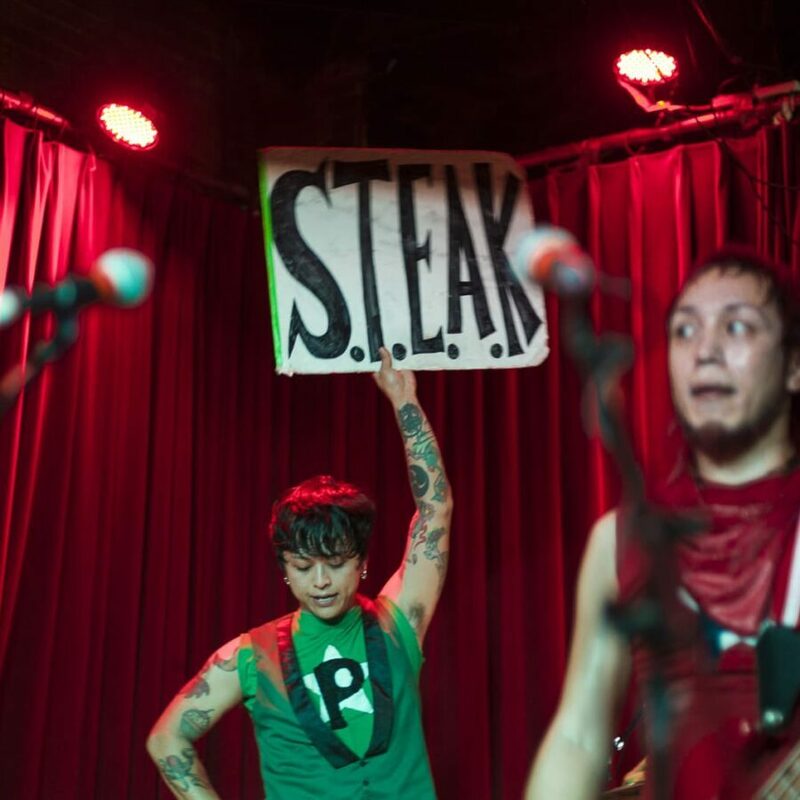 steak, tacos, wasabi. 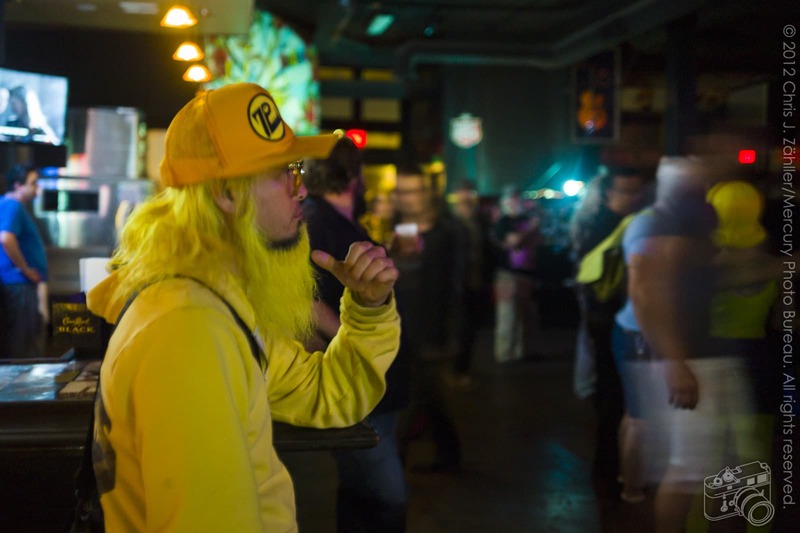 Any other food I should know about? 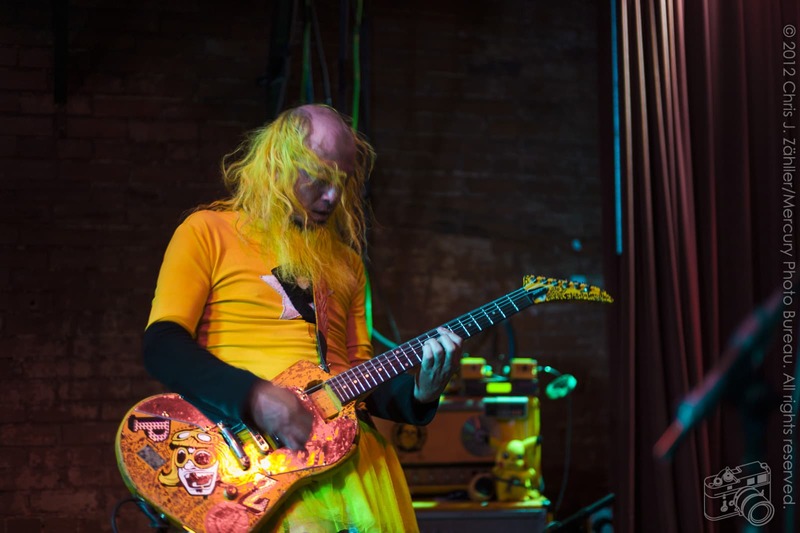 Peelander YellowYes! 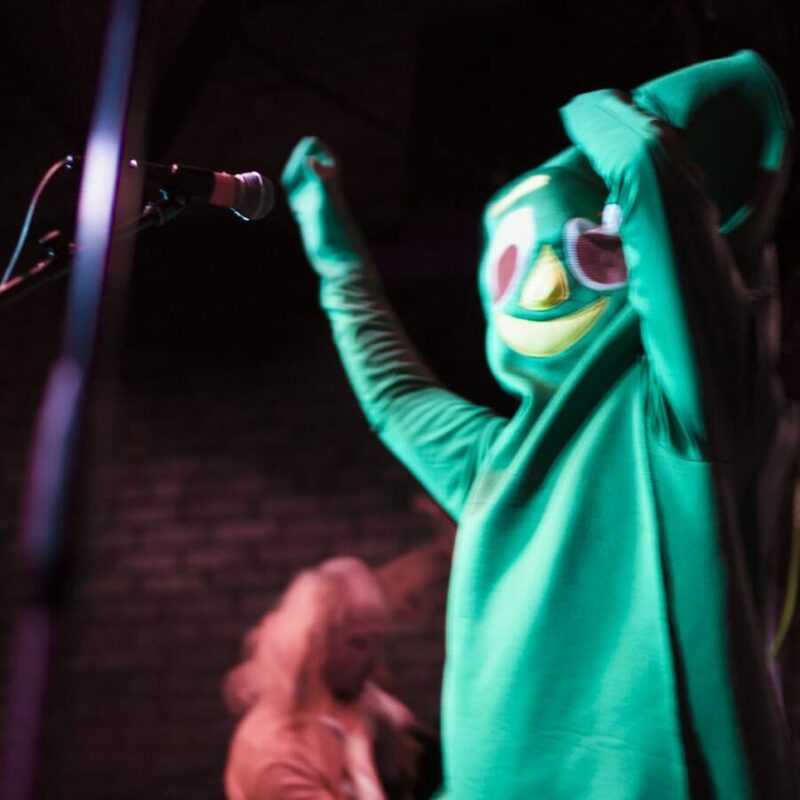 We may have another song about food in our new album. 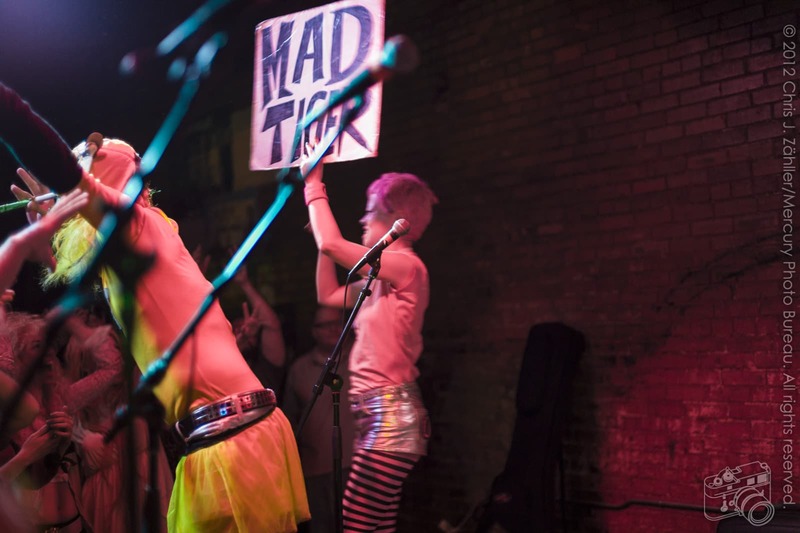 We’ve fin­ished record­ing it, and it should be out next year. 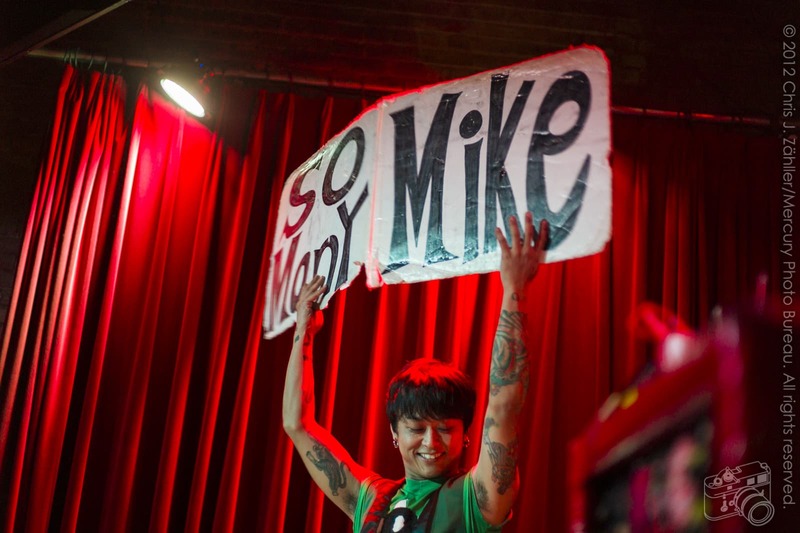 MPBYou 1st began record­ing on ana­log equip­ment, in the 90s. 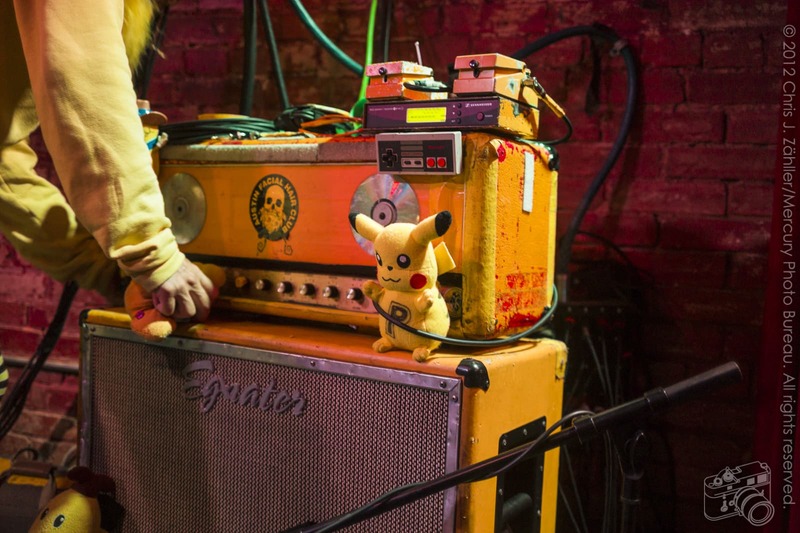 Thinking of Brian Eno’s essay in which he com­plains about the loss of imme­di­acy when soft­ware becomes an inter­me­di­ary, does dig­i­tal tech­nol­ogy help or hin­der your music mak­ing? 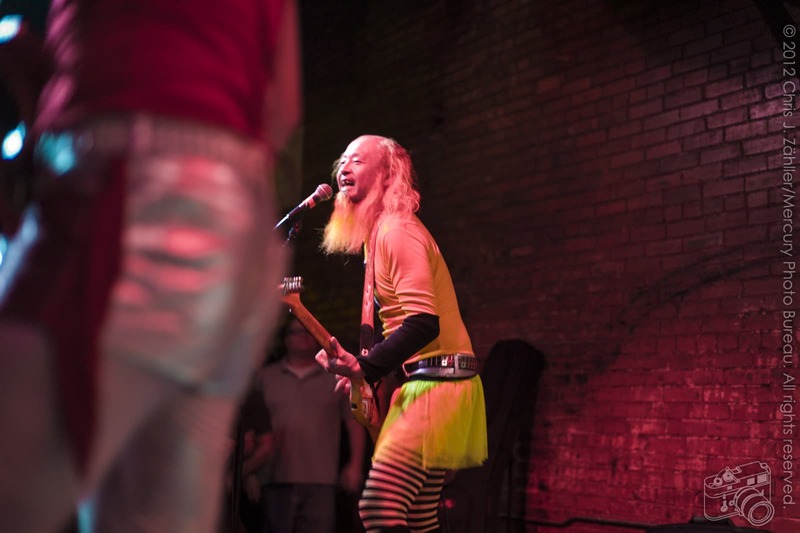 Peelander YellowWe don’t think of it that way. 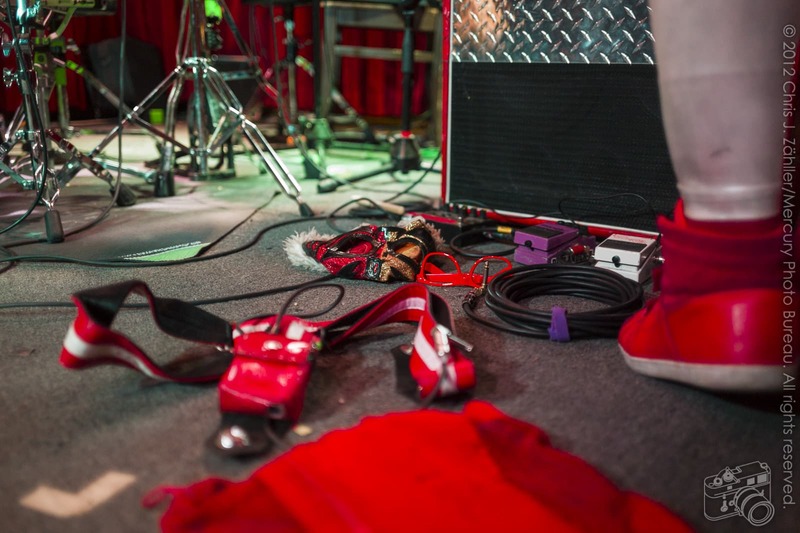 When you have a prob­lem, what do you do? 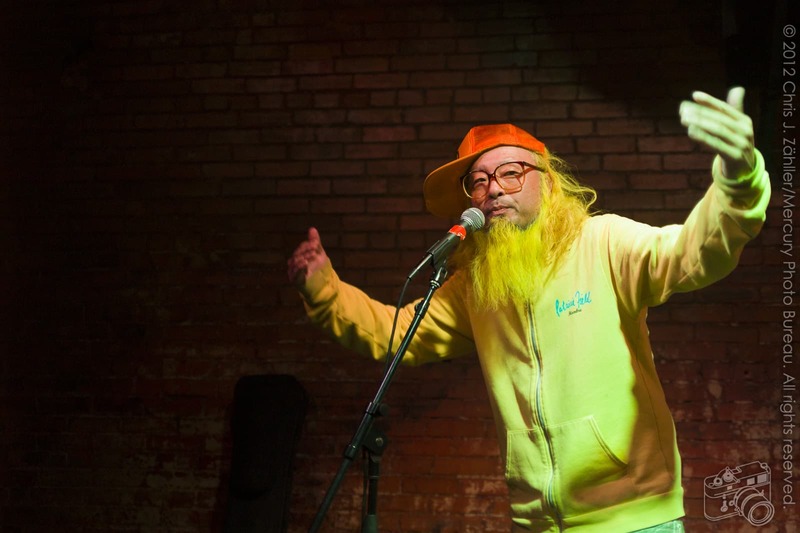 You keep try­ing, and you solve the prob­lem. 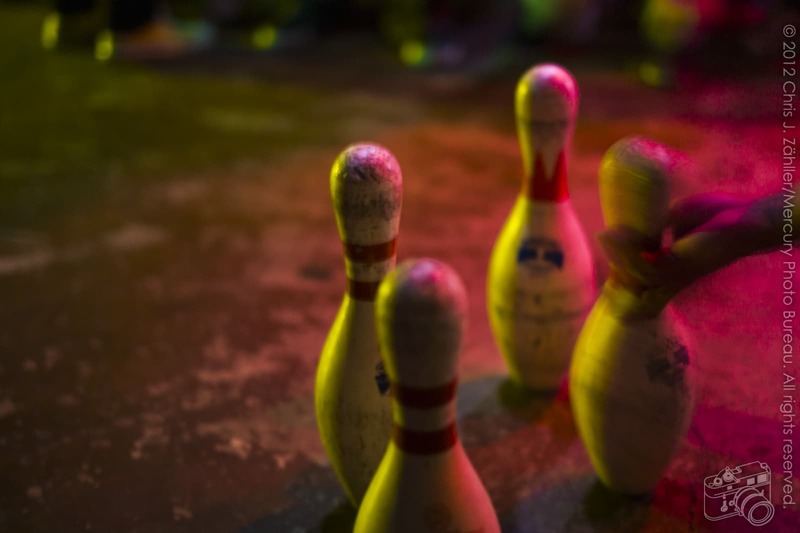 If there is a soft­ware prob­lem, we find a way to work around it. 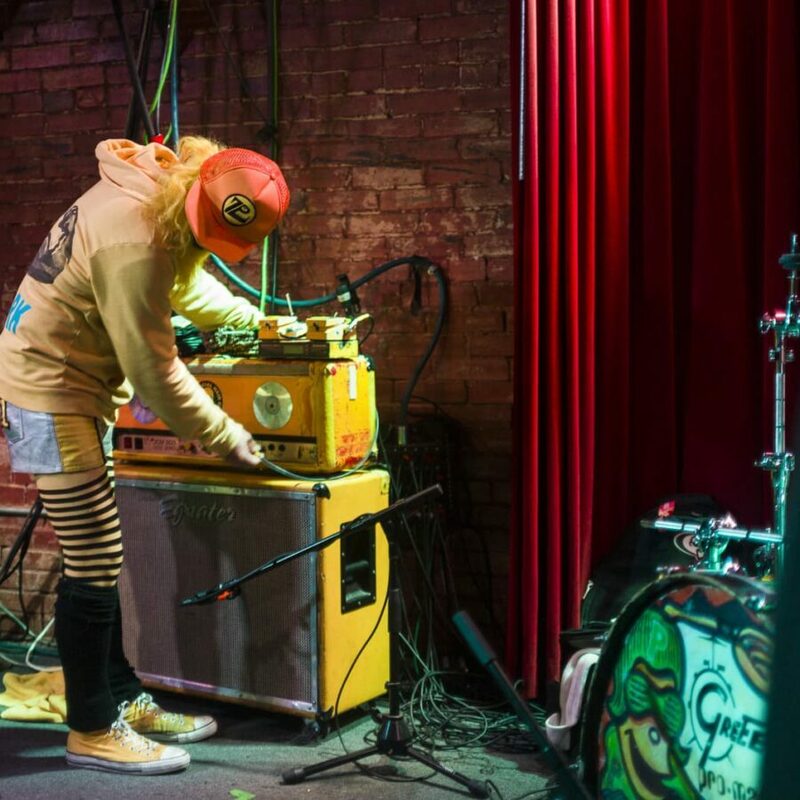 MPBTell me about the food truck in Austin. 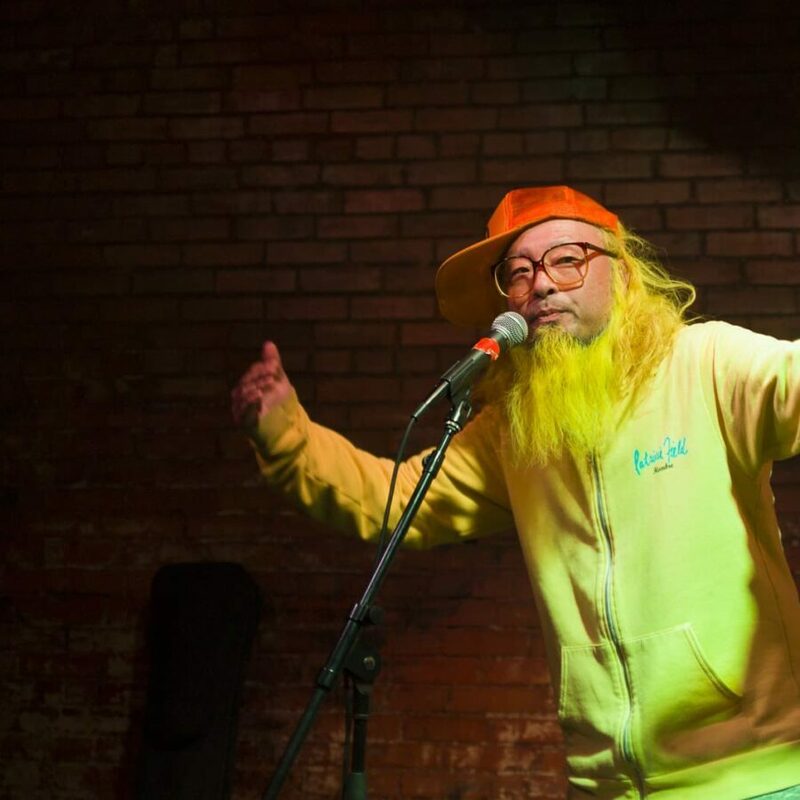 Peelander YellowAh, East Side King﻿ East Side King is owned and oper­ated by Top Chef’s Paul Qui and fel­low chef Motoyasu Utsunomiya.. Good food. 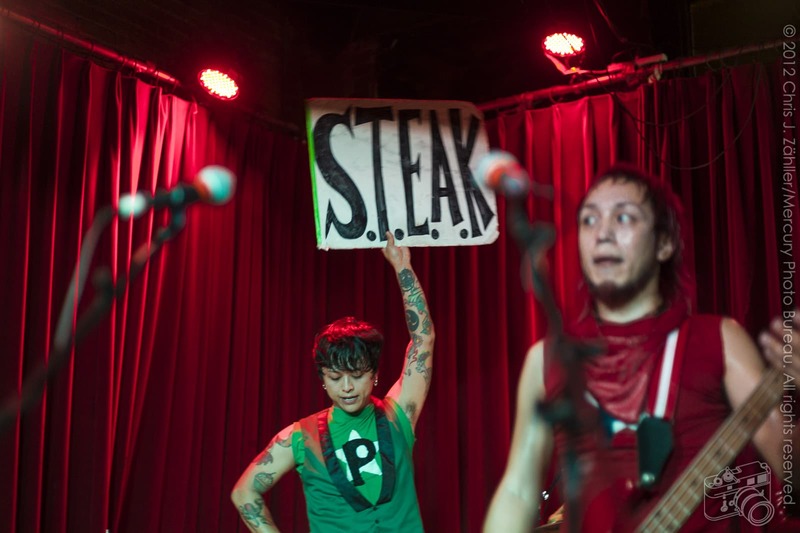 They have good food in Austin. 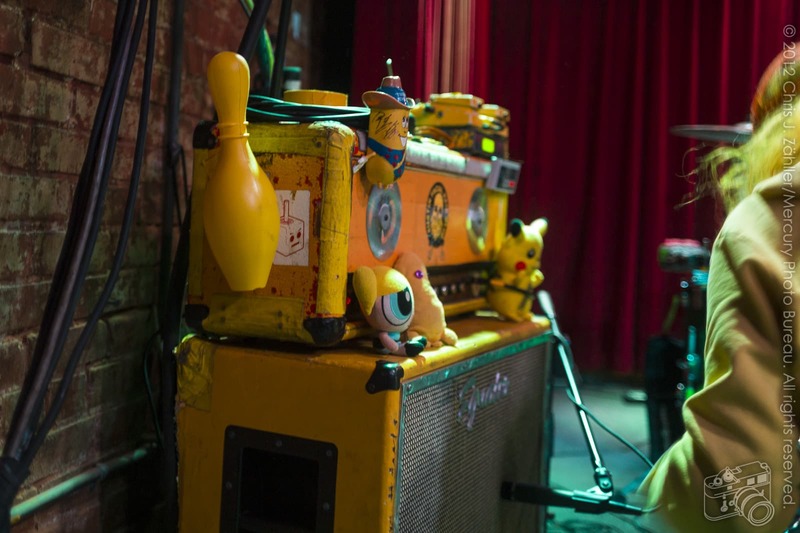 I painted their truck. 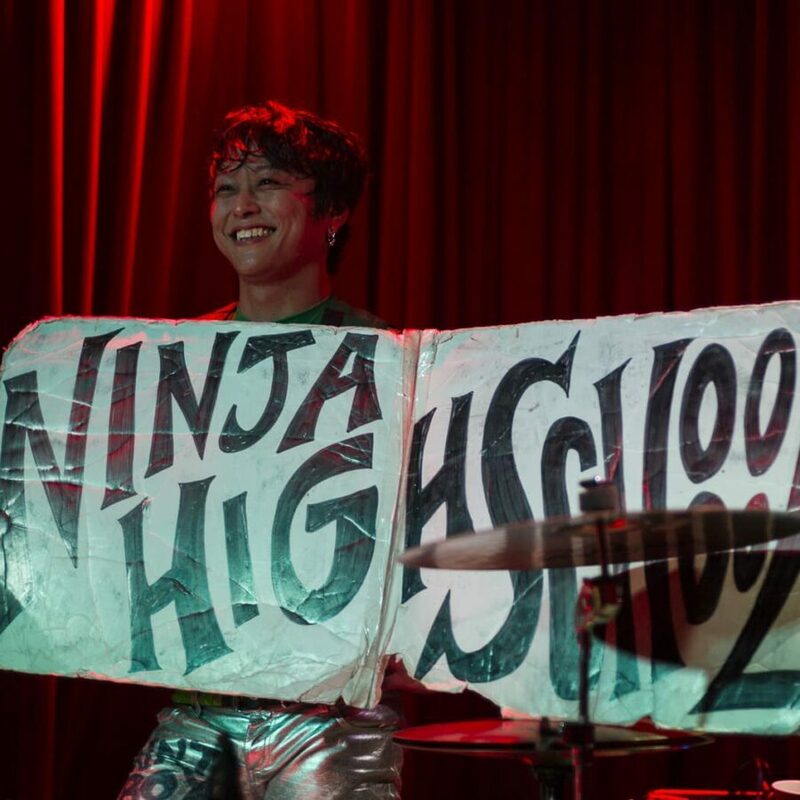 MPBIs Red excited about teach­ing future Ninjas? 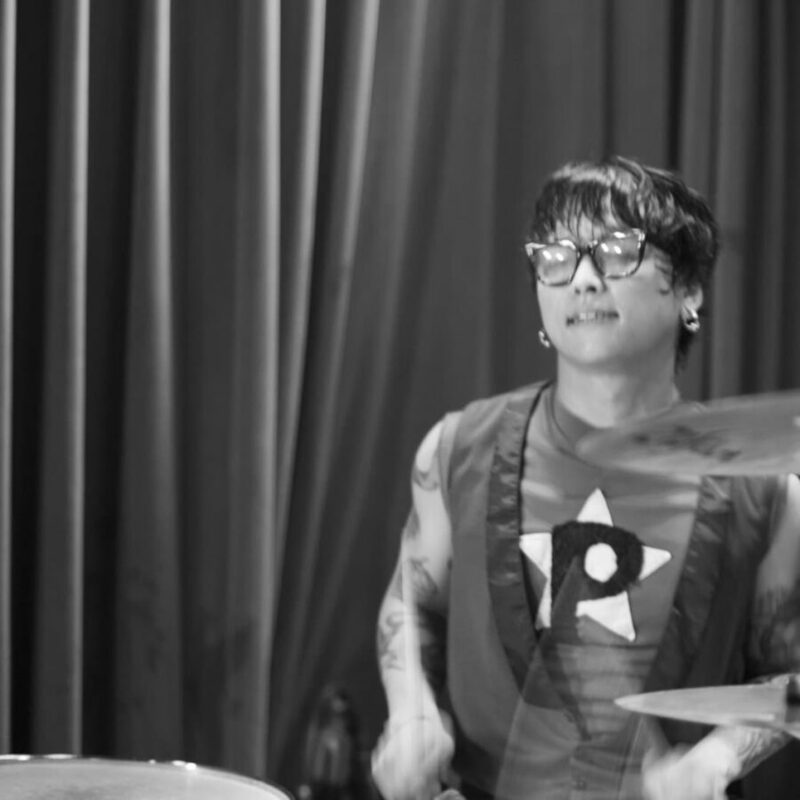 Do you miss him already? 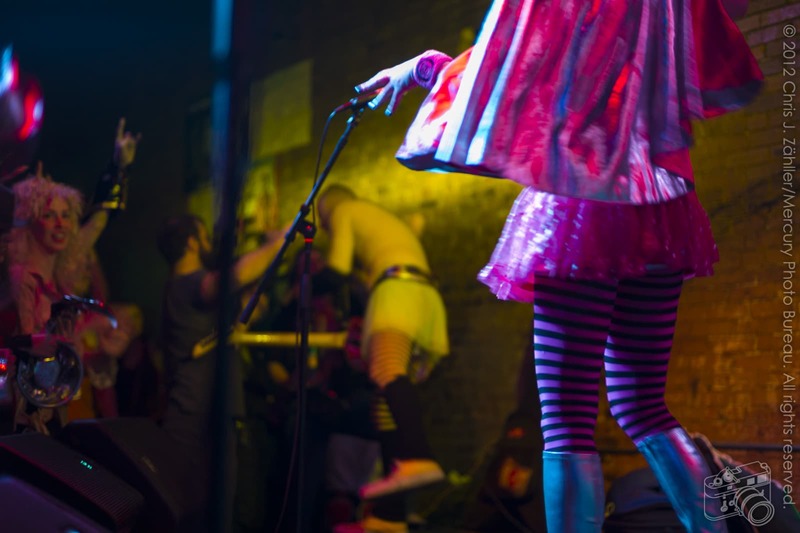 Are you search­ing for a replace­ment? 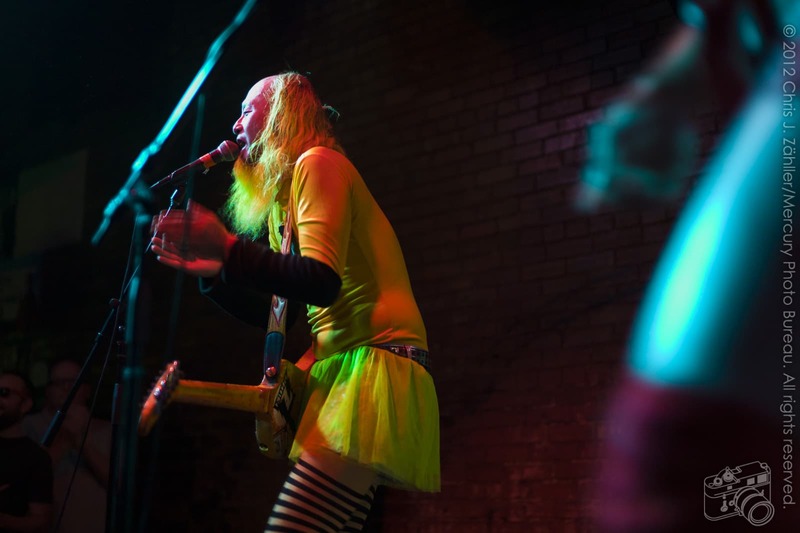 Peelander YellowYes, yes, and we’ll see. 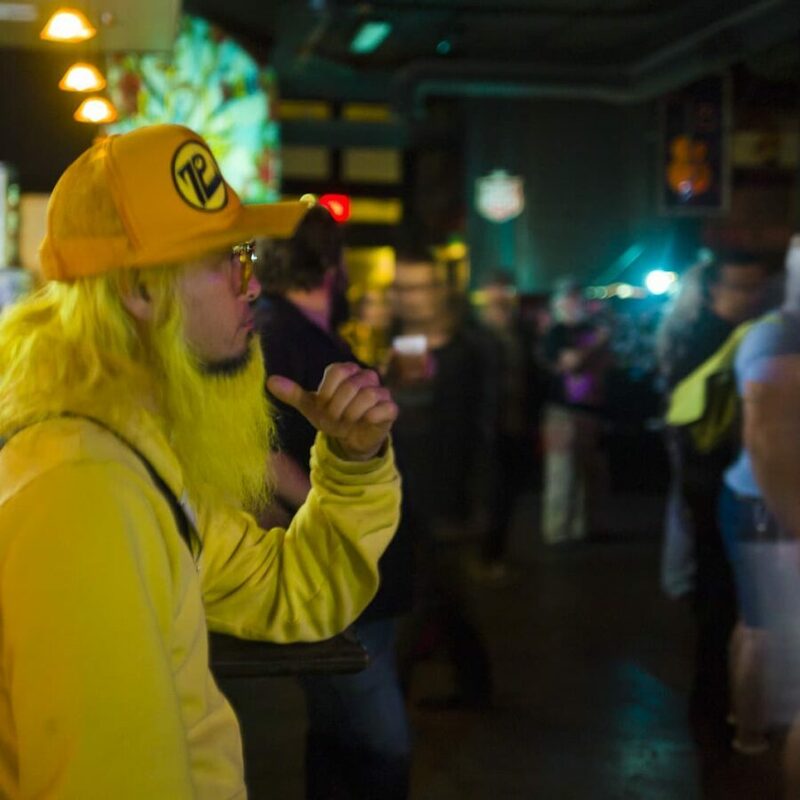 We don’t know right now. 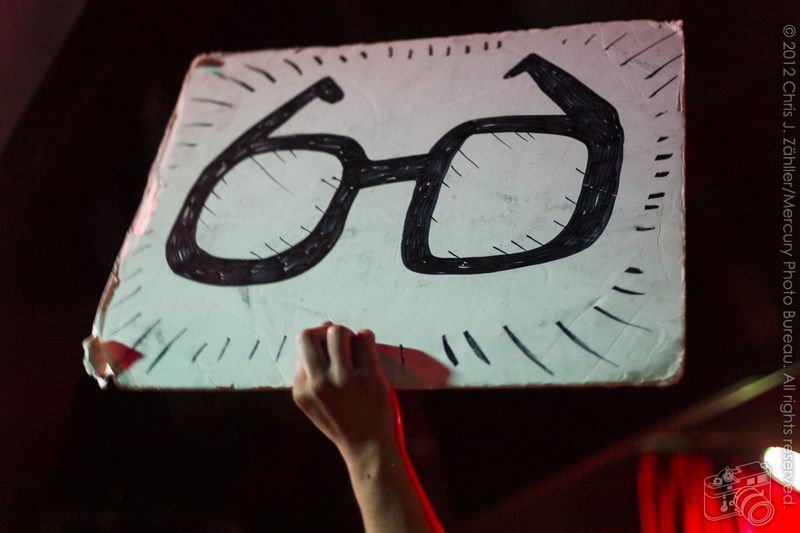 MPBI already have 3 pairs of glasses. 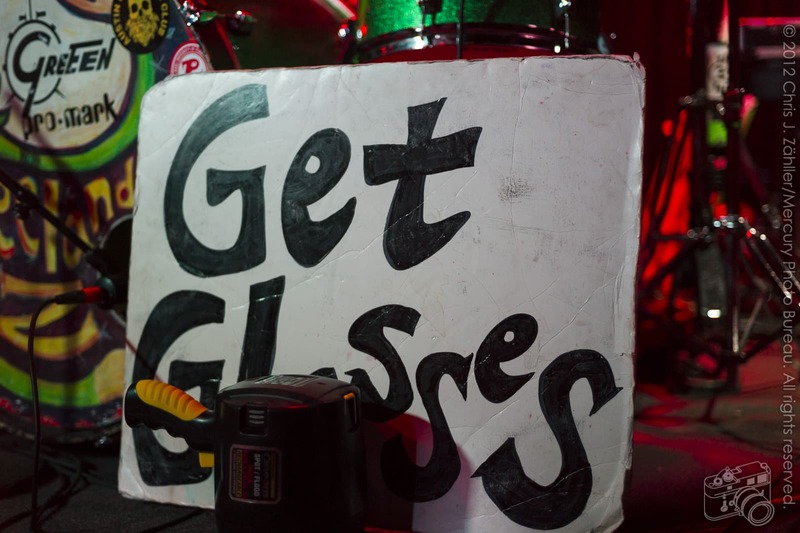 Should I get more? 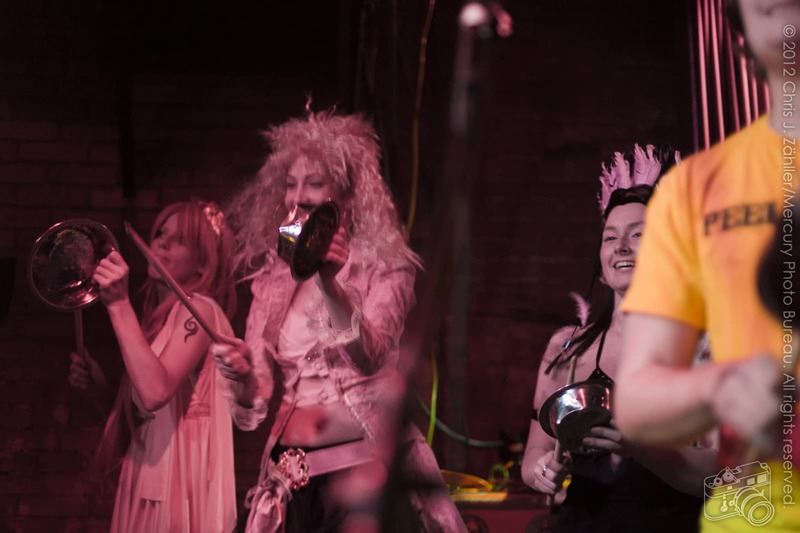 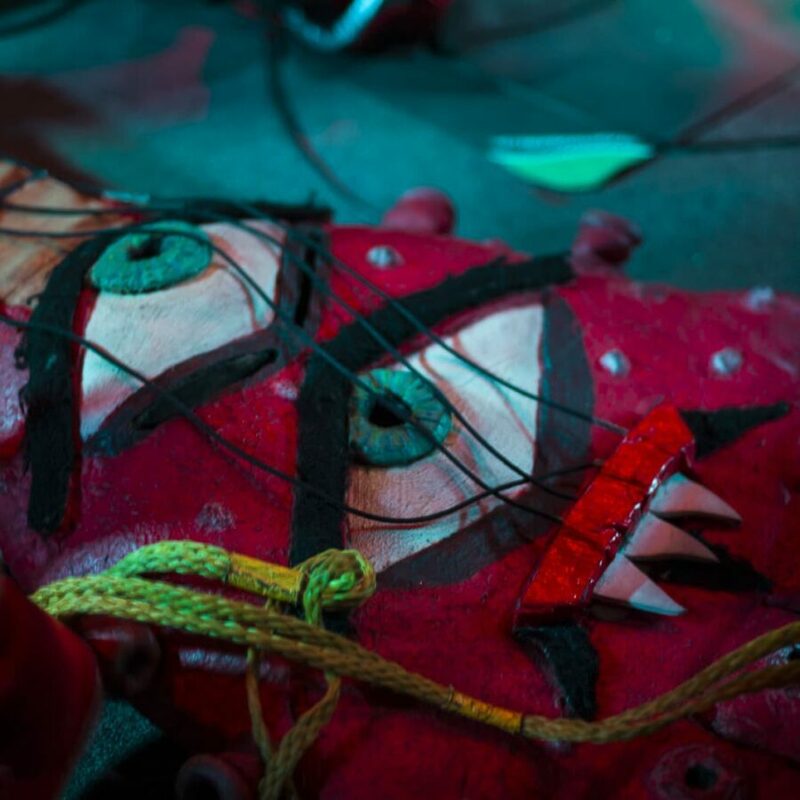 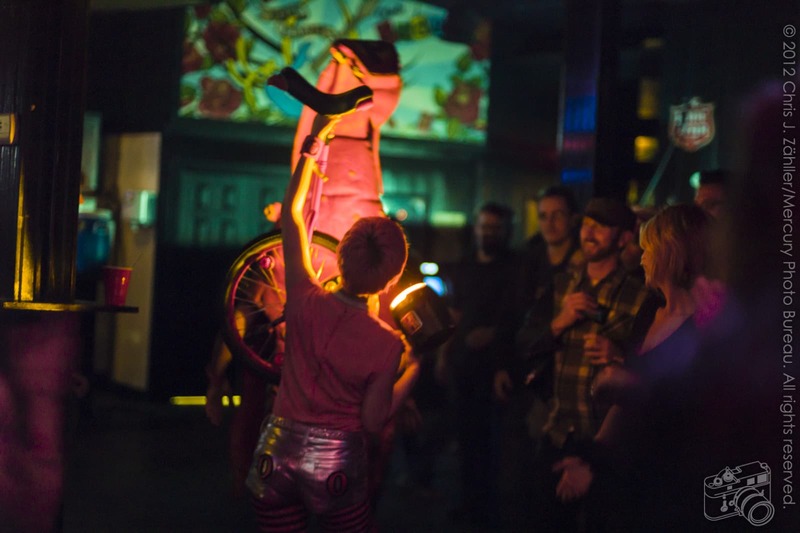 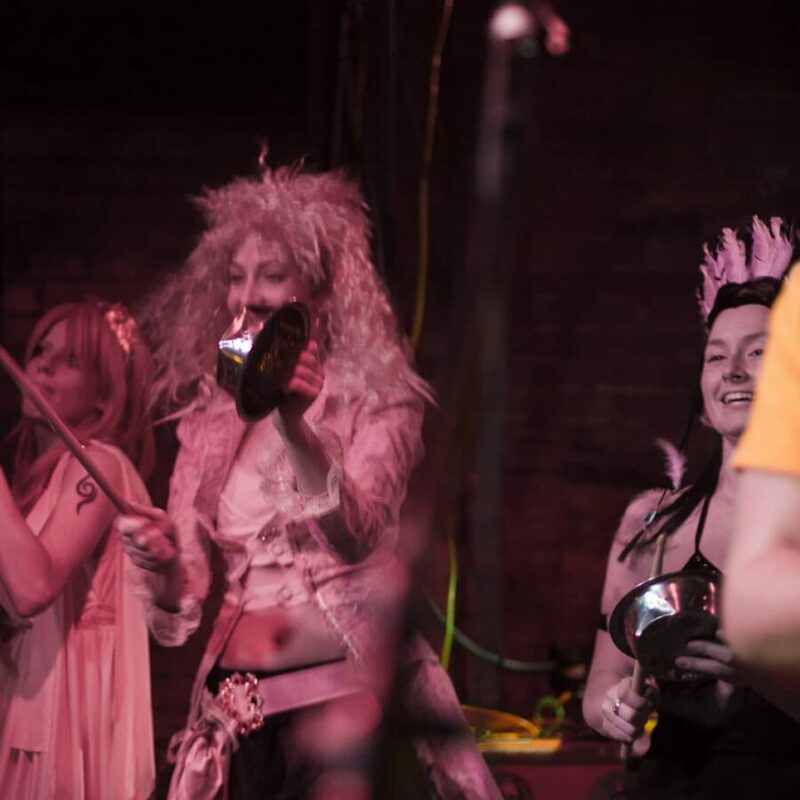 MPBDo you have any­thing spe­cial planned for the Hallowe’en show that you haven’t done before and are not likely to repeat soon? 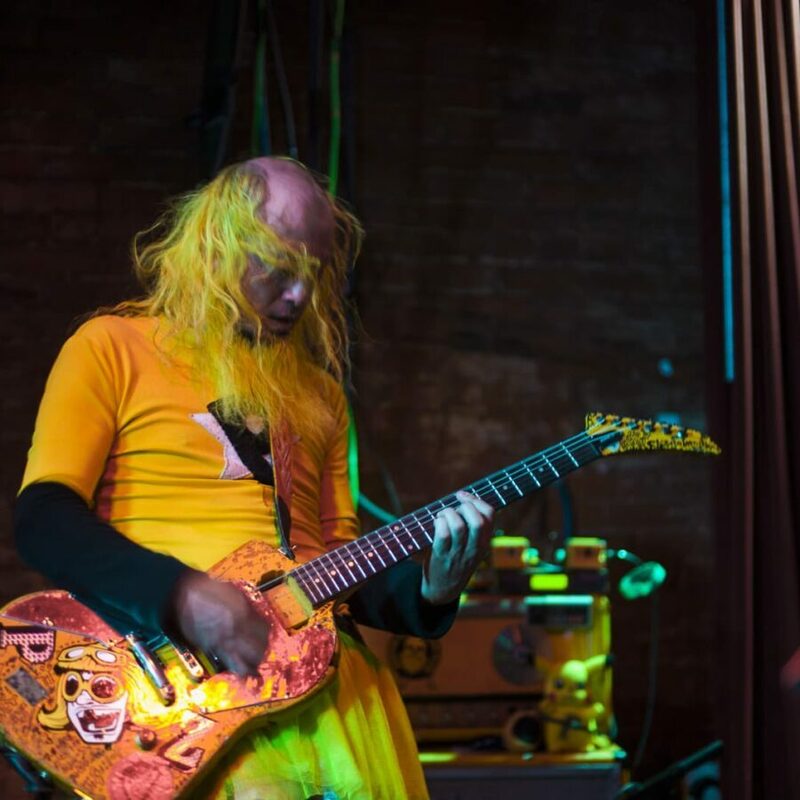 Peelander YellowYou’ll have to come and see! 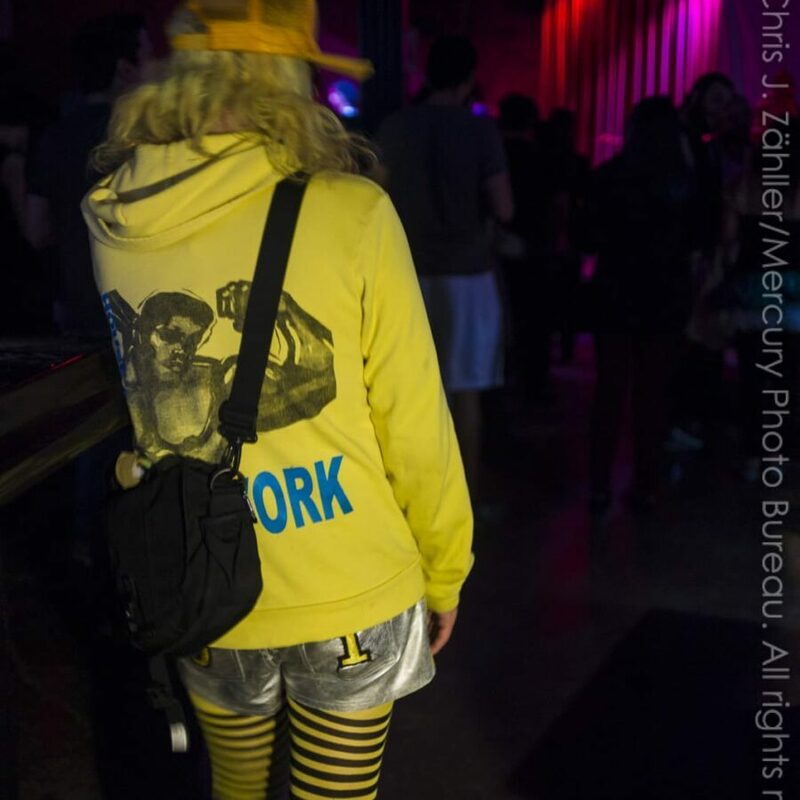 Wear a cos­tume! 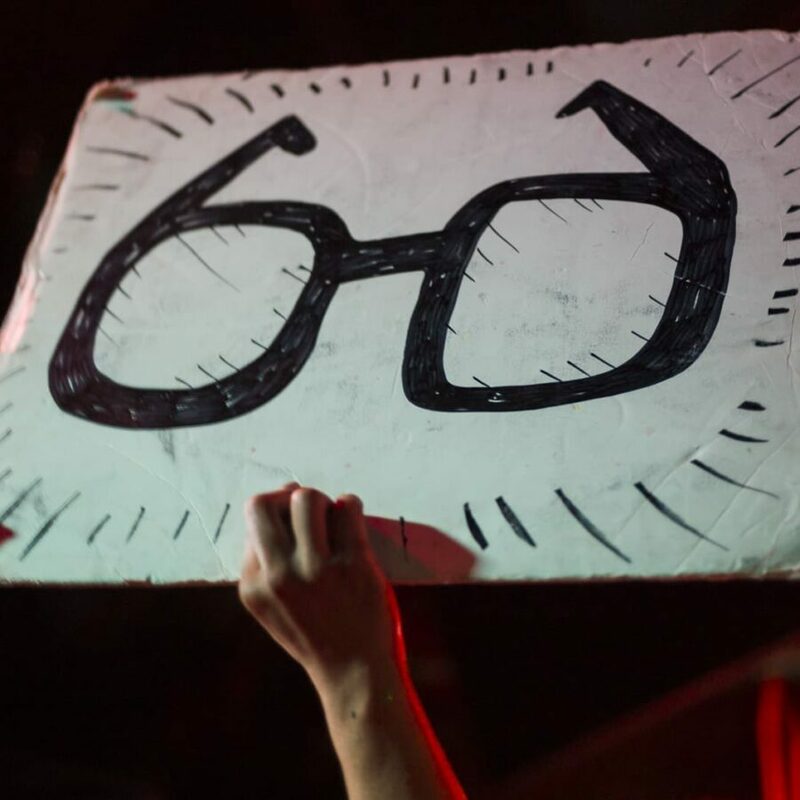 Everybody should wear a cos­tume. 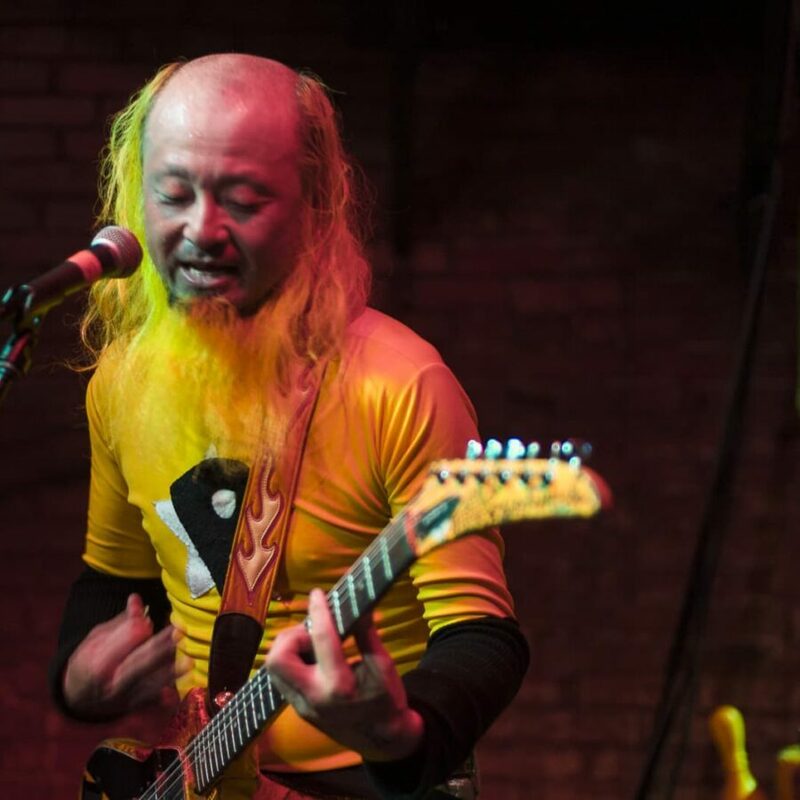 MPBI’ll be wear­ing my Hausu ﻿ House , or ハウス is a 1977 Japanese hor­ror film directed by Nobuhiko Obayashi. 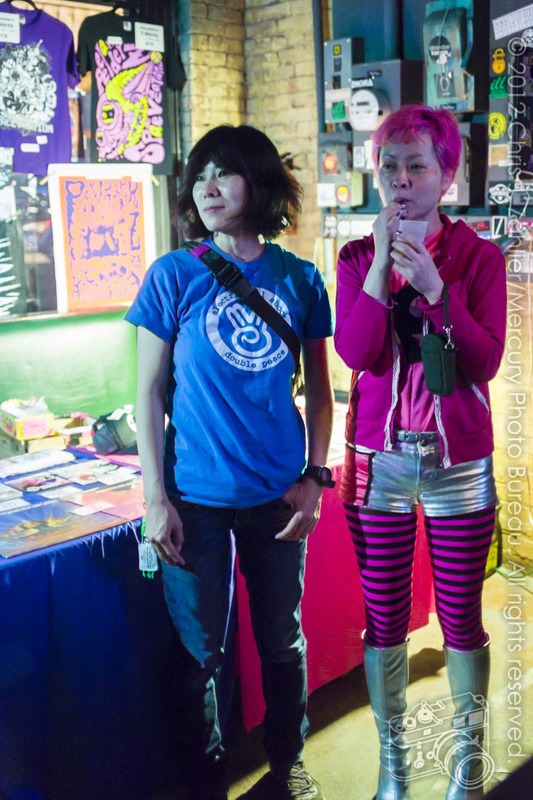 t-shirt and tak­ing pic­tures of you! 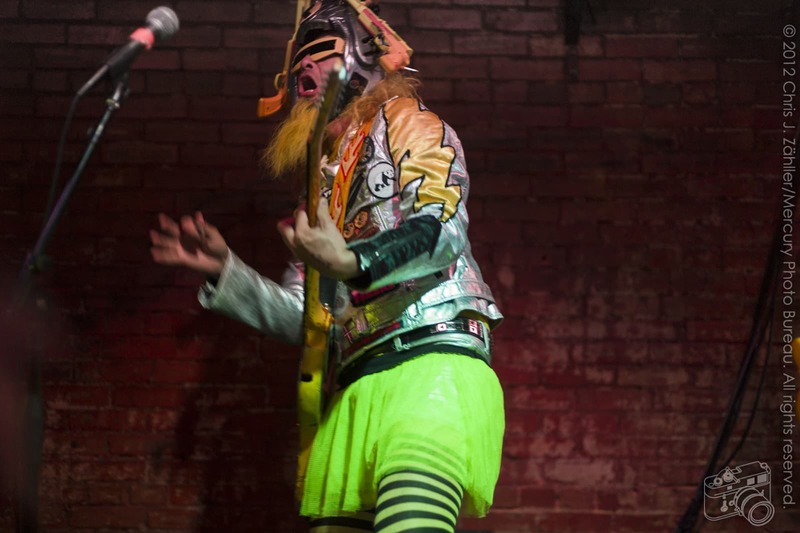 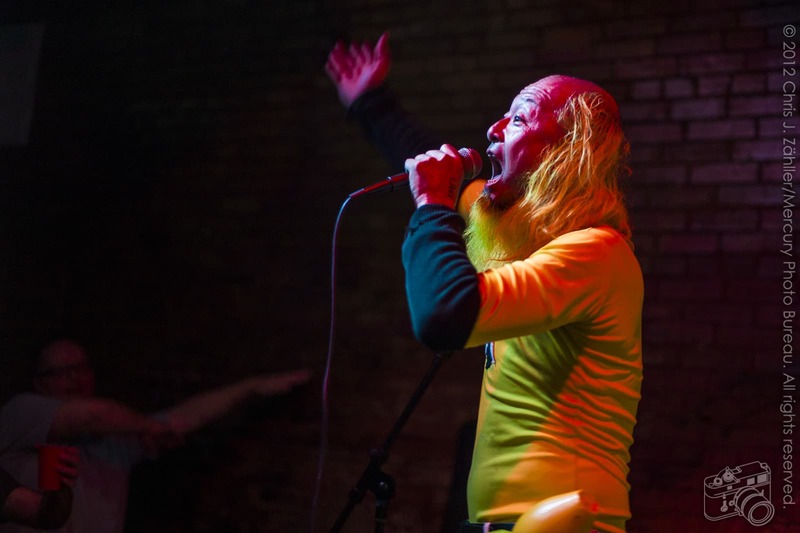 Final ques­tion: Can we expect to see Peelander Black in Dallas? 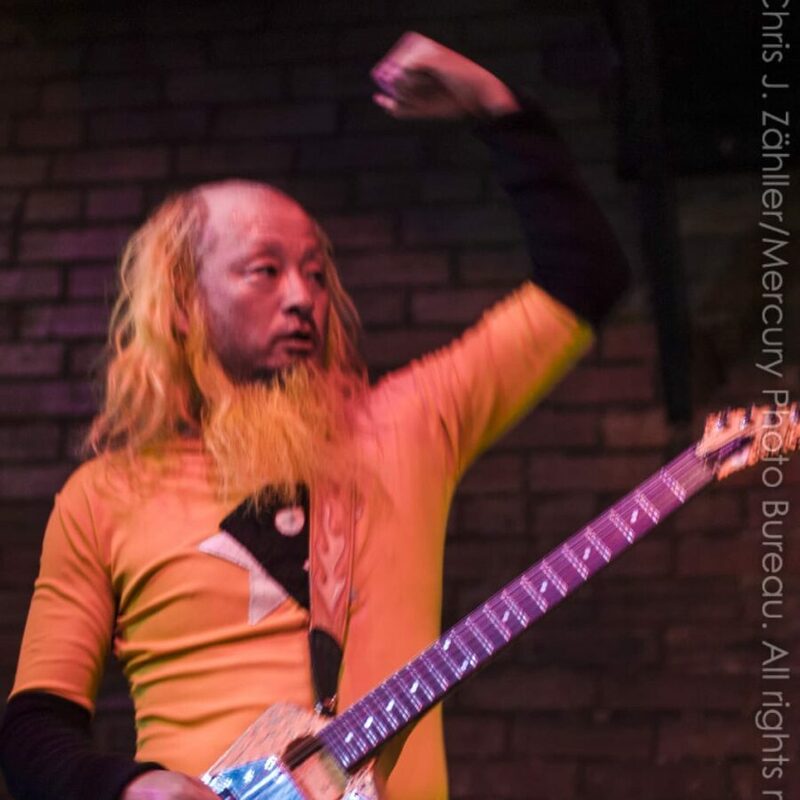 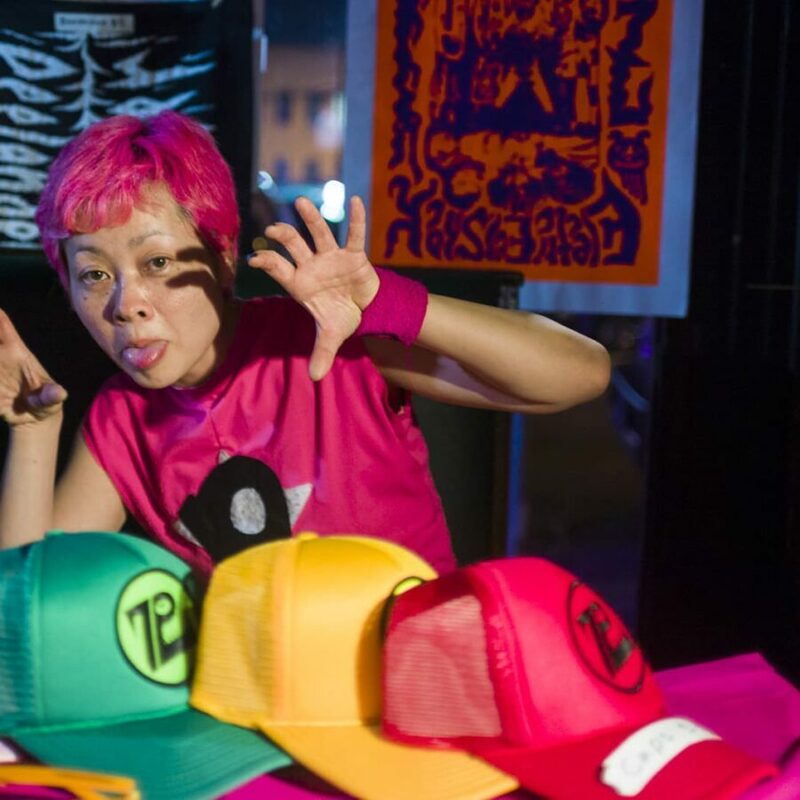 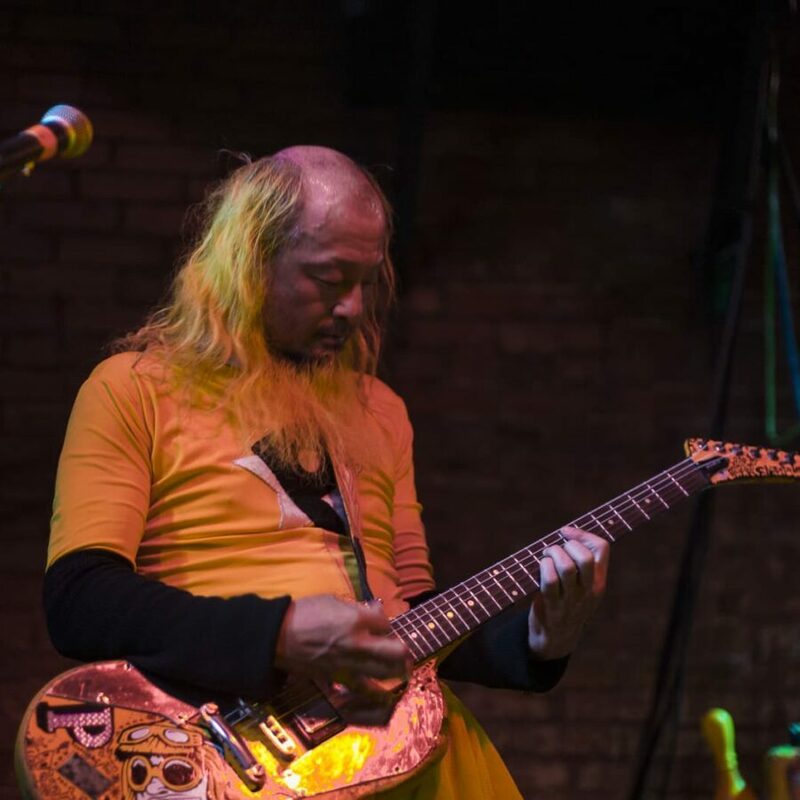 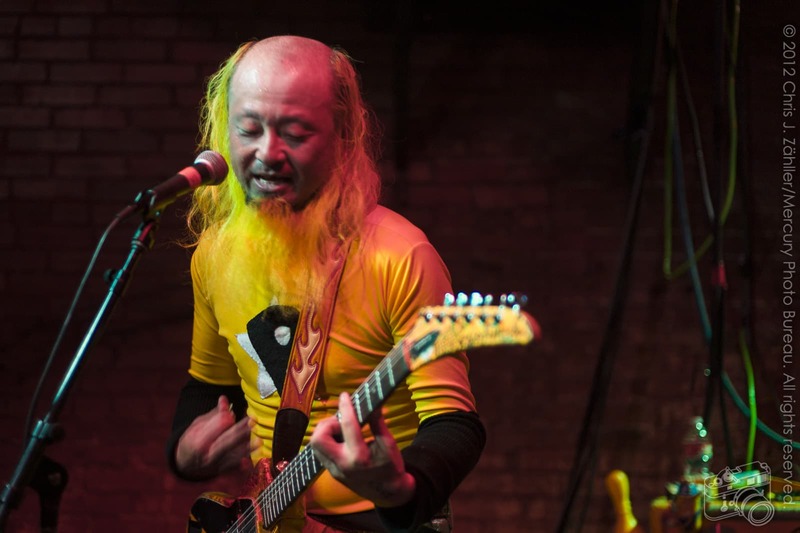 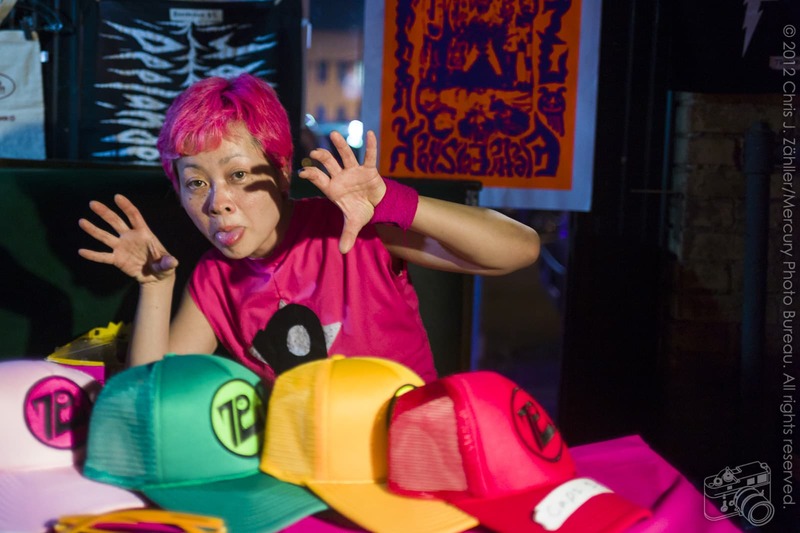 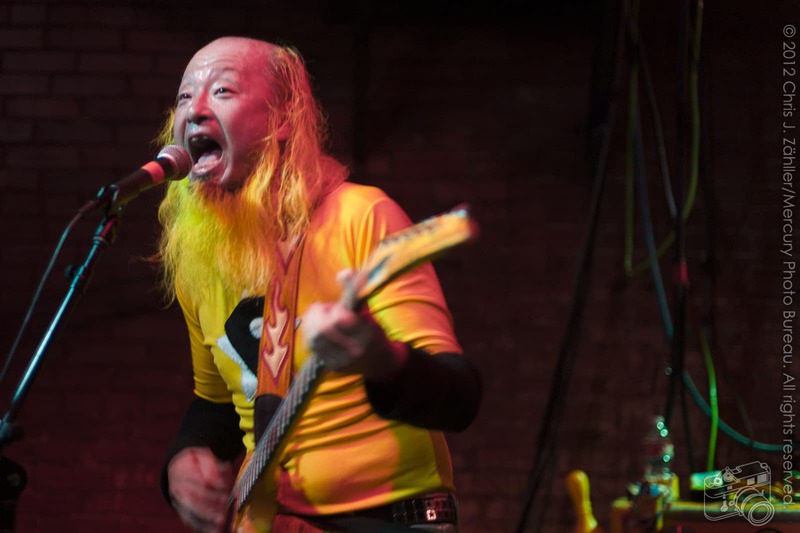 Peelander YellowHe is in Japan right now, but he is fly­ing here. 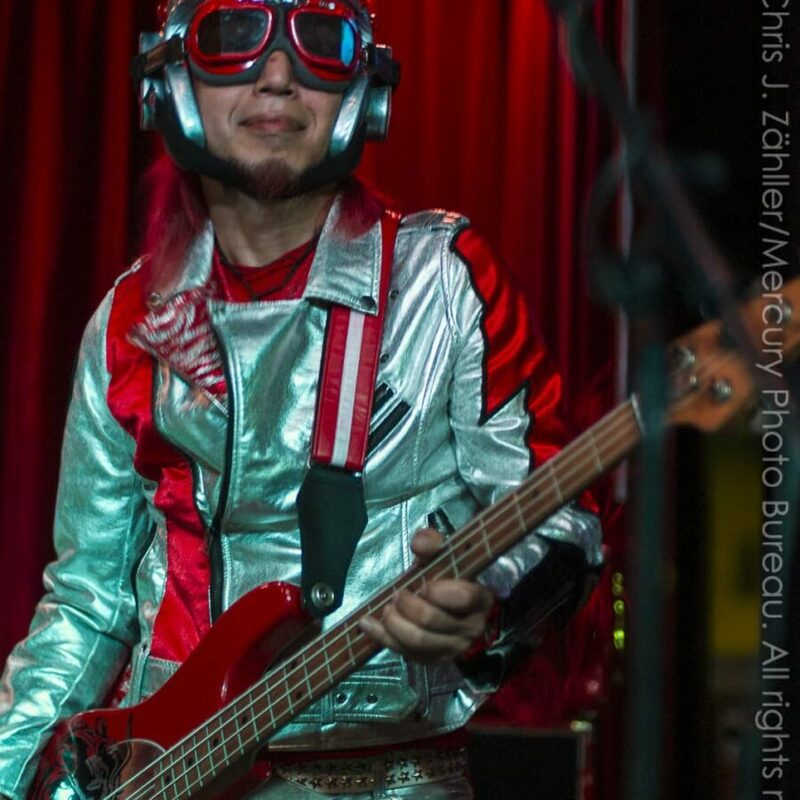 We hope he will be at the Dallas show. 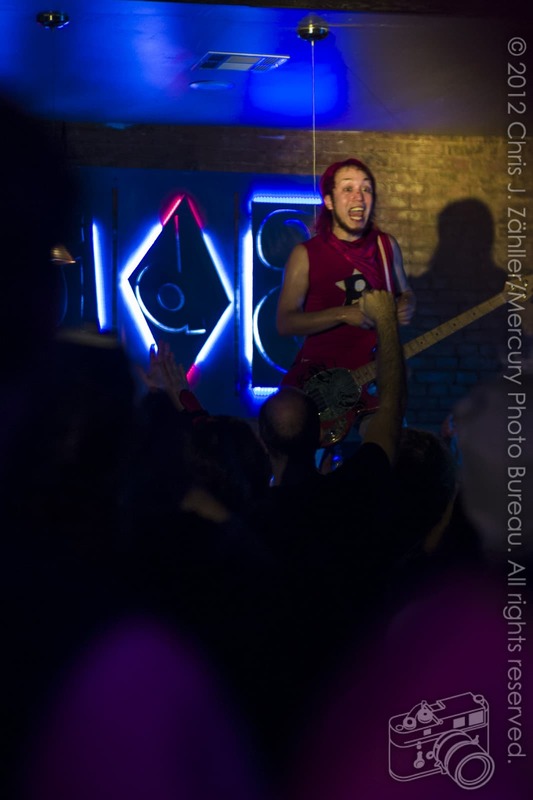 Shooting under stage lights is always a chal­lenge. 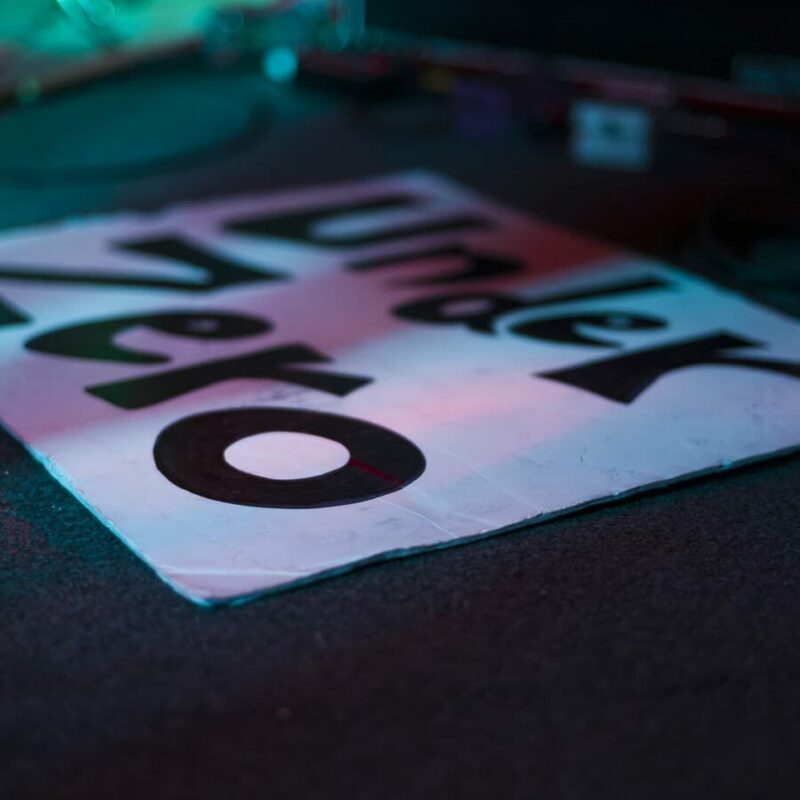 Hardly any of my pic­tures of open­ers Urizen were usable due to a com­bi­na­tion of low light, red LEDs, and the hyper-kinetic move­ment of the band mem­bers them­selves. 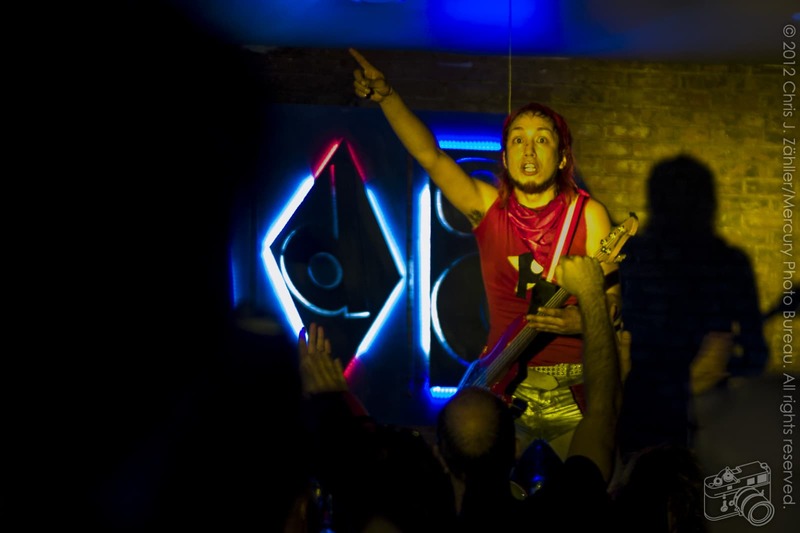 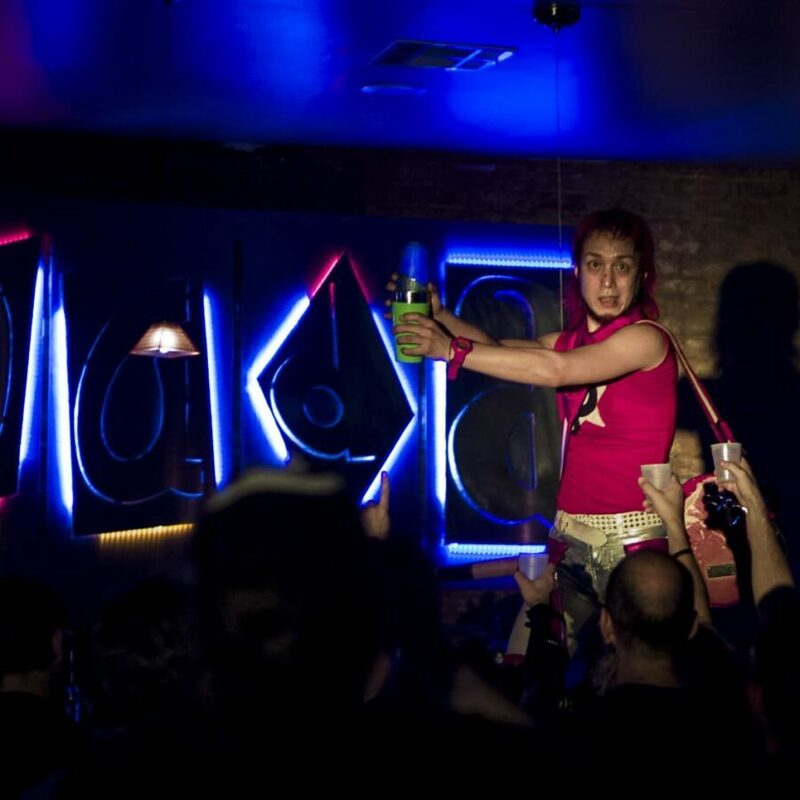 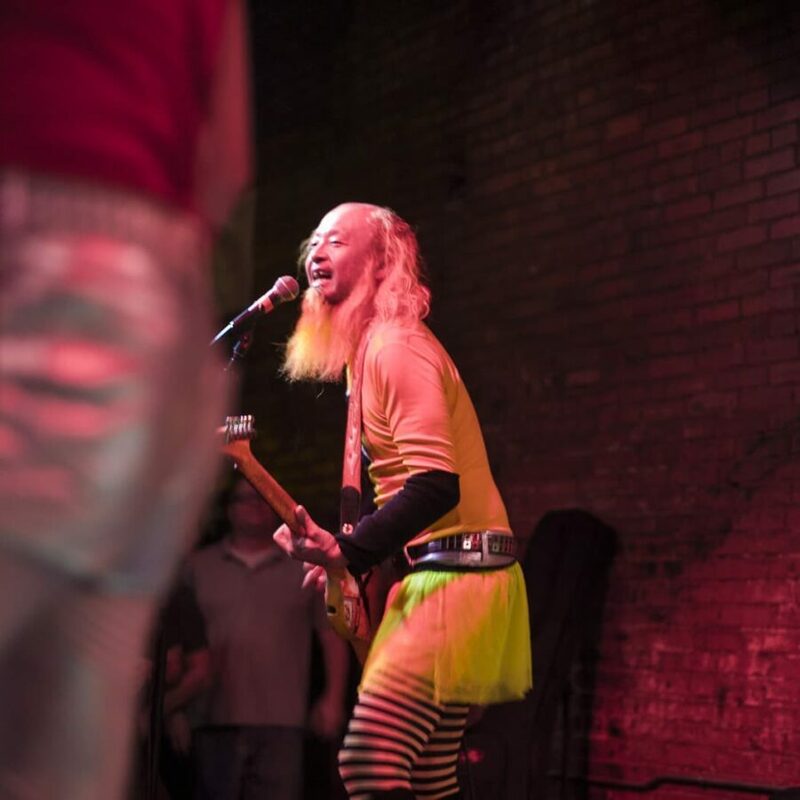 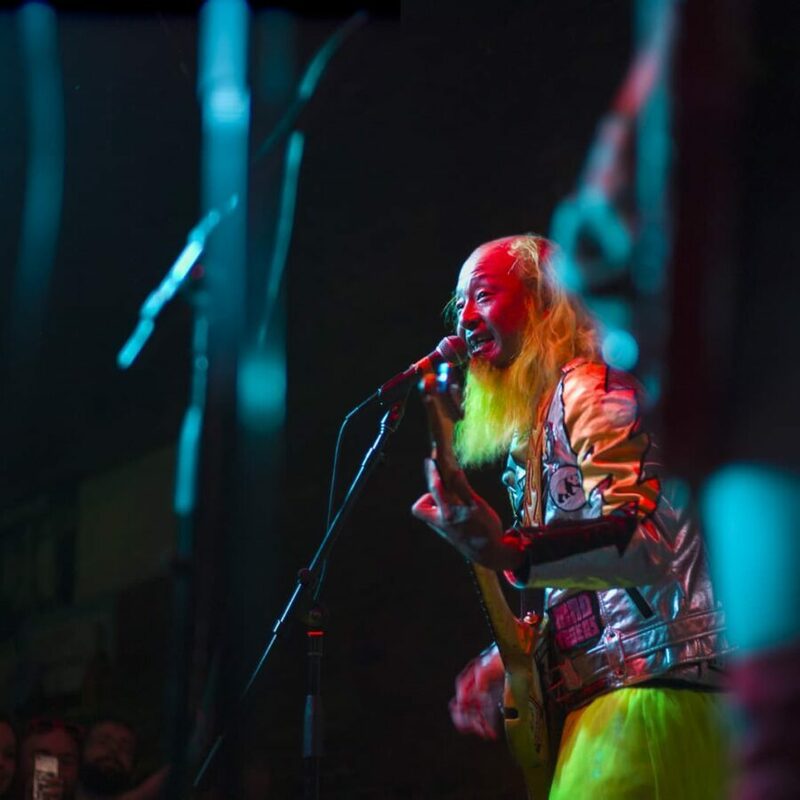 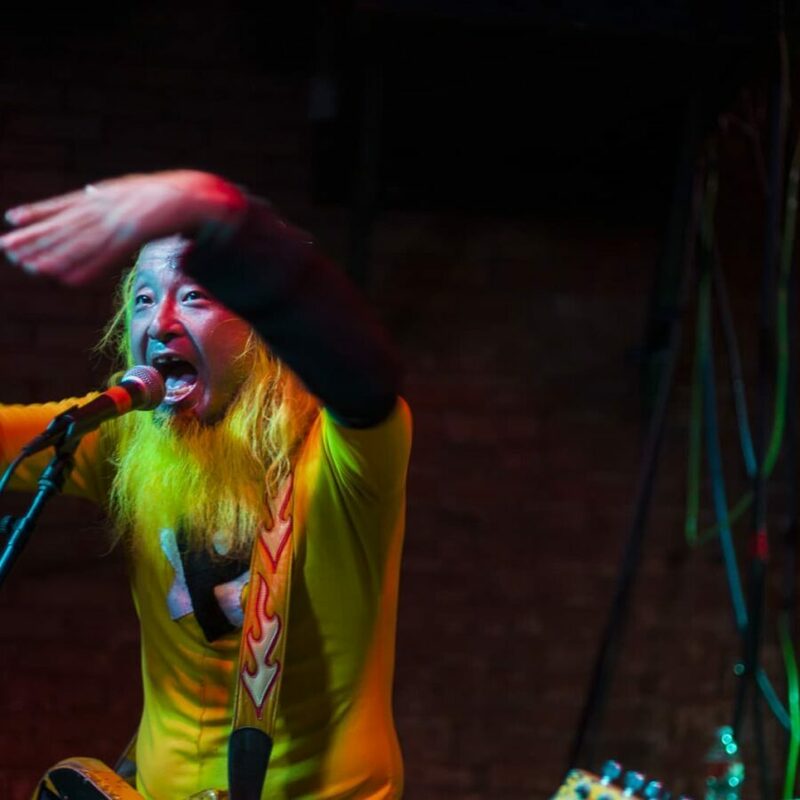 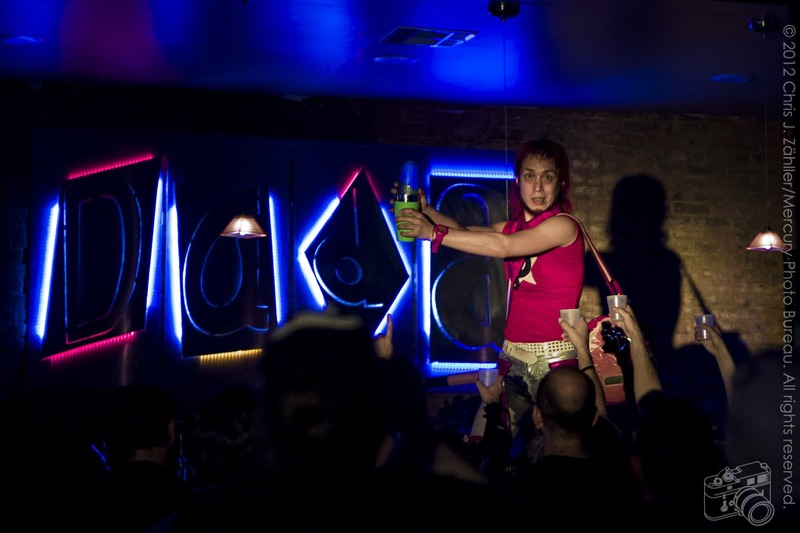 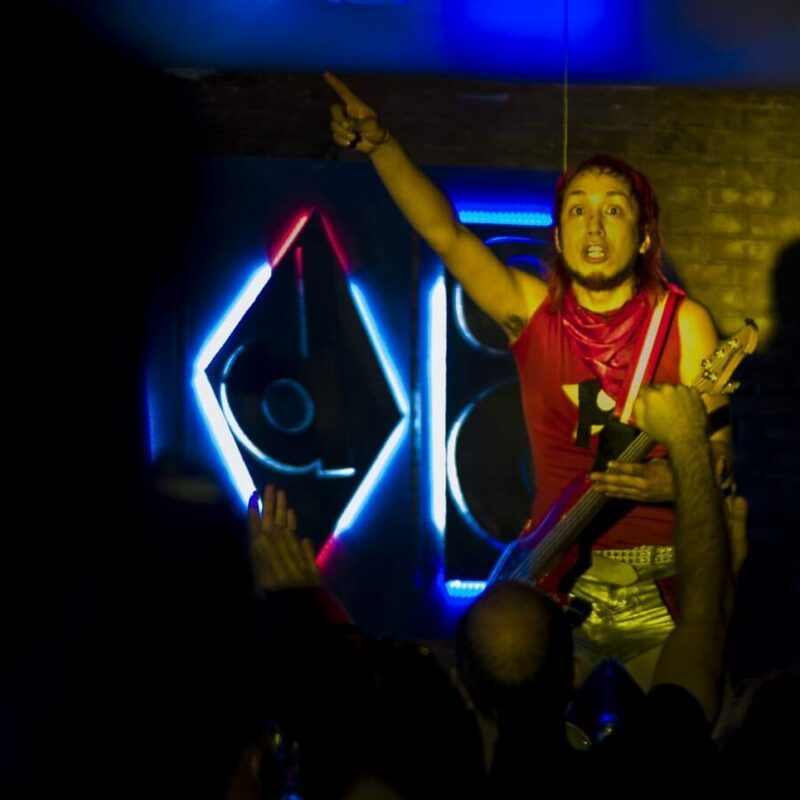 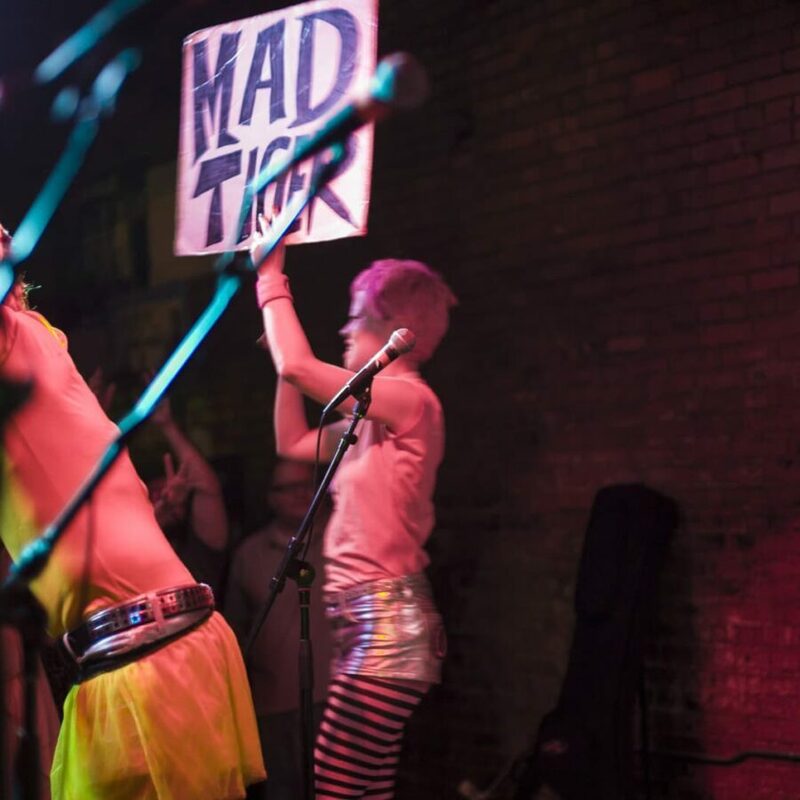 Peelander-Z had the advan­tage of being brightly lit; also, I spoke to the house light­ing direc­tor before their set and ensured the band would be lit with white dur­ing their 1st song. 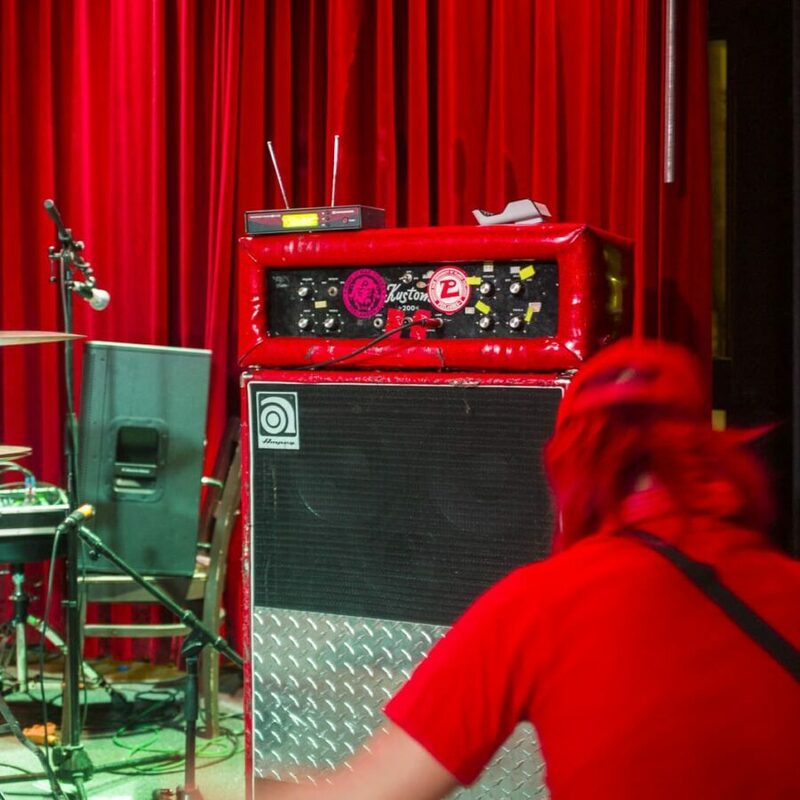 Nonetheless, color tem­per­a­tures were incon­sis­tent, and blue and red LEDs cast weird shad­ows on the band through­out their set. 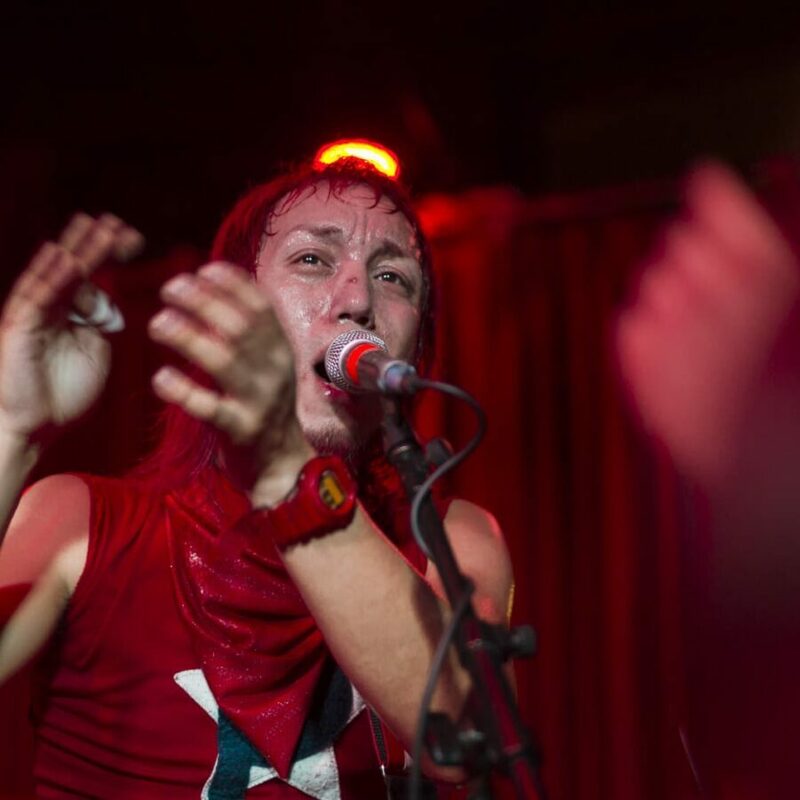 What you see below is the result of lots of man­ual cor­rec­tion in Adobe Lightroom to min­i­mize these arti­facts; selec­tive reduc­tion of the red chan­nel and occa­sional use of gra­di­ent fil­ters helped make the images appear more ‘nat­ural.’ Even so, some pic­tures only looked right when con­verted to B+W; in color, all detail would have been lost in a sea of red.